Mayor Hazel McCallion, C.M., LL.D. 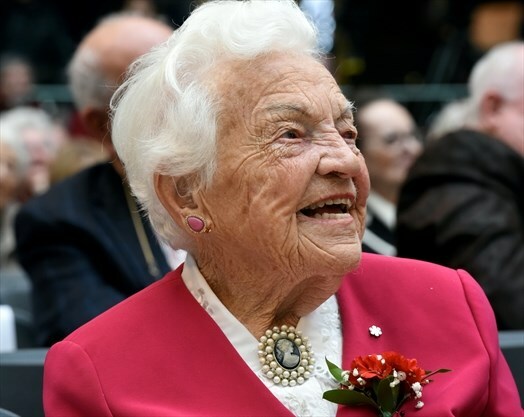 This web page is an attempt to preserve information about the remarkable Hazel McCallion, née Journeaux, CM (born February 14, 1921), nicknamed "Hurricane Hazel", Mayor of the City of Mississauga for 36 years, from 1978 to retirement in 2014. Note: The Order of Canada is composed of three ranks of membership: Members (Members of the Order of Canada), Officers (Officers of the Order of Canada), and Companions (Companions of the Order of Canada). Members are entitled to use post-nominal: "C.M." McCallion did not run for re-election in 2014. Since her departure from politics, she has been appointed chancellor of Sheridan College and special advisor to the principal of the University of Toronto Mississauga. She has also become an outspoken advocate for seniors, and against discrimination towards the elderly." View Hazel McCallion's signature posted on Wikimedia Commons. Hazel McCallion - Politician from Famous Birthdays. Birthday: February 14, 1921. Birthplace: Canada. Age: 97 years old. Birth Sign: Aquarius. Before Fame: She worked for Kellogg cereal company before starting her political career in the late 1960s. Trivia: She was elected to her 12th term as Mayor in October 2010. Current Mayor's Office. Current Mayor and Council. "Hazel McCallion was first elected Mayor of Mississauga in November, 1978, and is the longest serving Mayor in the City's history. She was acclaimed in 1980, re-elected in 1982 and 1985, acclaimed again in 1988 and re-elected in 1991, 1994, 1997, 2000, 2003, 2006 and 2010. Mayor McCallion was born in Port Daniel on the Gaspe Coast of Quebec and educated in Quebec City and Montreal. She then began her career in Montreal with Canadian Kellogg, an engineering and contracting firm, and was transferred to Toronto in 1942 to help set up the local office. Mayor McCallion was involved in many projects including the Lakeview Generating Station, the British American refinery in Clarkson, the first synthetic rubber plant in Sarnia and the pilot project for the tar sands in Fort McMurray, Alberta. Mayor McCallion remained with the company for 19 years. In 1967 she decided to leave the corporate world and devote her career to politics. 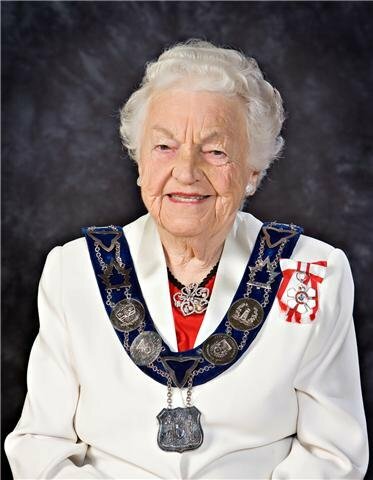 Mayor McCallion was named as a new member of the Streetsville Planning Board in 1964 and served as Chair of the Board in 1966 and again in 1968. Later that same year, she became Deputy Reeve of Streetsville. Mayor McCallion was appointed Reeve, and then elected as Mayor of Streetsville in 1970, serving until December, 1973. When the Region of Peel was established in 1974, Mayor McCallion was elected to the Mississauga and Peel Regional Councils. She served two terms as a Councillor prior to her mayoral campaign in 1978. By the time she was elected Mayor, she had sat on virtually every committee at the Region of Peel and the City of Mississauga. She has also served on the executive of many federal and provincial committees and associations, including President of the Association of Municipalities of Ontario (AMO) from 1978 - 79. She is now in her twelfth term as Mayor. In 1991, Mayor McCallion became the first Mayor of a major municipality to submit the annual operating budget to residents for their input and scrutiny. She is also among the first mayors of major municipalities to be openly committed to a pay-as-you-go philosophy. The City has not had to borrow money since 1978 and is currently debt-free. Mayor McCallion also established the Greater Toronto Area (GTA) Mayors' Committee in 1992. She brought together the 30 GTA Mayors, later adding the Chair of Metro Toronto and the four Regional Chairs to work co-operatively for the economic promotion of the GTA. From 1992 to January 2000, the Committee, chaired by Mayor McCallion, was a strong voice on key issues affecting the future of the GTA. As part of that effort, she is a founder and Honorary Co-chair of the Greater Toronto Marketing Alliance. In 1996, Mayor McCallion was appointed to the "Who Does What" Panel established by the Province to review the delivery and funding of government services. She was also appointed to two sub-panels: Assessment and Property Taxation Reform, and Emergency Services. In addition, the Mayor represented the Association of Municipalities of Ontario (AMO) on the Electricity Transition Committee for the Ministry of Electricity, Science and Technology. In February 2002, Mayor McCallion was appointed Chair of the Central Ontario Smart Growth Panel by the Hon. Chris Hodgson, Minister of Municipal Affairs. The panel, made up of 22 local government officials and business leaders, advised the provincial government on how to plan for growth for the central region in both the short and long term. In addition to the pressing issue of growth, the panel looked at other issues including gridlock and waste disposal. The panel, the largest in the province, includes the cities of Brantford and Kawartha Lakes, the Counties of Dufferin, Simcoe and Peterborough, the Regions of Niagara, Waterloo, Halton, Peel, York and Durham, as well as the City of Toronto. 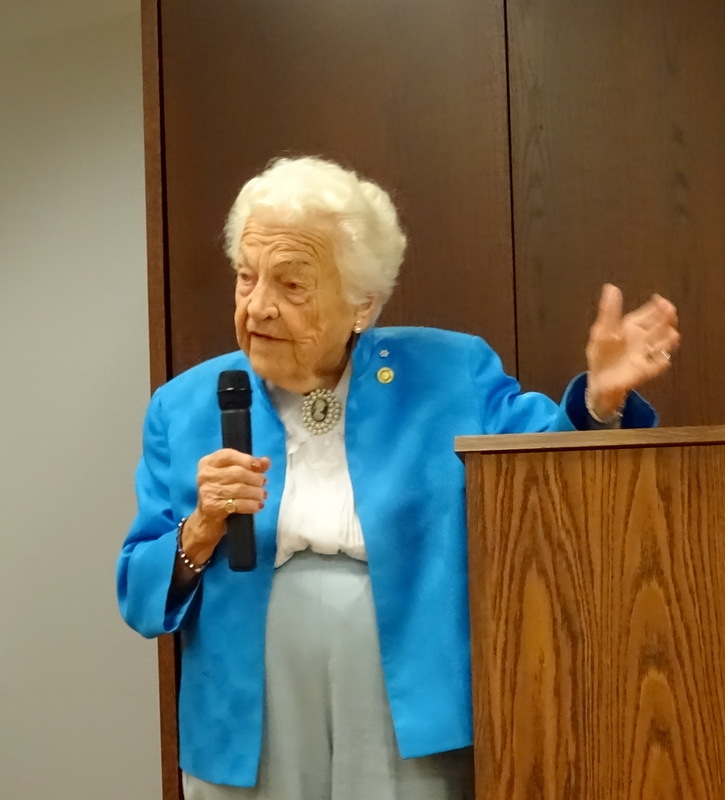 Mayor McCallion has played a leading role for women in politics. She is the first woman to hold such significant positions as President of the Streetsville and District Chamber of Commerce; President of the Anglican Young Peoples' Association of Canada; Mayor of Streetsville and Mayor of Mississauga. She was chosen one of the "American Women of the Year" in Who's Who of American Women (which refers to North American women). Mayor McCallion also holds Germany's highest individual honour, the Cross of the Order of Merit of the Federal Republic of Germany, for her role in bringing German companies to Canada. In addition, Her Worship has been awarded the Paul Harris Fellowship by Rotary International in 1985 and 1992, awarded the Lions International President's Award, awarded the Helen Keller Fellowship from the Mississauga Lions Clubs and named a Melvin Jones Fellow for dedicated humanitarian services by Lions Clubs International. 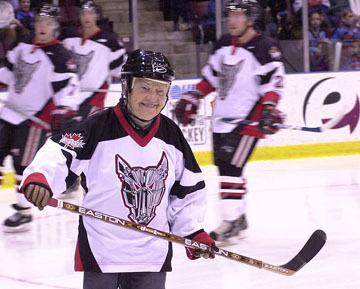 In 2001, Mayor McCallion was inducted into the Mississauga Sports Hall of Fame and presented with a special Award of Excellence in celebration of the Mississauga Board of Trade's 25th Anniversary. In January 2003, Mayor McCallion received the Canadian Family Values Award from the Church of Jesus Christ of Latter-day Saints. In September 2003, Mayor McCallion received one of the top leadership awards from the International Economic Development Council (IEDC) for her leadership and dedication to addressing economic development issues in Mississauga. In 2004, Mayor McCallion became a finalist for the title World Mayor 2004, joining some 50 mayors from Africa, the Americas, Asia and Europe. The competition intends to raise the profile of mayors worldwide, as well as honour those who have served their communities well and who have contributed to the well-being of cities, nationally and internationally. 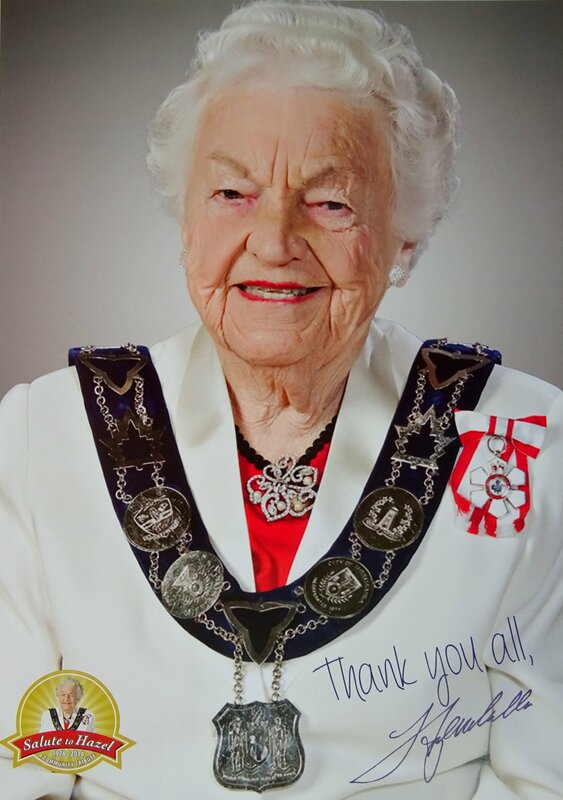 In 2005, Mayor McCallion was invested as Dame in the Sovereign Order of Saint John of Jerusalem, Knights of Malta, the Hereditary Order. In May, she was honoured with an award from the Province of Ontario in recognition of her more than 30 years of service as a municipal elected official. The Mayor's accolades continued in 2005, as Mayor McCallion was appointed Member of the Order of Canada and received her Insignia of Member of the Order of Canada at a ceremony held at Rideau Hall on November 18, 2005. Then on December 5, 2005 it was announced that Mayor McCallion was the runner up to Mayor Dora Bakoyannis of Athens, Greece for World Mayor 2005. In early 2006, Mayor McCallion was recognized as the CNW Communicator of the Year by the Toronto Chapter of the International Association of Business Communicators (IABC). Mayor McCallion has also been recognized by Reader's Digest as the Best City Mayor in their June 2006 issue featuring "Canada's 30 Best". In September, Mayor McCallion was named a Professional Land Economist by the Association of Ontario Land Economists. 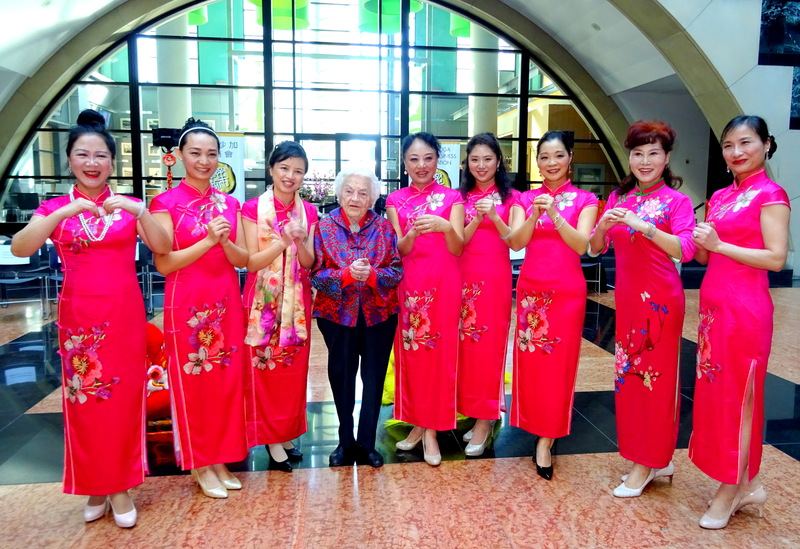 Mayor McCallion was also honoured by the Yee Hong Community Wellness Foundation with their 2006 Golden Achievement Award. 2006 wrapped up in award winning style, as the City of Mississauga and the Healthy City Stewardship Centre were awarded the 2006 World Leadership Award for the Stewardship Centre Initiative and the Healthy Mississauga 2010 Plan. In March of 2007, Mayor McCallion was named a member of the Metrolinx Board of Directors. In April, Mayor McCallion was presented with the inaugural President's Award by the Professional Engineers of Ontario during their annual Order of Honour Awards Gala Ceremony. In May, Mayor McCallion was recognized by Hockey Canada at their Annual General Meeting with their Female Breakthrough Award. June saw Mayor McCallion receive the EVE Award, for her contribution of more than 30 years of service to public life by the Board of Directors of Equal Voice and the Canadian Club. In September, Mayor McCallion was one of eight finalists for the JoAnna Townsend Award, which honours a woman who helps women entrepreneurs achieve success in international business. 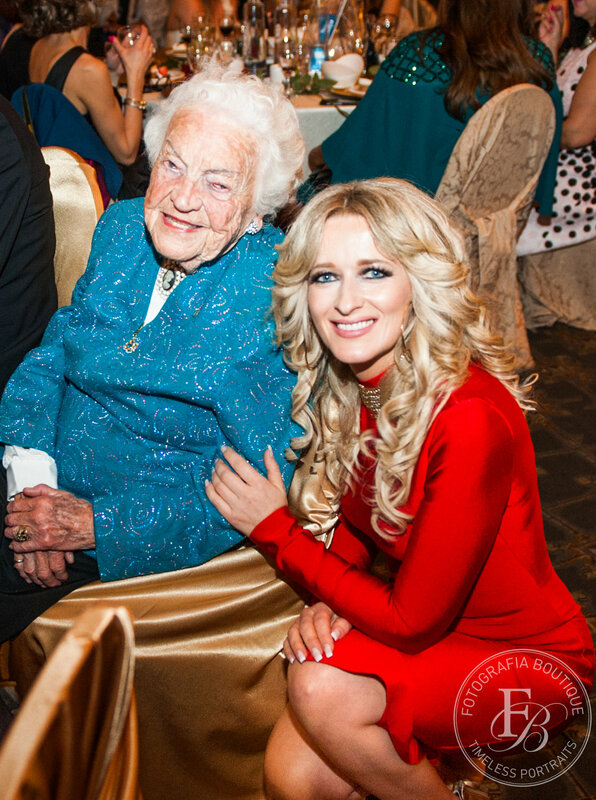 In November, Mayor McCallion was named 2007 Canada's Most Powerful Women: Top 100 by the Women's Executive Network and was awarded with a Trailblazers and Trendsetters award. In January of 2008, the Mississauga Chapter of Scouts Canada awarded Mayor McCallion with the Centennial Medal in honour of her support to scouting. At the annual Federation of Canadian Municipalities Conference in May, Mayor McCallion was honoured with an award for outstanding service in municipal politics. October saw Mayor McCallion honoured by the Ontario Municipal Administrators' Association with the Robert Baldwin Award. This award recognizes a career of achievement and service in the field of municipal administration, significant and lasting contributions to municipal and local government in Ontario, and service to the community, Ontario and Canada by those who work in municipal government. Mayor McCallion is the first elected official to receive this award. On October 16, Mayor McCallion was honoured by Enersource with the naming of a Municipal Substation after her. 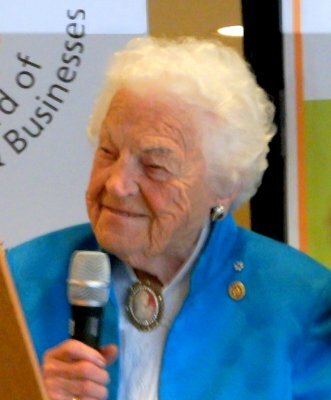 On February 24, 2009, Mayor McCallion was honoured by The Biotechnology Initiative with the Community Service Award for her support of the Life Sciences sector in Mississauga. On June 5, Mayor McCallion was honoured by the Canadian Urban Institute with the 2009 Urban Leadership Award in the City Prosperity Category. 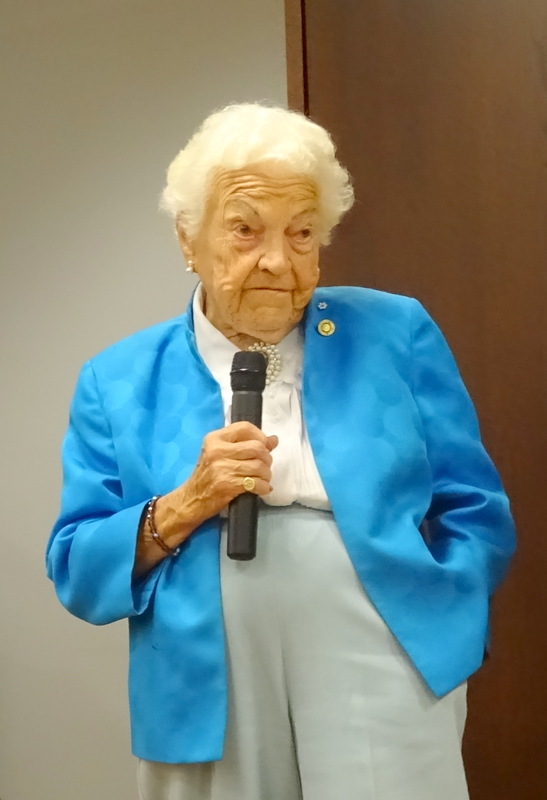 In August, Mayor McCallion was commissioned as a Kentucky Colonel by the Commonwealth of Kentucky for the Mayor's contribution to society and an ambassador of good will and fellowship around the world. 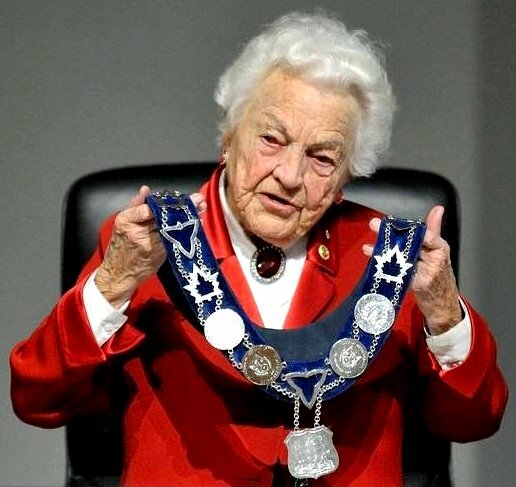 In April, 2010 Mayor McCallion was honoured by the Mississauga Board of Trade with a Lifetime Achievement Award for her contributions to the community, province and country. 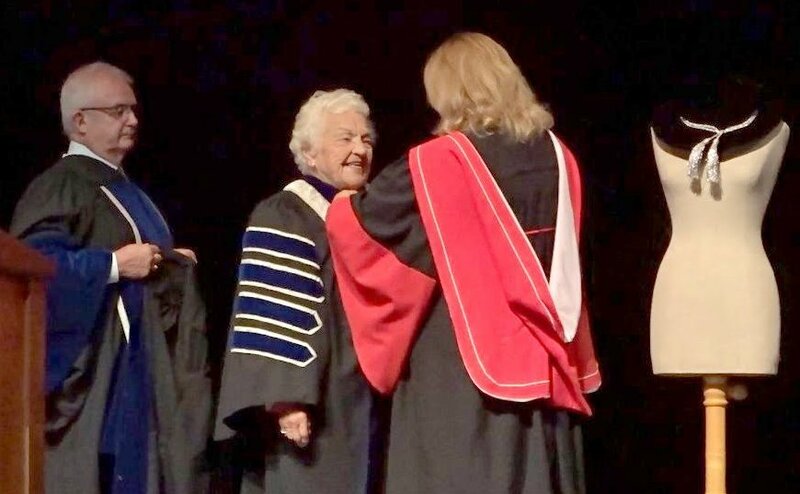 On June 7, Mayor McCallion was conferred with the degree of Doctor of Laws, honoris causa by the University of Toronto during their convocation ceremony for graduates of the University of Toronto Mississauga. 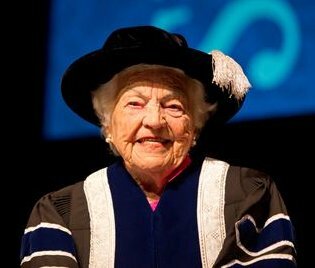 Mayor McCallion was honoured with the honorary Doctor of Laws in recognition of her remarkable contributions to public life. In October Mayor McCallion was elected to her 12th consecutive as Mayor of Mississauga. In March, 2011 Mayor McCallion was honoured by the Ottawa Chapter of the Famous 5 as a "Nation Builder". The Famous 5 Ottawa's aim is to raise awareness of the Persons Case, where in 1929, thanks to the efforts of the Famous Five, Canadian women were legally declared persons. 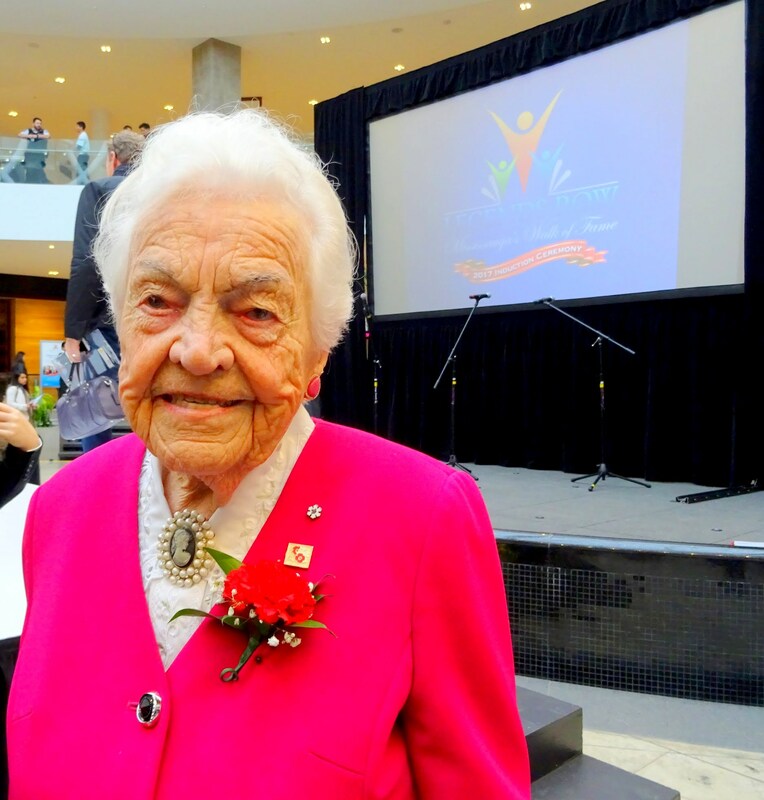 In May 2012, Mayor McCallion was honoured by the Learning Partnership with a Lifetime Achievement Award for dedication and commitment to enhancing our public education system. In June, Mayor McCallion received a Queen Elizabeth II Diamond Jubilee Medal presented by the Lieutenant Governor of Ontario. This medal was presented to all recipients of the Order of Canada and the Order of Ontario for their significant achievement and remarkable service. 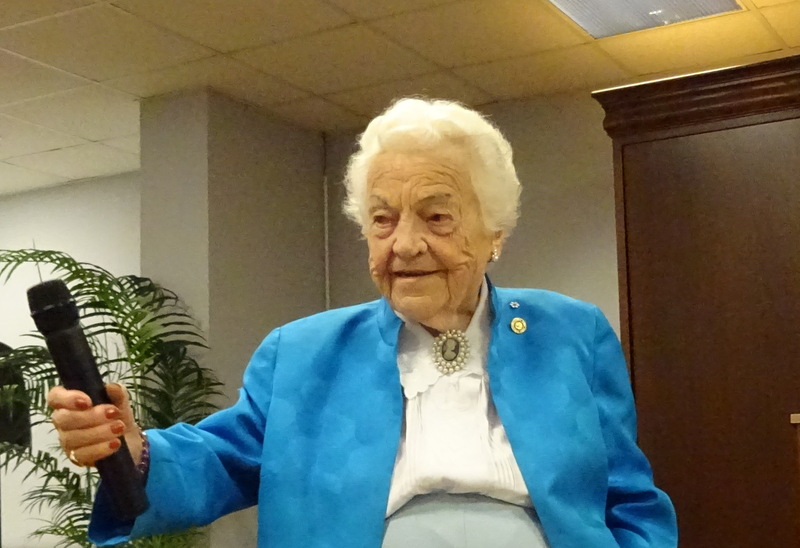 In April 2013, Mayor McCallion was honoured by the University of Toronto Mississauga Alumni Association with their Paul A. Fox Award for her outstanding volunteer service to the Mississauga Campus. In February 2014, Mayor McCallion was awarded the Community Leadership Award from the Economic Development Council of Ontario. The award was presented to honour Mayor McCallion's ongoing support for economic development and her longstanding record as Mayor of the City of Mississauga. In April, Mayor McCallion received the Community Builder Award from the United Way of Peel Region. The award recognizes an individual that has led the United Way to new levels of innovation and impact through its Give, Volunteer and Act efforts. 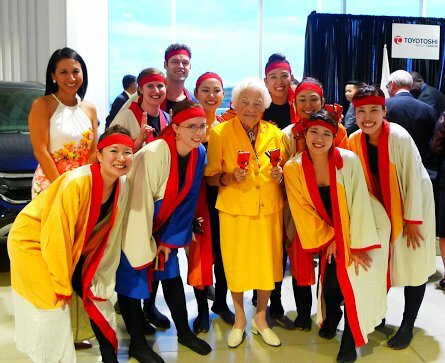 In June 2014, Mayor McCallion received the Order of the Rising Sun awarded by His Majesty the Emperor of Japan for her contributions to Japan-Canada relations through her welcoming support of Japanese businesses in Mississauga. It also recognizes her invaluable participation in the sister-city initiative between Mississauga and Kariya, Japan, which were twinned in July 1981. 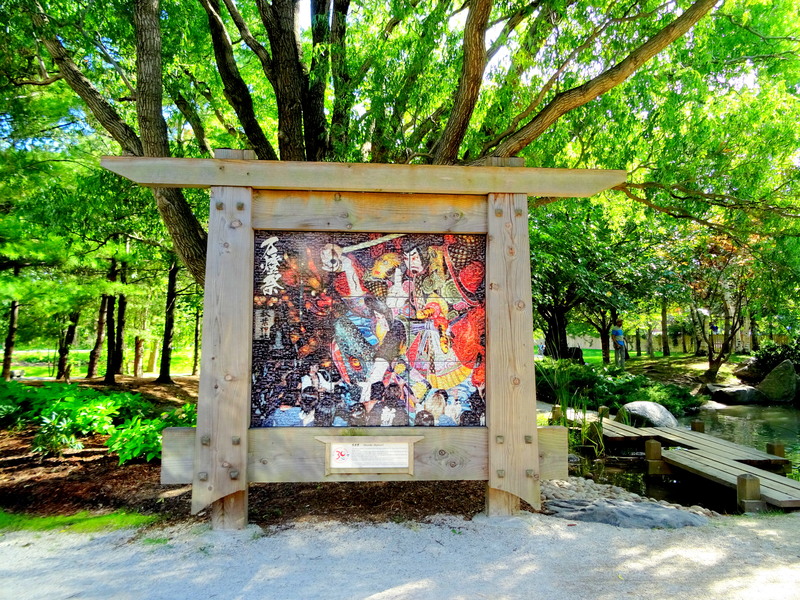 Kariya Park: "The park was officially opened in July 1992, honouring the eleventh anniversary of our twin-city relationship with Kariya, Japan." Kariya, Mississauga celebrate twinning by Jan Dean, Mississauga News, Sep 28, 2011. "Tuesday's celebration of Mississauga's 30th anniversary of the twinning with the city of Kariya, Japan moved to Kariya Park for festivities in the afternoon. After cutting the cake, Mayor McCallion, throws a ribbon from the cake into the crowd. On Mayor McCallions right are Kariya's Mayor Yoshinori Takenaka and Kenji Kato, chair of Kariya City Council." Photo by Rob Beintema. 'Twin' cities celebrate bond. Mississauga News, July 1, 2011. "The Mississauga Friendship Association and the Museums of Mississauga launched the 30th anniversary celebrations of the twinning by presenting a Japanese delegation with a joint donation of $500 to help with relief efforts as a result of the tsunami that devastated the northeast coast of Japan in mid-March." Mayor Crombie Marks 35th Anniversary of Mississauga-Kariya Sister City Relationship. July 5, 2016. "Mississauga - We gather to formally welcome Kariya Mayor Yoshinori Takenaka to City Hall to formally recognize and celebrate the 35th anniversary of the Mississauga-Kariya sister city relationship, Mayor Crombie said ..."
Since 1981, Mississauga and the community of Kariya have enjoyed a sister-city relationship, exchanging friendship and cultural delegations. In 1992, former mayor Hazel McCallion, officially opened Kariya Park to honour this twinning relationship. The Mississauga Friendship Association was established in 1993 to promote, foster and maintain this sister-city relationship." 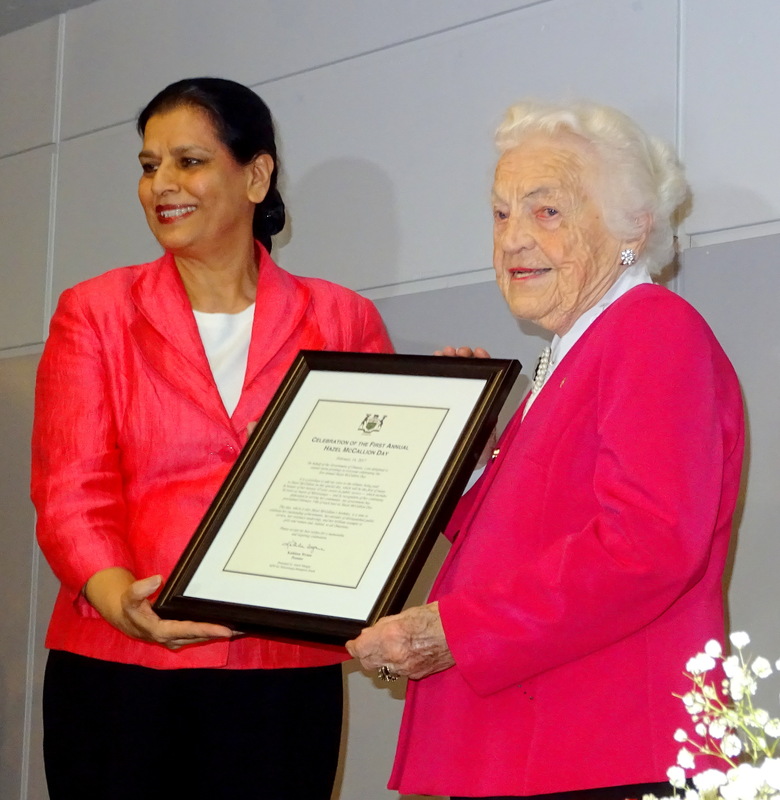 During the summer of 2014, Mayor McCallion received the Zafrulla Khan Award from Ahmadiyya Muslim Jama'at Canada for her years of distinguished service to the community. She also received the Honourary Life Member Award from the Association of Municipalities Ontario to acknowledge her passionate advocacy of municipal government. As well, the Dufferin Peel Catholic District School Board honoured Mayor McCallion by presenting her with the Catholic Award of Merit. Mayor McCallion was married to Sam McCallion who passed away in 1997. She has three children: Peter, Linda and Paul, and one granddaughter, Erika. Mayor McCallion enjoys gardening as well as many sports, including ice hockey and fishing. You can reach the City of Mississauga Mayor by email at mayor@mississauga.ca. 2014 will mark a special milestone for me for after 36 years as Mayor of the City of Mississauga, I will be retiring from political life. As I reflect on the last 36 years, the memories, accolades and defining moments are too numerable to count but one thing stands out and which has always meant the most to me - the people. I have had the unique opportunity to meet people of every age, ethnic background and view point. Some have charmed me, some have inspired me and some have challenged me but I shall forever be grateful for the encounters. The friendship, advice and wisdom of all those who have crossed my path are a blessing and I am a better person for the experience. Public service is one of the most noble pursuits we can undertake as citizens and every man, woman and child has the ability to serve their community in some way. As Ralph Waldo Emerson once said, "The best way to find yourself is to lose yourself in the service of others". Leaving a legacy is far more important than leaving an inheritance in my view, for a legacy is something left behind to inspire those that come after us and for others to learn from. I hope that those that follow me will be inspired to be great leaders and always put Mississauga first. I want to express my sincere and heartfelt appreciation to the citizens of Mississauga for the support and kindness you have shown to me for the last 36 years and it has been a great honour and privilege to have served as your Mayor. I hope that the future will be filled with good health, happiness and an abundance of blessings for you all. 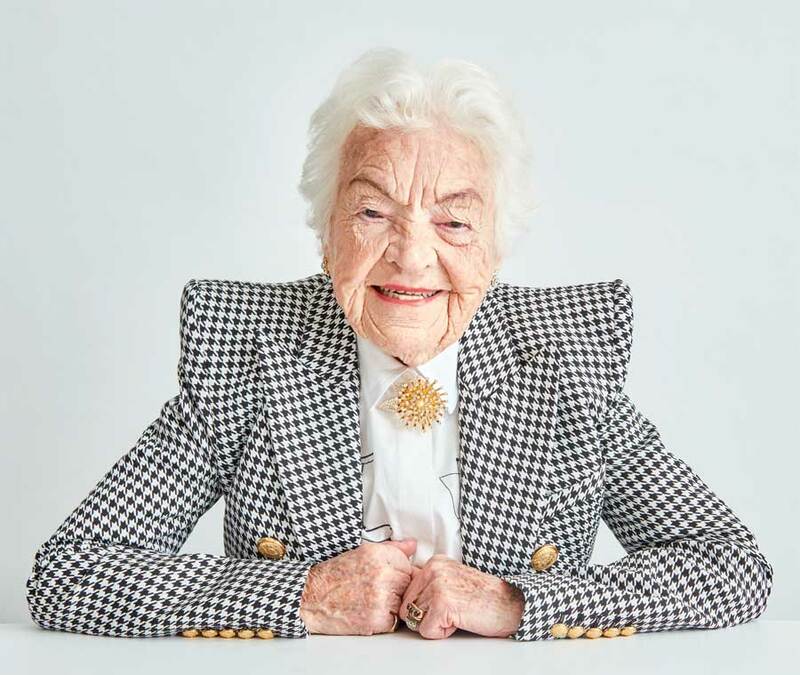 At age 98, Hazel McCallion is ready for her fashion shoot. But make it quick, she's busy by Shinan Govani, Star Columnist, Toronto Star, April 12, 2019. 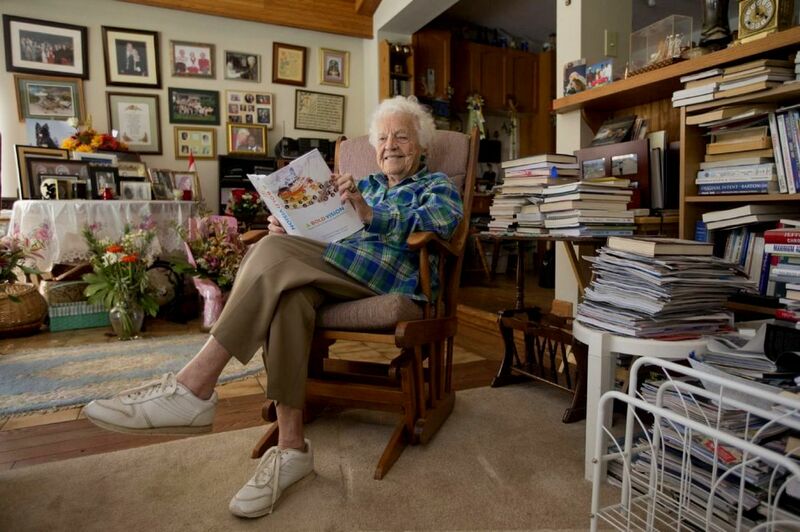 "'Fun Fact: The second runner-up for the oldest ever on our cover was the Queen at 90," and like Elizabeth, 'McCallion is active and still working,' said Suzanne Boyd, Editor-in-Chief of Zoomer." 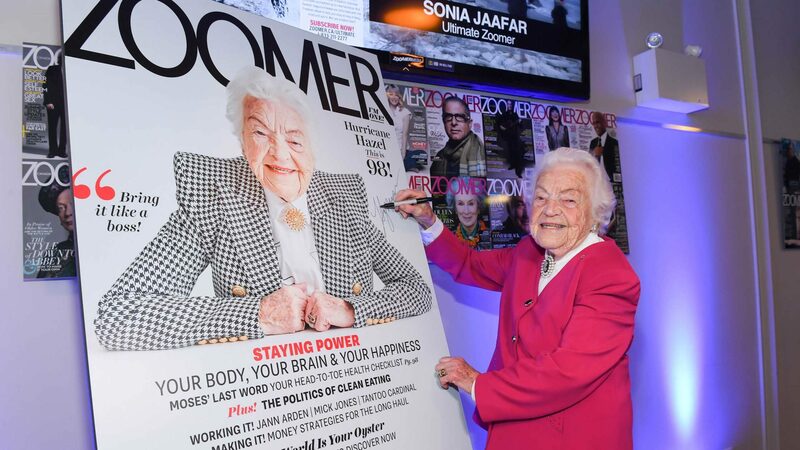 Hazel McCallion Talks Zoomer Photoshoot and Longevity at Cover Unveiling in Toronto by Andrew Wright, 10 Apr 2019. "Helping introduce McCallion was Zoomer founder Moses Znaimer, who is credited with suggesting the former mayor as a cover subject ... Joined by Znaimer, McCallion personally unveiled the cover, spoke to the audience about the photoshoot and even provided some insight into how she remains so healthy and active ... 'You have to encourage people to be active, to have a purpose in life. If you have a purpose in life, then you know where you want to go, you know what you want to try to accomplish,' McCallion explained. 'You can't always be successful but you have to make the effort and I encourage seniors in the retirement homes to live life to the fullest. To make everyday count, because it could be your last day, so that day is very very important.'" Community Living honours Joseph Mancinelli at Mississauga tribute dinner by Riziero Vertolli, Mississauga News, COMMUNITY Apr 2, 2019. Ex-Ontario Mayor Hazel McCallion Casually Climbs a Rock Wall Days Shy of 98th Birthday by Liz Haq, Associate News Editor, HuffPost Canada, Feb 10, 2019. Includes photos. "The multi-hyphenate icon did it in leather booties, too." 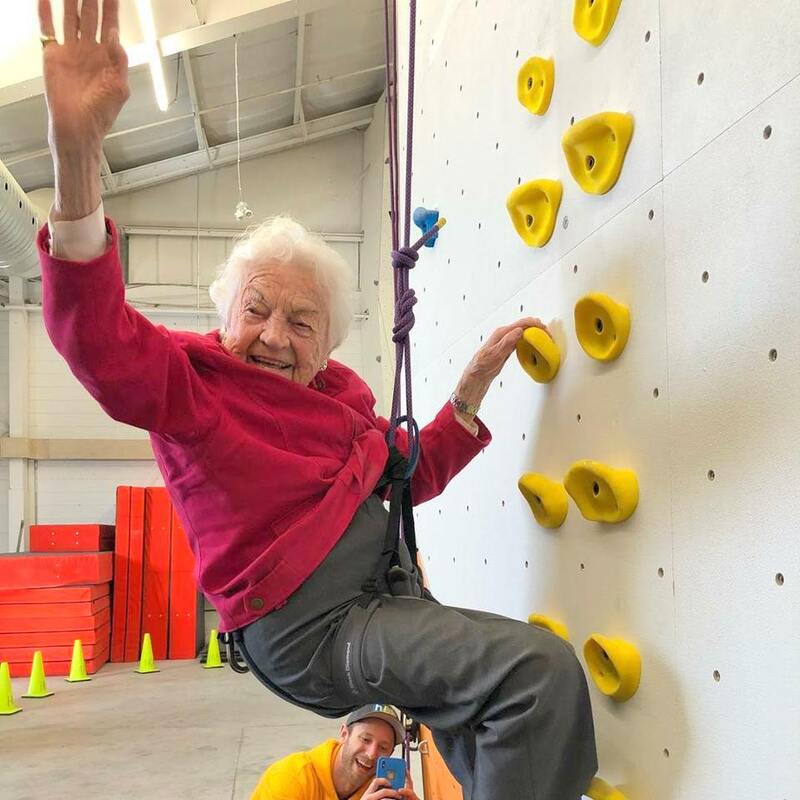 "We can honestly say she is the first 97 year old on our walls," climbing gym staff wrote on Facebook Saturday [9 Feb 2019]. 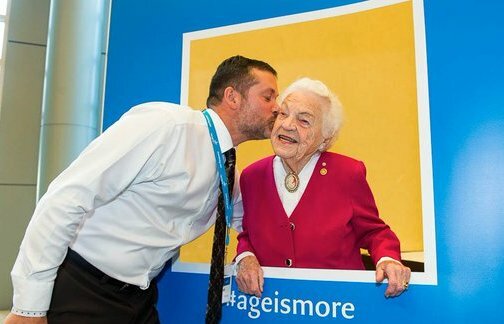 "Past Mayor of Mississauga, Hazel McCallion, is an absolute legend!" Hub Climbing bills itself as the largest and tallest rock climbing gym in the Greater Toronto Area with its 30,500 sq.-ft facility. Featuring climbs for beginners and aspiring Olympians alike, its tallest wall stands at a towering 15 metres (48 feet). 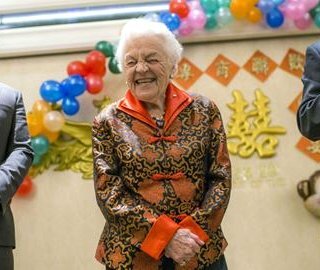 PHOTOS: Check Out What Hazel McCallion Did Just Days Before She Turns 98 by Jonah Shinuda, insauga.com, February 9, 2019. "It's no secret that Hazel McCallion is still leading a surprisingly active lifestyle well into her 90's, and her most recent experience only solidifies that fact. Earlier today (Saturday, February 9), the former mayor attended the newly-opened Hub Climbing in Mississauga to participate in some rock climbing. 'Former Mississauga Mayor Hazel McCallion proved that climbing is for all ages at the opening, taking on the climbing walls just a week before her 98th birthday,' the facility said in a recent statement." 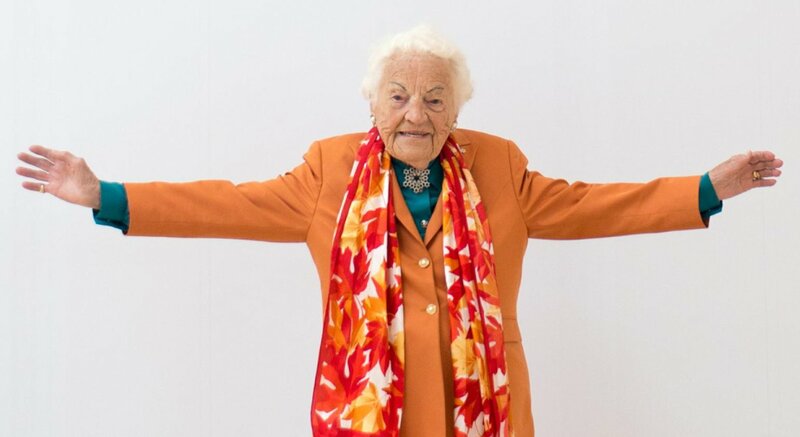 Former Mississauga Mayor Hazel McCallion Just Turned 98 And She's Still A Total Badass by Lilly Paltsev, Narcity Media, 14 Feb 2019. "Hazel McCallion celebrates her 98th birthday with rock climbing. Today's a special day ... McCallion just celebrated her birthday and at 98 years old, she decided that the best way to celebrate the occasion was to go rock climbing ... McCallion rounded up her squad, including current Mississauga mayor Bonnie Crombie, and headed over to Hub Climbing, Canada's largest indoor climbing gym, which just opened in Mississauga. Here are photos shared by Hub Climbing of her birthday adventure:a queen. Hazel McCallion turns down Ontario government's job offer from CBC News, Jan 30, 2019. "'Unfortunately, due to my extensive commitments, I am unable to accommodate the extensive time required for such an appointment at this point in time,' McCallion, the former mayor of Mississauga, Ont., said in the statement. 'As a result, I will not be accepting the formal appointment and the per diem that goes along with it.'" Hazel McCallion turns down Doug Ford's job offer. Posted by u/MethoxyEthane, People's Front of Judea, Reddit, Jan 30, 2019. Comment from the_monkey_Radical Centrist, Jan 30, 2019: "As would I! Politics aside, at 98 years old there is no way I would give enough of a d--- to solve Ontario's many problems. On to the next generation. What an inspiring woman!" Her comments came hours after Mr. Ford told reporters in Toronto that he met with Ms. McCallion over the weekend and she had offered to help in any way she could, but would not be accepting a salary. In a statement released later on Wednesday [30 Jan. 2019], Mr. Ford lauded the former longtime mayor, who has 44 years of experience in municipal politics. 'It is a sign of her true character that she didn't feel comfortable accepting this appointment given the time and energy it would have required,' Mr. Ford said in the statement. 'I am truly grateful for her friendship and guidance, and I am happy to know that she will always be a phone call away and available to provide informal advice should our government ever require her guidance and assistance.'" Doug Ford Gives Former Mississauga Mayor Hazel McCallion a New Job by Jonah Shinuda, insauga.com, January 18, 2019. "'McCallion brings many decades of public service, public advocacy and, most importantly, public representation that will enable her to provide advice to the Premier and the Minister of Municipal Affairs and Housing on a range of municipal issues,' reads a statement from the provincial government. Mayor Bonnie Crombie congratulated McCallion on her new position, citing the former mayor's municipal government experience as a major qualification." 'Housing is one of our government's top priorities and I'm looking forward to having Hazel McCallion support our work on the housing supply action plan,' said Clark. 'This advice ... will help ensure that the people of Ontario have access to the right kind of housing in the right place." Brampton Mayor Patrick Brown ... praised Clark for the choice of McCallion: 'She is brilliant. She has been a source of great advice and mentoring during my first few months as mayor of Brampton. I hope the province genuinely listens to her,' Brown said on Twitter. Ford Government hires Hazel McCallion as advisor for municipal affairs by Chris Herhalt, CP24.com, Friday, January 18, 2019. "The Ford Government has appointed longtime former Mississauga mayor Hazel McCallion as a paid special advisor to Premier Doug Ford and Municipal Affairs Minister Steve Clark. McCallion, who served as Mississauga's mayor from 1978 to 2014, will join the PC government days after it announced a sweeping review of regional municipal governments in the province. Former mayor Hazel McCallion, 97, to become special adviser to Ford government from CBC News, Jan 18, 2019. "McCallion served three decades as mayor, during which she was affectionately dubbed 'Hurricane Hazel' by supporters and some much more 'uncomplimentary' things as well, in her words, including 'The Queen of Sprawl.' During her term, Mississauga grew to become the sixth largest muncipality in the country, says the announcement." 'Hurricane Hazel' McCallion appointed adviser to Premier Doug Ford from Globe and Mail Toronto, The Canadian Press, January 18, 2019. "In a release, the provincial government says McCallion will advise Ford and Municipal Affairs Minister Steve Clark on a range of municipal issues and will receive up to $150,000 per year. The former mayor, known as 'Hurricane Hazel,' is less than a month away from her 98th birthday. The former Liberal government made Feb. 14 Hazel McCallion Day in honour of her birthday. 'Ms. McCallion brings many decades of public service, public advocacy and, most importantly, public representation that will enable her to provide advice to the Premier and the Minister of Municipal Affairs and Housing on a range of municipal issues,' added the government's release." News Release: Ontario Supporting Municipalities - Hazel McCallion Appointed Special Advisor to the Premier and Minister of Municipal Affairs and Housing January 18, 2019, Ministry of Municipal Affairs and Housing. "TORONTO - Premier Doug Ford and Steve Clark, Minister of Municipal Affairs and Housing, are pleased to announce the appointment of Hazel McCallion, former mayor of Mississauga, as special advisor to the Premier and Minister of Municipal Affairs and Housing. McCallion brings many decades of public service, public advocacy and, most importantly, public representation that will enable her to provide advice to the Premier and the Minister of Municipal Affairs and Housing on a range of municipal issues." tenacity and fortitude, which has made THP a reality. Trillium Health Partners launch annual lecture. Posted by News Review Media, Oct 2, 2018, Sports & Health. "On Oct. 2, Trillium Health Partners (THP) hosted a first-of-its-kind annual lecture in Mississauga, led by the hospital's research institute, the Institute for Better Health (IBH). Launched at the Medical Psychiatry Alliance (MPA) annual conference, the event was attended by patients, families, health care providers and educators from the community, as well as The Centre for Addiction and Mental Health, Hospital for Sick Children, University of Toronto and THP. McCallion offered her reflections as a community builder and highlighted the responsibility everyone holds to support one another and look after each other. She spoke about the importance of partnerships and how Mississauga and, in particular, THP would not have been possible without working together. 'The Hazel McCallion Endowed Lecture in Shaping Healthier Communities will create a forum for collaboration and learning among clinicians, academics, researchers and the broader community,' said Dr. Robert Reid, Trillium Health Partners, Institute for Better Health chief scientist and senior vice-president. 'This lecture is an important step in advancing our goal of improving community health through research and innovation.'" Hazel McCallion Speaks at Opening of 2018 Ontario 55+ Summer Games. YouTube video, 6:00 min. Published on Nov 27, 2018 by sq1oac2. 96-year old Hazel McCallion: "I don't know what retirement is all about. I haven't figured it out yet. Somebody said, 'Why are you so busy, Hazel?' 'I don't want to get old!' You don't want to get old, you gotta stay active." Opening of 2018 Ontario 55+ Summer Games in Mississauga. YouTube video, 1:19 min. Published on Nov 27, 2018 by sq1oac2. "Mississauga Mayor Bonnie Crombie, Former Mississauga Mayor Hazel McCallion, and Other Dignitaries at the Opening Ceremony of 55+ Ontario Summer Games at Mississauga Celebration Square. Info from OSG Mississauga, osgmississauga.ca: "The 2018 Ontario 55+ Summer Games held in Mississauga take place August 10-12, 2018. The Ontario 55+ Games is a celebration of active living hosted every year (alternating between Winter and Summer) for individuals in Ontario who are 55 years of age or older." celebrations in Port Credit on Sunday, July 1, 2018. CANADA DAY PHOTOS: Mississaugans flock to many of the city's celebrations. 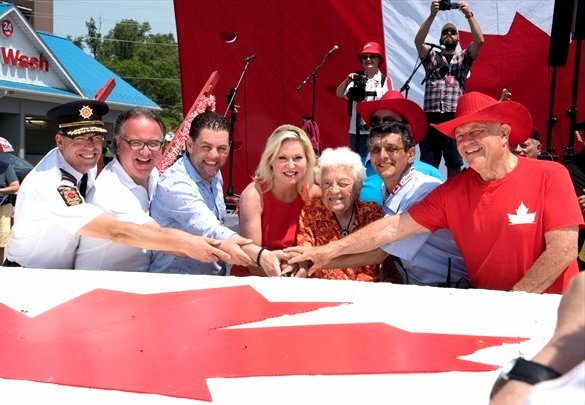 Mississauga celebrates Canada Day in style, COMMUNITY, Mississauga News, Jul 2, 2018. 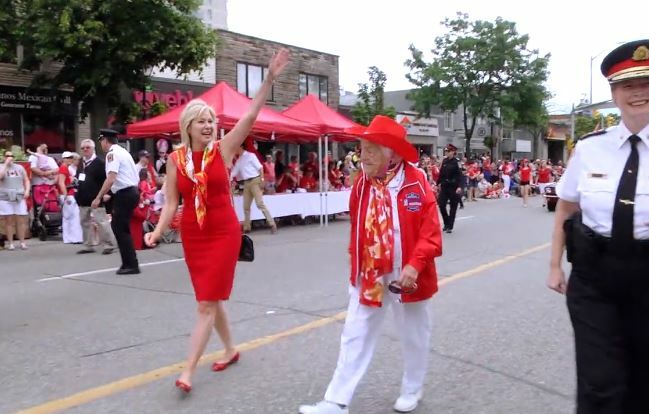 "A staple in the Mississauga community each summer, Paint the Town Red was highlighted by the Hazel McCallion Parade in the morning, followed by the cake cutting at La Villa Bakery and many musical performances throughout the day." Ford surprises guests at local fundraising dinner by Alex Gregory, Peel Weekly News, 27 June 2018. 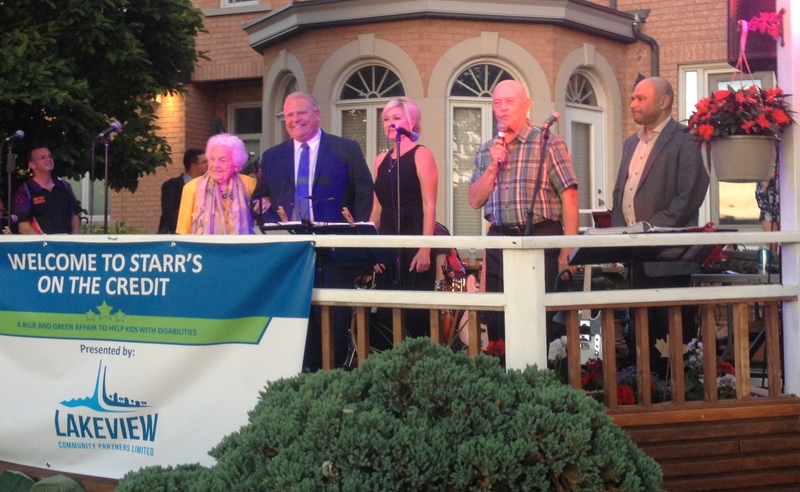 Premier-elect Doug Ford made a surprise appearance during the annual Starr's on the Credit fundraiser held by Mississauga Ward 6 Councillor Ron Starr, who donated this evening's proceeds of $150,000 to ErinoakKids Centre. Doug Ford shook hands with many guests who supported the Starr's on the Credit event. In addition, he thanked Hazel McCallion for her endorsement: "Here's the reason why we swept Mississauga and why we swept Ontario - because Mississauga did take sides ... Hazel took our side, and I appreciate it. I'll be forever grateful, because without you, we wouldn't have swept the city." Doug Ford congratulated ErinoakKids Centre and said: "I look forward to giving you the provincial support that you need ... and we'll be there for you." The ErinoakKids Centre for Treatment and Development is Ontario's largest Children's Treatment Centre which serves more than 16,000 children with disabilities each year. 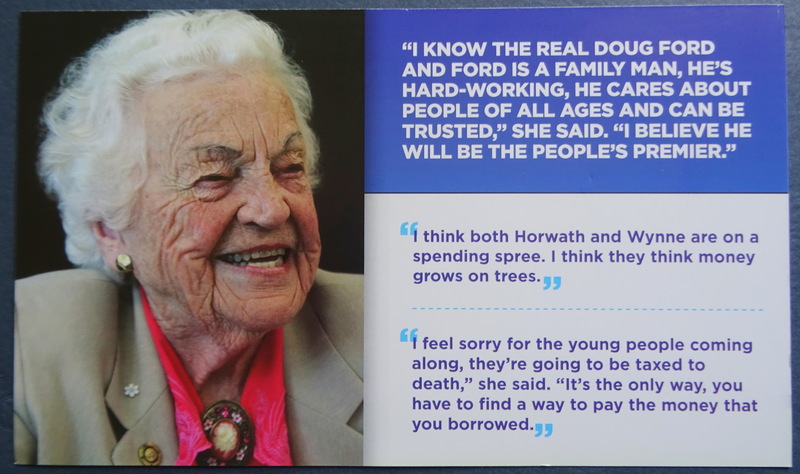 Hazel McCallion Endorses Doug Ford to Become 'The People's Premier' in Ontario PC Ad by Ryan Maloney, Huffington Post, 24 May 2018. "McCallion called Ford the right leader to 'fix' the finances in Canada's largest province, improve health care and get hydro bills under control." The Waterfront Awards 2018. 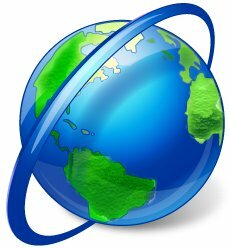 Blog by Enza Tiberi-Checchia, April 30, 2018. 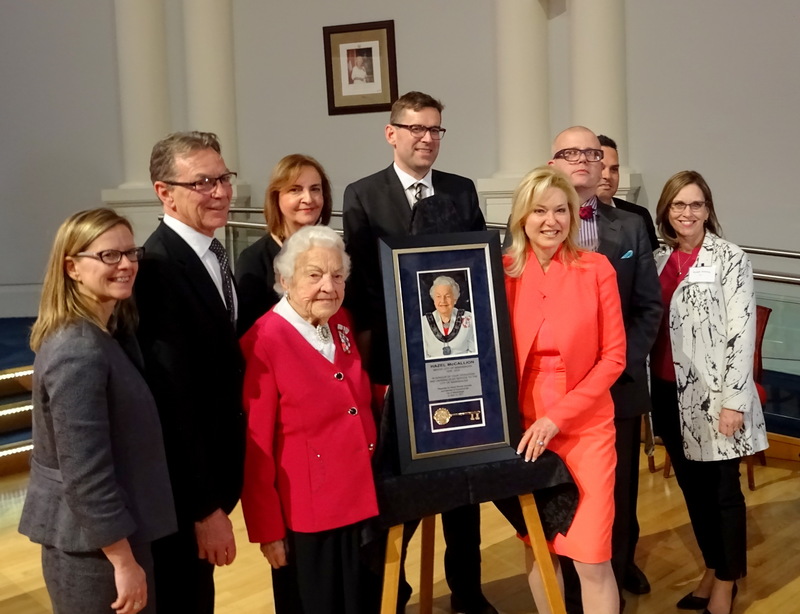 "Lifetime achievement was presented by Honourable Mayor of Mississauga Bonnie Crombie to her mentor and past mayor of Mississauga, the legendary Hazel McCallion for her 40 years of public service as Mississauga's Distinguished Mayor. Congrats to Hurricane Hazel. I am a proud & grateful Mississauga citizen that is inspired by your fierce and tireless dedication to the city of Mississauga." Event Review: Waterfront Gala Friday April 27th, 2018. Blog by Jim Pagiamtzis. "The Globe and Mail Building. It was a night of celebration at the 1st Annual Waterfront awards. Celebration oustanding women in various fields. Hazel McCallion received a Lifetime Achievement Award from the current mayor of Mississauga Bonnie Crombie." Movement afoot to get Hazel McCallion inducted into Hockey Hall of Fame: Twitter account trying to drum up support by Iain Colpitts, Mississauga News, SPORTS, Apr 13, 2018. "Late last year, Daniel Harbridge was looking into the history of women's hockey and saw just how big of an influence former Mississauga mayor Hazel McCallion was in the movement. It inspired Harbridge to push for McCallion's induction into the Hockey Hall of Fame as the hall's first ever female builder." A Twitter account has been set up pushing for Hazel McCallion's induction into the Hockey Hall of Fame as its first women's builder. Article published in SPORTS, Mississauga News, April 19, 2018, p. 5. Hazel McCallion: Hockey Hall of Fame 2018 on Twitter @HazelHallofFame, 3 April 2018. Campaign to get Hazel McCallion inducted into the @HockeyHallofFame in 2018 as the #HHoF's first female builder. Tweet us your hockey experiences with Hazel: HazelHallofFame. See: Hazel McCallion: 2018 Hockey Hall of Fame Nomination Letter by Daniel Harbridge, New Media Specialist, Posted on LinkedIn, April 12, 2018. Grand Reopening of Revera King Gardens from The Record, 2018. 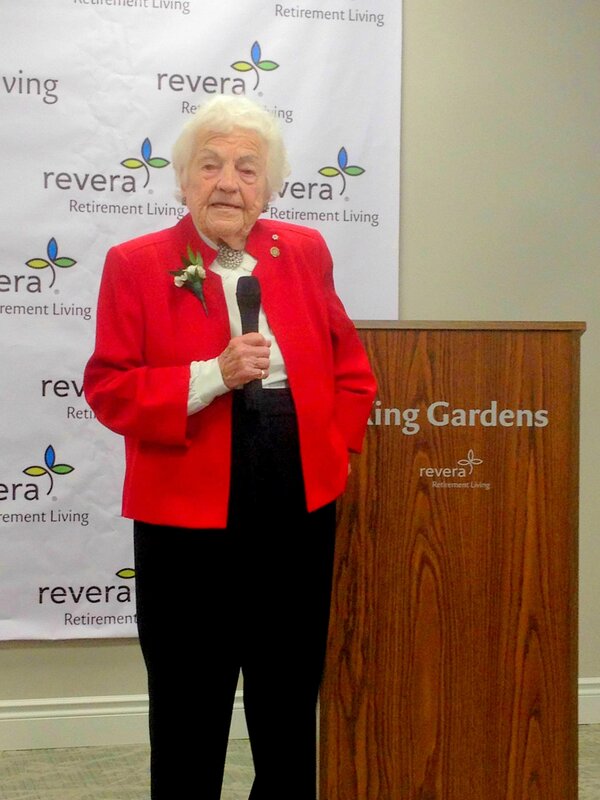 You are invited to "join Hazel McCallion, Revera's Chief Elder Officer, for the grand reopening of Revera's King Gardens Retirement Residence in downtown Mississauga. Celebrate the refresh of this beautiful residence with Hazel McCallion, who will be sharing her insights about how to live life to the fullest." Grand Re-Opening of King Gardens Retirement Residence. King Gardens has upgraded its look. On Thursday, April 5, 2018, from 1:00 to 3:00 pm, King Gardens Retirement Reswidence will be celebrating with live music, hors d'oeuvres and a special guest, Hazel McCallion, Revera's Chief Elder Officer. of Revera King Gardens, 5 April 2018. Hazel McCallion celebrates 97th birthday | CP24.com. Video, 0:36 min. 14 Feb 2018. Former Mississauga mayor Hazel McCallion is celebrating her 97th birthday today. 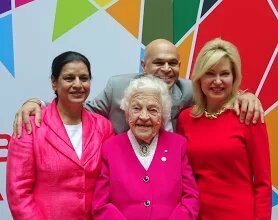 Tweet from Mississauga Mayor Bonnie Crombie: https://twitter.com/BonnieCrombie 14 Feb 2018: "Happy Birthday, Hazel and Happy #HazelMcCallionDay to all! Today we celebrate the 'Hurricane,' an indomitable woman with a passion for life and a tireless commitment to others. She has inspired millions, including me, to reach higher." Statement by Mayor Crombie Marking Hazel McCallion Day 2018. "... As only the City's fourth Mayor I, along with my Council colleagues and City staff, have the privilege of building upon the foundations Hazel McCallion laid for Mississauga. We find ourselves in a position of strength because of the over 40 years of hard work, dedication, and public service she gave to the residents of this City ... Looking around the City, Hazel's fingerprints are on everything. From our burgeoning downtown core, to the Living Arts Centre, to Sheridan College, to our Central Library, to our many community centres and arenas, to our commitment to economic development and prosperity, Hazel is everywhere in Mississauga. Hazel McCallion is a city-builder and city-building is nation-building. Through her decades of work, Hazel helped to shape the social and economic fabric of Canada for the better ..."
MBOT Celebrates Hazel McCallion Day by Casey, Community Captured, 21 Feb. 2018. (MBOT = Mississauga Board of Trade). 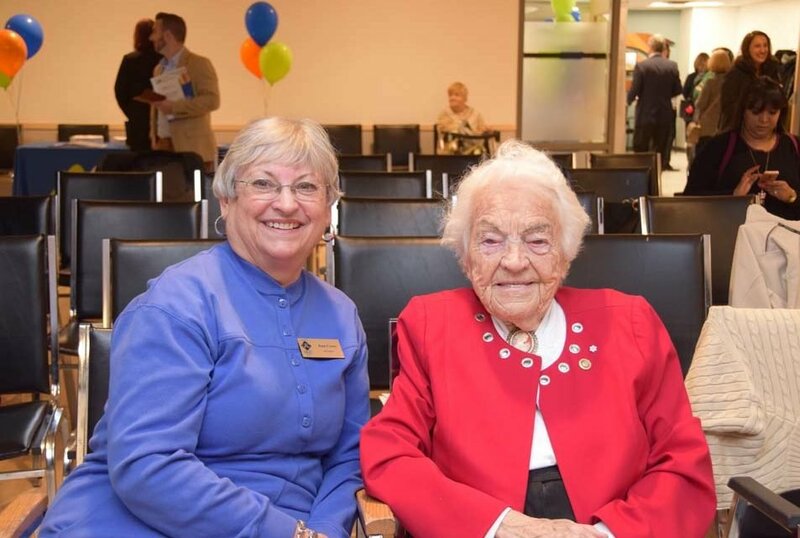 "Over 150 people came out to celebrate Hazel's 97th birthday at Sheridan College, at the Hazel McCallion Campus, on February 14th." Article includes photos of VIPs who attended the birthday party as well as photos of Hazel blowing out candles on her birthday cake. 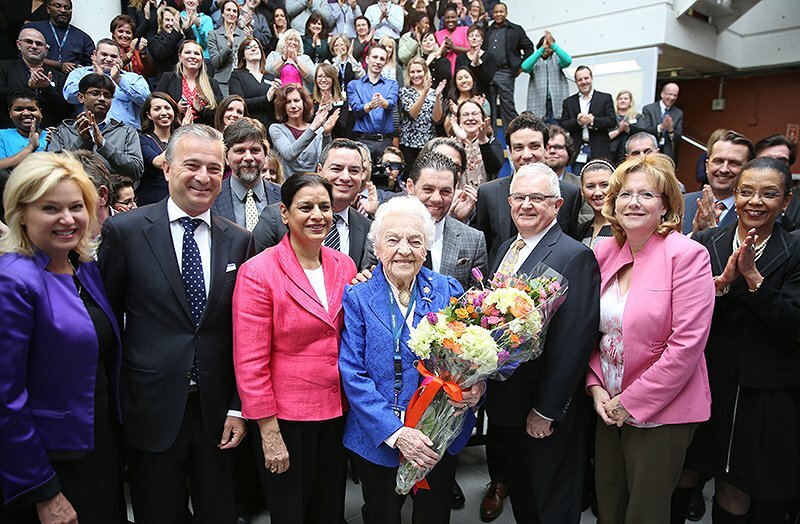 Celebrate Hazel McCallion Day at Good Morning Mississauga (GMM) Mississauga, ON, Canada, from LinkedEvents. 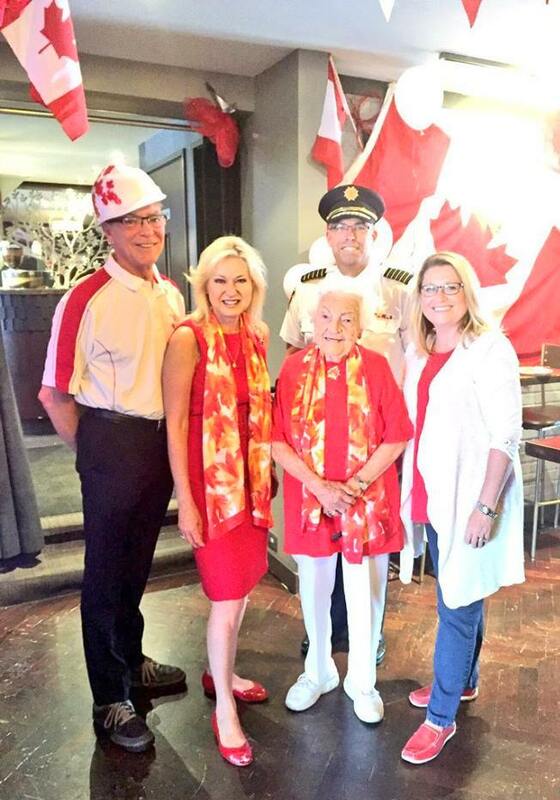 "Event Special: Celebrate #HazelMcCallionDay - Join us for 97th Birthday of Former Mayor Hon. Hazel McCallion & sign the greeting card! Wednesday, February 14, 2018, 7:30 - 9:30 am EST. Venue: Sheridan College - Hazel McCallion Campus, 4180 Duke of York Blvd, Mississauga ON L5B 0G5 Canada. Happy 97th Birthday Hazel - Hazel McCallion's Photos Through the Years by Khaled Iwamura, insauga.com, February 14, 2018. Grand Opening of the Active Adult Centre of Mississauga, 15 January 2018 by Casey, Community Captured, published 23 Jan. 2018. Article includes numerous photos from this special opening event. 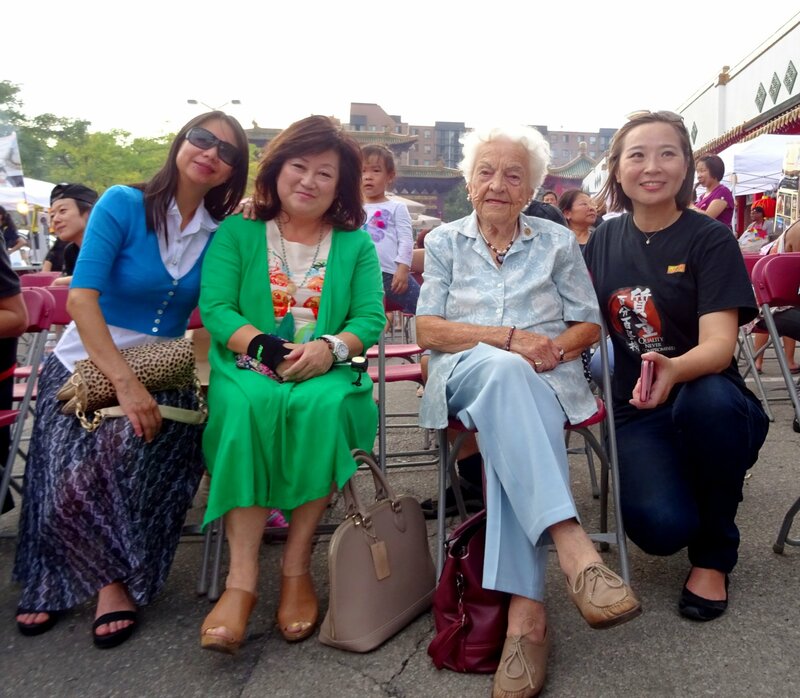 Besides Former Mayor Hazel McCallion, also in attendance are Mississauga Mayor Bonnie Crombie, MP Peter Fonseca (Mississauga East-Cooksville), MPP Damerla Dipika (Mississauga East-Cooksville), Councillor Chris Fonseca (Ward 3), and Councillor John Kovac (Ward 4). COLD CASE: Who robbed the legendary Hazel McCallion? The brazen bandit has yet to be caught By Louie Rosella, Mississauga News, Dec. 3, 2017 online. Published in Mississauga News in print, Dec. 28, 2017, p. 15. "... break-in at the home of then Mississauga Mayor Hazel McCallion on Jan. 16, 2008 ... Police confirmed ... break-in at the Streetsville home, that McCallion, 87 at the time, wasn't home when the incident occurred ... Former Mississauga Councillor Katie Mahoney said the items taken were mostly 'personal belongings that have some sentimental value to her [McCallion] ... Anyone with information on the break-in is asked to contact 905-453-2121, ext. 1133." At age 96, Hazel McCallion remains a hurricane by David Rider, City Hall Bureau Chief, Toronto Star, Dec. 23, 2017. "McCallion, who retired from politics in 2014 after 36 years as mayor, still wears many hats. She is chancellor of Sheridan College, sits on the boards of three companies, was named to the board of the Greater Toronto Airports Authority and has advised Premier Kathleen Wynne on urban issues. Two or three times a week she visits her office at the Ontario Women's Hockey Association, an organization long championed by the onetime pro who in the 1940s earned $5 a game playing on a Montreal women's team. She is sought for appearances and speeches, including an 'Ageing Well Revolution' conference last month that required a 21-hour trip to Adelaide, Australia ... Last year she was in China." Hazel McCallion visits Second World War vets. YouTube video, 2:59 min. Published on Nov 10, 2017 by CTV News. "Former Mississauga mayor Hazel McCallion visited veterans of the Second World War ahead of Remembrance Day. Sean Leathong reports." with Ron Duquette, President and Founder of Mississauga's Legends Row. which ends in London ON on his 75th birthday, March 20, 2012. Photo from Tommy Hunter Retires YouTube video, 2:49 min. ● Hazel McCallion Acceptance Speech, Mississauga Legends Row 2017. YouTube video, 14:37 min. Published on Nov 11, 2017 by sq1oac2. ● George Stroumboulopoulos acceptance speech, Mississauga Legends Row 2017. YouTube video, 5:35 min. Published on Nov 4, 2017 by Nicholas Moreau. ● Community leader Gary Clipperton. Legends Row Mississauga's Walk of Fame inductees will have a descriptive plaque of their accomplishments on a six foot high, four-sided vertical unit called a "Totem", located in Celebration Square in the heart of Mississauga's downtown. CLICK HERE to view Google Photos & Videos, Legends Row Mississauga's Walk of Fame, Opening Ceremonies at Celebration Square, June 3, 2017, 157 items. 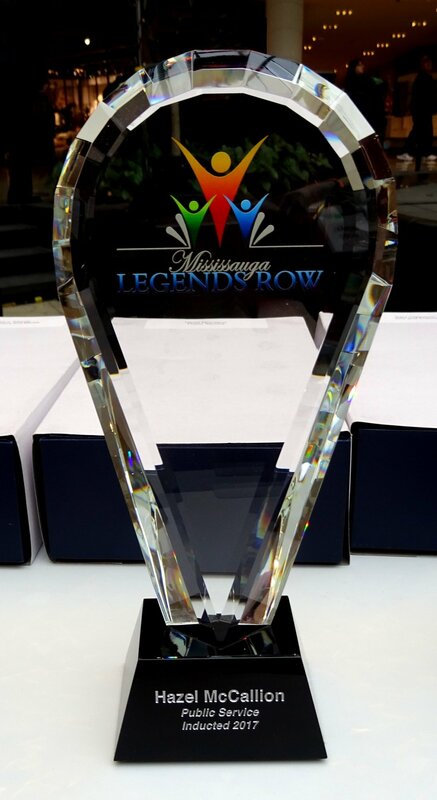 ● Legends Row Mississauga's Walk of Fame Opening Ceremonies at Celebration Square. YouTube video, 5:28 min. Published on Jun 10, 2017 by sq1oac2. 7 new noteworthy names added to Mississauga's Legends Row by Chris Clay, Mississauga News, 29 Oct 2017. Hazel McCallion | 50th Anniversary - University of Toronto Mississauga. 1967-2017. 50 Faces. As part of this significant milestone anniversary, 50 individuals have been selected from U of T Mississauga's (UTM) past and present community. This project was created to celebrate those who have influenced or been influenced by UTM over the past 50 years ... 50 Faces showcases the types of outstanding individuals who have contributed to the legacy of our campus. Hazel McCallion. Affiliation: Special Advisor at UTM. Former Mayor of Mississauga. Place of Birth: Port Daniel, Quebec. Department / Division: Community. "It is wonderful to have post-secondary educational opportunities in Mississauga. They build our communities, develop talent and culture and ensure our city thrives. Mississauga is attracting and retaining talented people from around the world and in the community and we cannot do this without our education partners." ~ Hazel McCallion. A brief biography of Hazel McCallion: "Hazel McCallion, also known as Hurricane Hazel, was Mississauga's longest serving mayor. She started her political career in 1964 as a member, and eventually chair, of the Streetsville Planning Board before becoming that municipality's mayor in 1970. In 1974, she was elected Mississauga's mayor and, during her extensive career, sat on nearly every committee at the Region of Peel and the City of Mississauga. Her 36-year-reign as mayor came to an end with her retirement in November 2014. However, McCallion has not let this slow her down. She has since been appointed special advisor to the principal of UTM and chancellor of Sheridan College. Outside the political arena, McCallion is also a hockey fan and player. 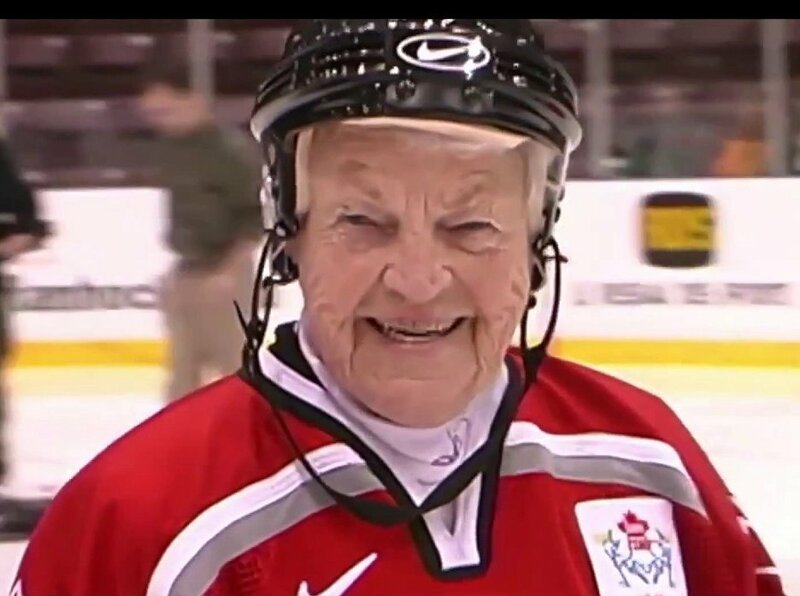 In 1940, McCallion joined the Women's Professional Hockey League where she was known as a ?fast skater and hard shot,? according to the Montreal Star, and she lost two teeth during a game. She was inducted into the Mississauga Sports Hall of Fame in 2001 and received Hockey Canada's Female Breakthrough Award in 2007. 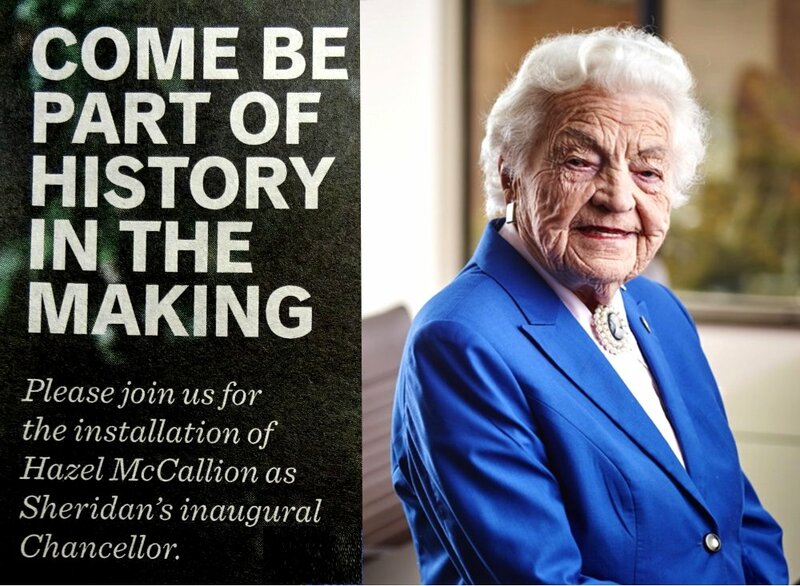 Over the years, McCallion has received numerous honours and awards for her commitment to U of T, UTM and Mississauga including an honorary Doctor of Laws degree, the Paul W. Fox Award for dedicated voluntary service and membership in the Order of Canada. In 2006, Mississauga's Healthy City Stewardship Centre won the World Leadership Award. In 2007, UTM named its new library the Hazel McCallion Academic Learning Centre in her honour. And in her final year as mayor, UTM paid tribute to McCallion through a musical based on her life called She Shoots! She Scores! In 2016, Feb. 14 was renamed Hazel McCallion Day across the province of Ontario in honour of McCallion's birthday. Mayor Hazel McCallion at Canada Day Parade. YouTube video, 0:24 min. Published on Jul 5, 2017 by rookie. "She is as famous as she is old... Keep going Hurricane Hazel!!" 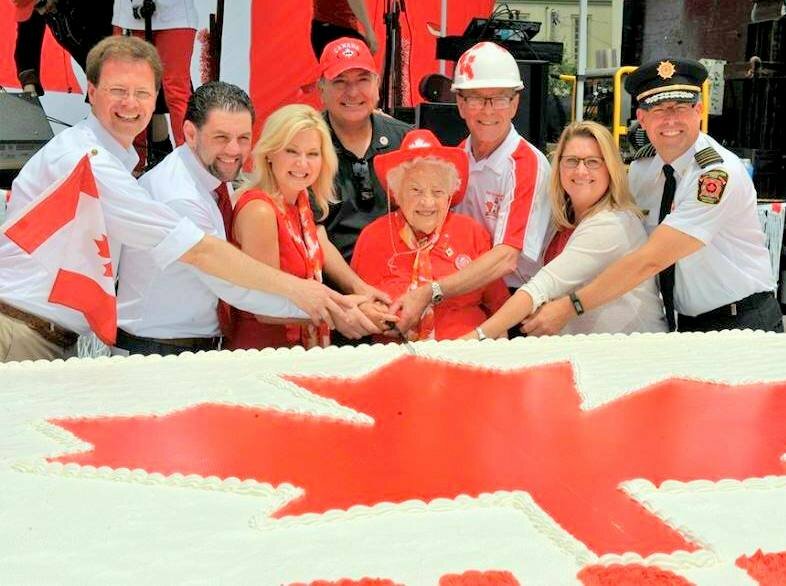 On Saturday, July 1, 2017, the "Paint the Town Red" event kicks off with an annual "Hazel McCallion Canada Day Parade", headed by Hazel McCallion, the Parade Grand Marshall, at 11:00 am. The Parade will begin in the East Village then cross into the West Village (Parade Route: Lakeshore Rd from Stavebank to Seneca) with fantastic floats and convertable cars. See Paint the Town Red for more details. 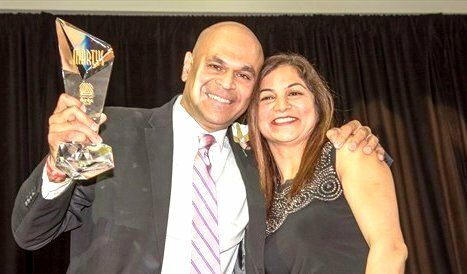 Jake Dheer was the recipient of the Hazel McCallion Volunteer of the Year Award at the 2017 MARTY Awards at the Mississauga Convention Centre on Thursday, May 18, 2017. With him is his wife Geeta. Photo credits: Bryon Johnson/Metroland. Photo from article: MARTY award nominations now open by Marta Marychuk, Mississauga News, Jan 27, 2018. Former Mississauga Mayor, Hazel McCallion, joins GreenSaver Board from CSRWire.ca, April 25, 2017. Media Release. (Note: CSRWire.ca is a national distribution service for environmental and corporate social responsibility (CSR) news that is relevant for Canadians.) "Hazel McCallion, the long serving former Mayor of Mississauga continues to make her mark. Her most recent effort is to advocate for energy conservation and related programs for families and small business owners in Ontario. Her long-term interest in the topic, has resulted in her becoming the newest addition to the Board of Directors of GreenSaver, Ontario?s leading not-for-profit energy efficiency organization. McCallion, 96, has kept busy since her 2014 retirement. She serves as chancellor of Sheridan College, special adviser to the University of Toronto Mississauga, ex-officio adviser to Premier Kathleen Wynne on GTHA matters, member of the Board of Advisors for Kaneff Group of Companies, advocate for Ontario Women's Hockey Association, business ambassador for Speigel Nichols Fox LLP and chief elder officer for Revera Retirement Living." Celebrating Hazel - new exhibit honours her pioneering career and legacy - Do Your Homework on display until April 26, 2017 by Chris Clay, Mississauga News, Apr 13, 2017. 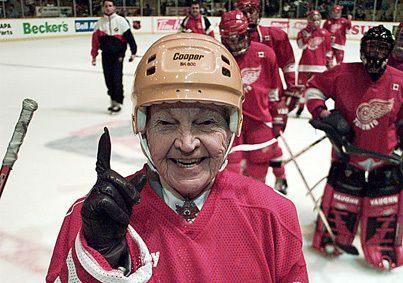 Hazel McCallion's hockey helmet and skates are currently on display in the Great Hall at the Civic Centre ... At age 96, she's still skating. Simply amazing. 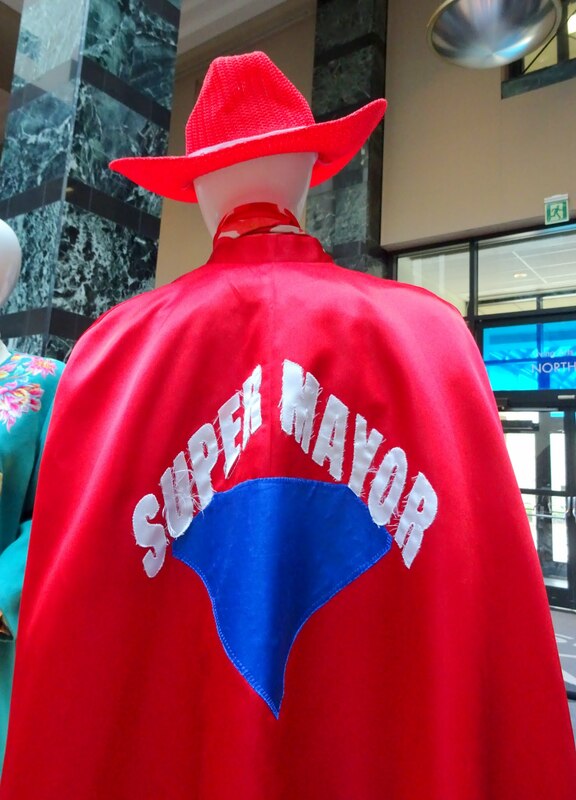 ... the mayor shared a story about her famed Super Mayor cape that she would often wear on special occasions. She was driving home a number of years ago when she saw a young girl standing at a bus stop as it was starting to get dark. Something about the girl made her pause and stop to ask if she needed a ride, which is something she very seldom does. McCallion said the young lady recognized her right away and let the mayor know she was the daughter of the woman who made her the cape. Talk about a small world." Photo by I Lee, 12 April 2017. Do Your Homework: In Conversation with Hazel McCallion 12 Apr 2017. YouTube video, 3:30 min. Published on Apr 13, 2017 by sq1oac2. Mississauga Mayor Bonnie Crombie interviews former mayor Hazel McCallion "In Conversation with Hazel McCallion" held in Council Chambers, Mississauga Civic Centre from 7 to 8:30 pm. 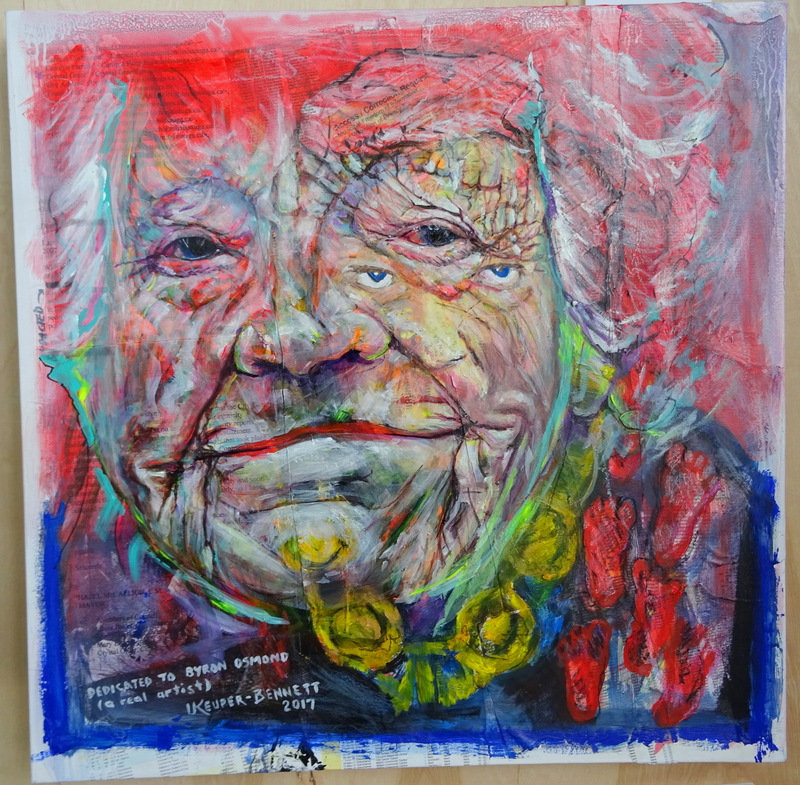 "In Conversation with Hazel McCallion" takes place after the Opening Reception for "Do Your Homework: A Tribute to Hazel McCallion Exhibition" which explores the Life and Legacy of Hazel McCallion. The Exhibit is located in the Great Hall at Mississauga Civic Centre and is open to the Public from April 12 to 26, 2017. "Saint Hazel" by Ursula Keuper-Bennett, 2017. Photo by I Lee, 19 April 2017. Published on Apr 16, 2017 by sq1oac2. Published on Apr 18, 2017 by City of Mississauga. Film created by Confound Films in partnership with the Museums of Mississauga for the Do Your Homework Exhibit. "As part of Canada's 150th anniversary, the Museums of Mississauga will present an exhibition honouring former Mayor Hazel McCallion that captures the most captivating moments of her political career"
"Hazel's Life and Legacy Captured Through Art: Hurricane Hazel Gets the Artistic Treatment in Exhibit" by Chris Clay, Mississauga News, 7 Apr. 2017. Print version. Photo on p. 1, article on p. 5. Mississauga News online version: Hazel McCallion to give talk at art exhibit honouring her life and career by Chris Clay, Mississauga News, Apr 5, 2017. "The name of the exhibition references McCallion's love of the saying 'Do your homework.' Throughout the course of her storied political career, McCallion must have uttered the phrase hundreds, if not thousands, of times." Explore the Life and Legacy of Hazel McCallion with this New Exhibit. YouTube video, 8:52 min. Published on Apr 4, 2017 by RogersTV. Being interviewed in this video by "Night Time with Arlene Paculan" about Do Your Homework: A Tribute to Hazel McCallion Exhibition (April 12 - 26, 2017) are Sonja Banic, Manager, Culture Operations and Stuart Keeler, Manager and Chief Curator, Culture Division, Mississauga Culture. Question: March 27, 2017 - Where's Hazel? Photo credits: Kenneth Chou #SaugaMuseums. "The Do Your Homework exhibit will present the most successful/captivating moments of Hazel McCallion's political career in an engaging, highly graphic and respectfully informative tone. The exhibit aims to bring awareness to the City's Collection as well as focus on the stories and themes of Hazel McCallion's era. The community will be invited to share their memories and tributes to Hazel McCallion through online responses and a call for artwork. Themes highlighted in the exhibition will include: Leadership Lessons, Legacy Maker, Before & After, Compassionate Leader, Inspiring Women, A Global Force, Canadian Icon and Sports Enthusiast." 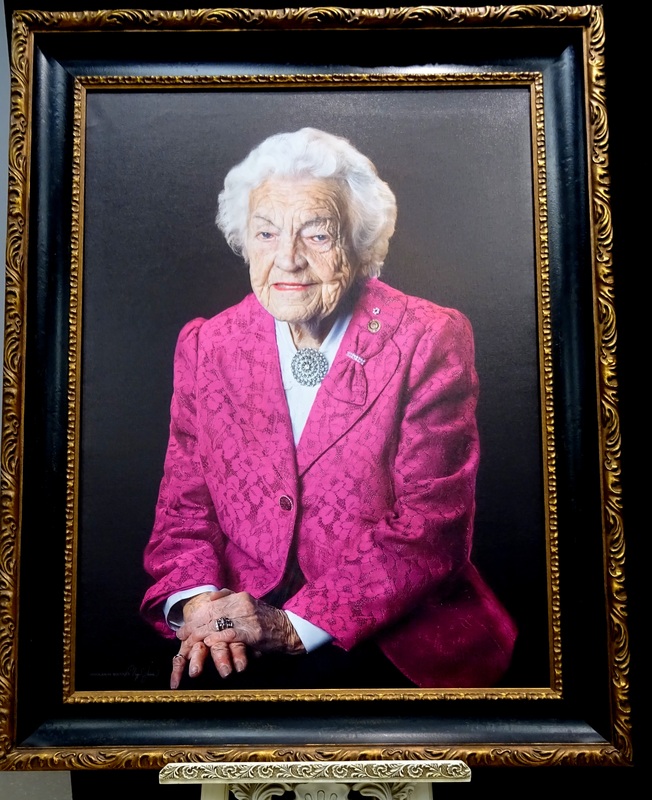 The Museums of Mississauga will be highlighting the life and times of Hazel McCallion in an exhibition held April 12 - 26, 2017 at the Mississauga Civic Centre (City Hall), 300 City Centre Drive, Mississauga ON L5B 3C1 Canada. View Map. 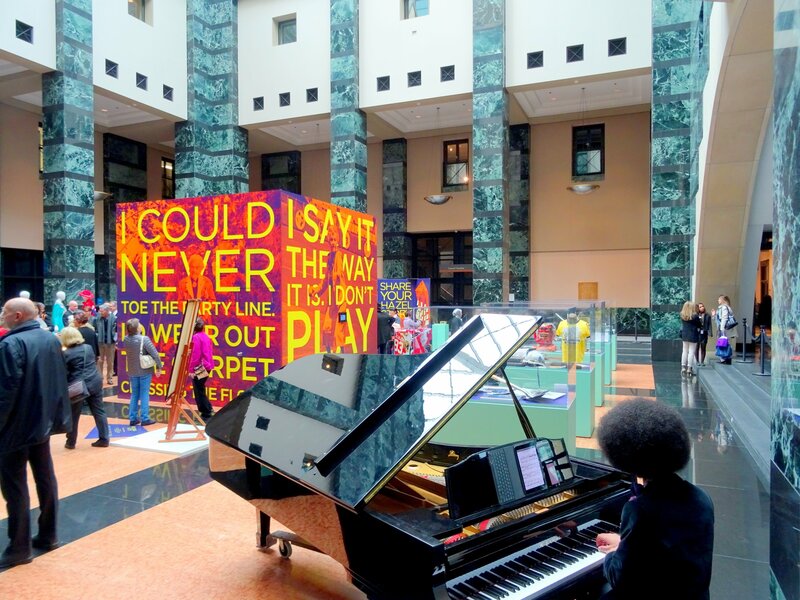 Two sites comprise the exhibit: 45 artworks inspired by Hazel in Glass Pavillion and 102 artifacts and videos in the Great Hall, Mississauga Civic Centre. The field is open, it's entirely up to you." Photos from YouTube video below. Women of Diversity Celebrating Canada 150. YouTube video: 4:59 min. Event organized and produced by Rosanna Penilla-Bharucha (We Host Students Network Regional Director - Asia, Dubai, Australia). Video credits: Producer Raul Dudnic of OMNI Television and Rogers Community Channel. Published on Apr 5, 2017 by Raja Mishal, PhD, Emcee for the March 31, 2017 event held at Vic Johnston Community Centre, Mississauga ON Canada. Ethnic communities from 25 countries were represented at this celebration. Mr. Mugurel Stanescu (Consul General of Romania in Toronto) and former Mississauga Mayor Hazel McCallion were among over 350 attendees. Hear Madame Hazel's speech and watch performances from Romania, Jamaica, China, Iraq, Palestine, Egypt and other countries. 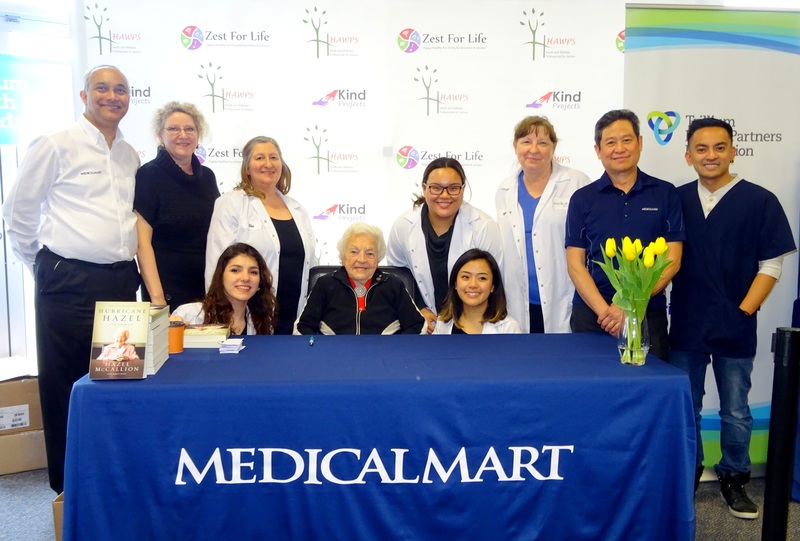 Hazel McCallion Book Signing and Photo Opportunity! at Medical Mart Home Health Care Centre in Mississauga on Saturday, March 25, 2017, 2:00 - 4:00 pm. Meet Hazel McCallion in a book signing as she presents her memoire: "Hurricane Hazel: A Life with Purpose". 100% of donations will be accepted in support of Seniors' Health at Trillium Health Partners. This event is to also support happy, healthy, fun living for boomers, zoomers and seniors. Please note that a percentage of Medical Mart store sales on this day will also be donated to Seniors' Health at Trillium Health Partners. Photo by I Lee, 25 March 2017. 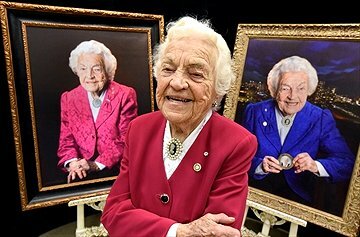 Happy 96th Birthday Hazel - Hazel McCallion's Photos Through the Years by Khaled Iwamura on February 15, 2017, in News History, insauga.com. Hazel McCallion Day Community Reception at Mississauga Civic Centre on Tuesday, February 14, 2017, from 1:00 - 3:00 pm. To mark this important milestone, Mayor Bonnie Crombie and Mississauga-Brampton South MPP Amrit Mangat will host a community reception ceremony with former Mayor Hazel McCallion, Council, dignitaries and members of the community. During the reception, McCallion will be formally presented with a copy of Bill 16. 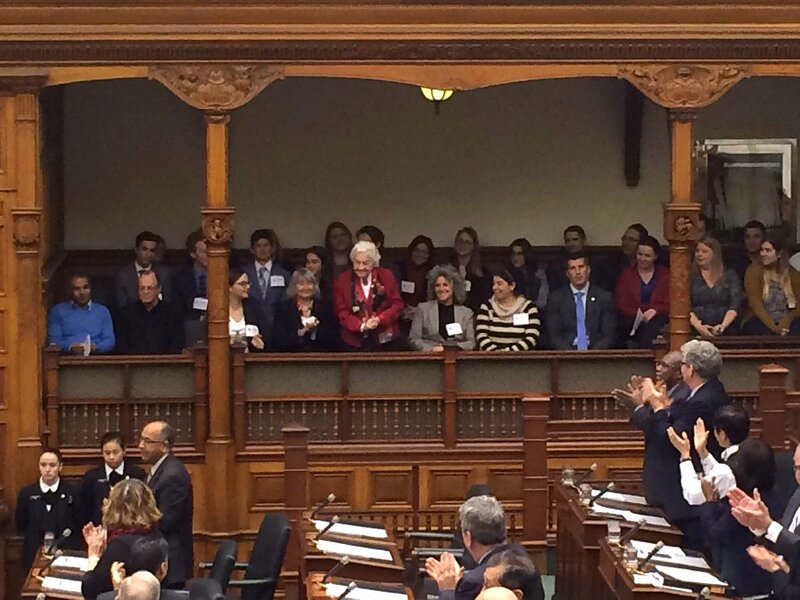 MPP Mangat's legislation, Bill 16, received support from all parties and became law on December 8, 2016 when the Ontario Legislature proclaimed February 14 of each year as Hazel McCallion Day. The entire community is invited to come together to celebrate the life and accomplishments of "Hurricane Hazel" - a larger than life public servant who shaped Mississauga's future and always put our community first. RSVP to: hazelmccallionday.com but you do NOT need to bring a printed copy of your ticket to the event. Celebrating Hazel McCallion's 96th Birthday on Hazel McCallion Day 2017 . YouTube video, 13:53 min. Published on Mar 5, 2017 by sq1oac2. Hazel McCallion Day Community Reception is held at Mississauga Civic Centre on Tuesday, February 14, 2017, from 1:00 - 3:00 pm. 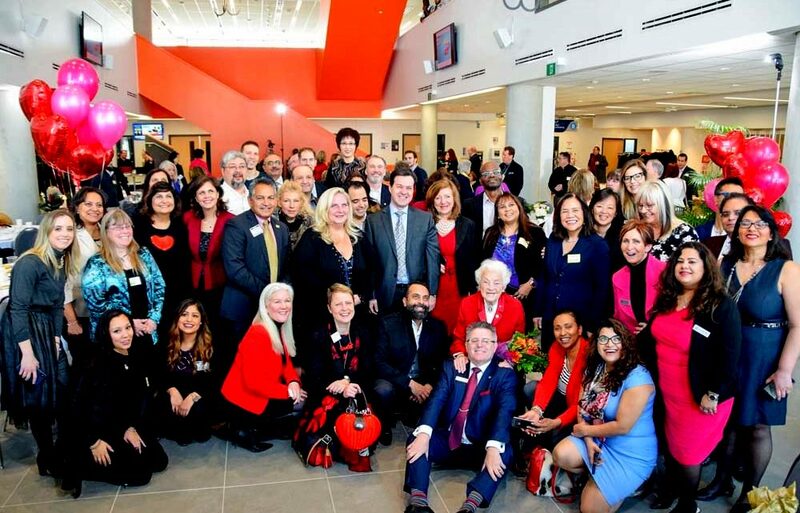 To mark this important milestone, Mississauga Mayor Bonnie Crombie and Mississauga-Brampton South MPP Amrit Mangat host a community reception ceremony attended by former mayor Hazel McCallion, Council, dignitaries and members of the community. Hazel McCallion Day Celebration. The celebration of the first Hazel McCallion Day in Ontario takes place in the Hazel McCallion Hall at the Vic Johnston Community Centre, 335 Church St, Mississauga ON L5M 2C2 on Tuesday, February 14, 2017 from 4:00 - 8:00 pm. You are cordially invited to celebrate the first Hazel McCallion Day in the Province of Ontario with special guest Hazel McCallion. Come share this momentous and historic occasion. FREE Admission for All Ages. FREE public drop in with light refreshments, snacks and a cash bar. Hazel McCallion Day Celebration at Vic Johnston CC 14 Feb 2017. YouTube video, 4:31 min. Published on Feb 22, 2017 by sq1oac2. February 14, 2017 marks the very first Hazel McCallion Day (Hazel McCallion Day Act, 2016 - Bill 16) in the Province of Ontario. Hazel thanks the Lord for her good health as she turns 96 on this day. Thank You Speech by Hazel McCallion on Hazel McCallion Day 2017 . YouTube video, 7:34 min. Published on Feb 27, 2017 by sq1oac2. An energetic 96-year-old former mayor Hazel McCallion expresses her gratitude for all the people who came together on this first Hazel McCallion Day to remember, acknowledge and appreciate her 36 years of hard work as Mayor of the City of Mississauga. "Aren't we proud to be members of this great city!" Mayor Bonnie Crombie pays tribute to former mayor Hazel McCallion. YouTube video, 8:11 min. Published on Feb 26, 2017 by sq1oac2. 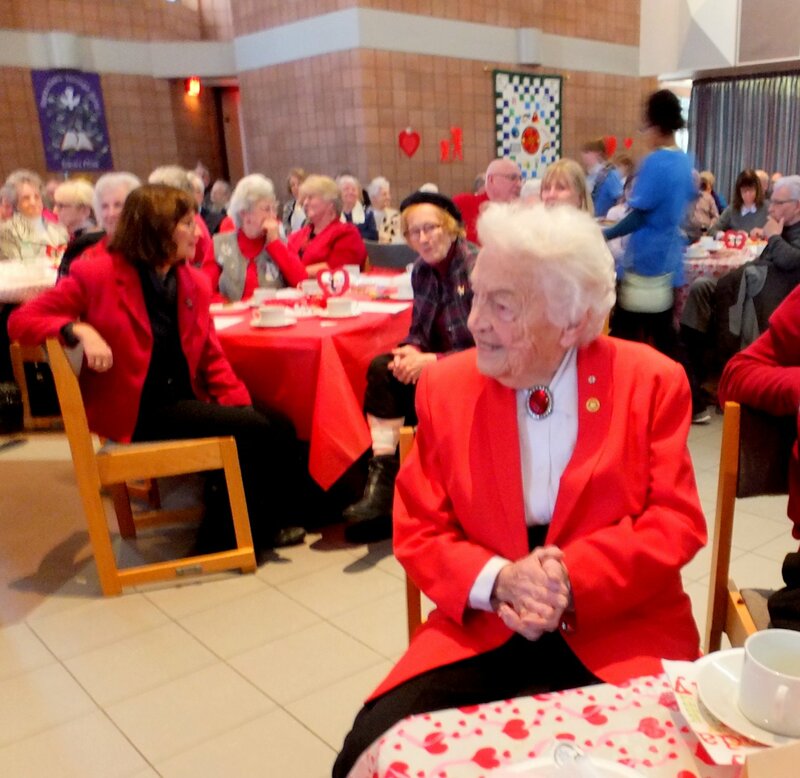 Mississauga Mayor Bonnie Crombie has high praises for former mayor Hazel McCallion at the first Hazel McCallion Day Celebration held in Streetsville, at Hazel McCallion Hall, Vic Johnston Community Centre on Hazel's 96th birthday, 14 February 2017. Accolades for Hazel McCallion on Hazel McCallion Day 14 Feb 2017. YouTube video, 13:50 min. Published on Mar 14, 2017 by sq1oac2. "Thank you, Hazel" - Appreciation and praises for former City of Mississauga mayor Hazel McCallion on the first Hazel McCallion Day Celebration held at Vic Johnston Community Centre, on McCallion's 96th Birthday, February 14, 2017 from 4 to 8 pm. Genuine accolades were bestowed upon Hazel McCallion from: Peel Region Police Chief: Jennifer Evans; Past Chairman of Carassauga Festival: Jack A. Prazeres; City of Mississauga Ward 6 Councillor: Ron Starr; CEO, President and Owner of Paramount Find Foods: Mohamad Fakih; Senior Station Manager of Rogers TV: Jake Dheer; Bread & Honey Coordinator: Sandy Pitts; One of the Founders of Ontario Women's Hockey Association: Fran Rider; Board Chair of Trillium Health Partners Foundation: Dr. Colin Saldanha; Representative from Riverwood Conservancy, and Master of Ceremony: Randy. 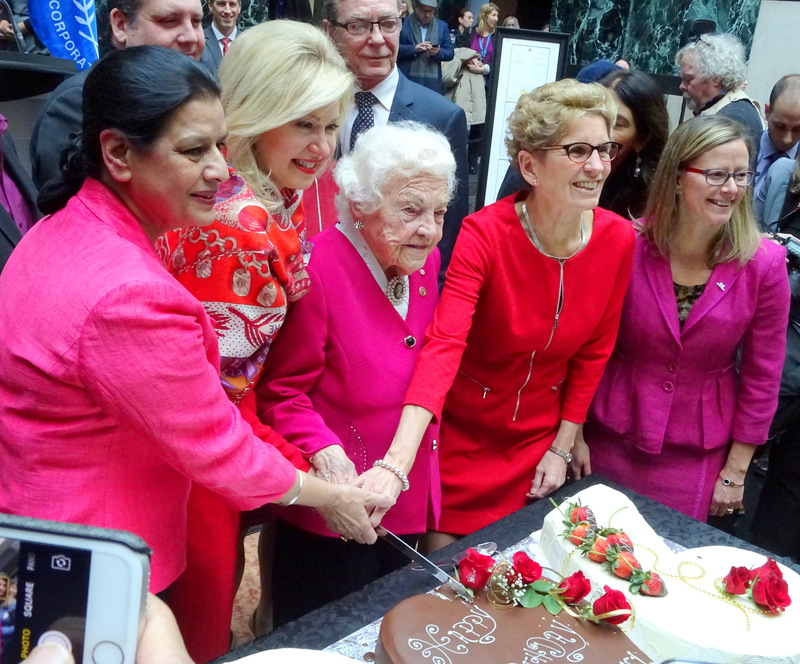 Standing with Hazel behind the birthday cake while the crowd sings "Happy Birthday to Hazel" are: Erika McCallion (Hazel's grand-daughter), MPP Amrit Mangat, Hazel McCallion, and Mayor Bonnie Crombie. "You have inspired us all" MPP Amrit Mangat to Hazel McCallion 14 Feb 2017. YouTube video, 3:41 min. Published on Mar 13, 2017 by sq1oac2. "You have inspired us all" says Mississauga-Brampton South MPP Amrit Mangat in her Thank-You speech to former Mississauga mayor Hazel McCallion for all that she has done for the City of Mississauga at the Hazel McCallion Day Celebration held at Vic Johnston Community Centre in the evening of February 14, 2017. Hazel McCallion Day. YouTube video, 1:05 min. Published on Feb 15, 2017 by Oakville Sun & Entrepreneurial Journalism. 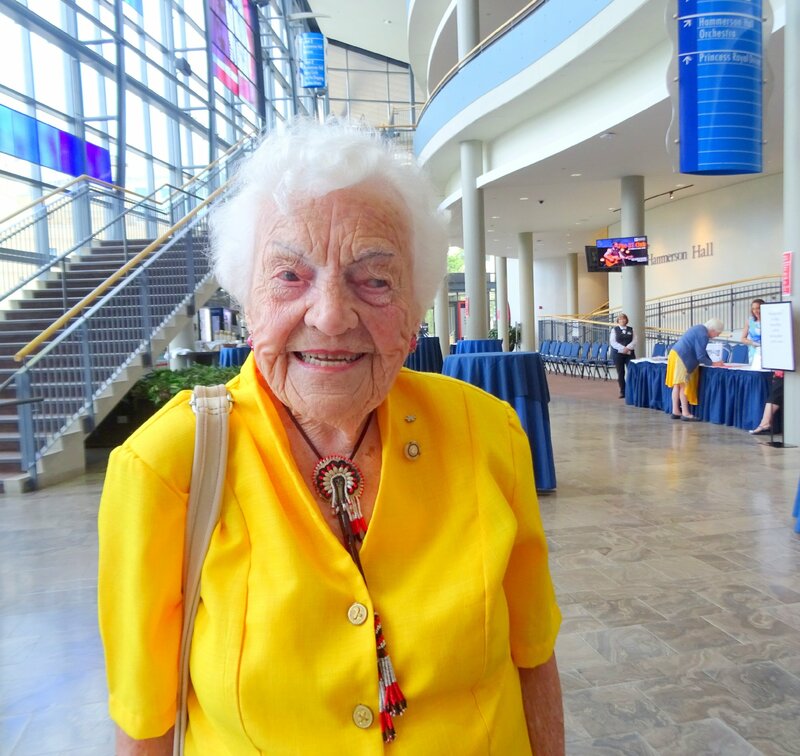 "Interviewed the inspirational Hazel McCallion - the Mississauga Mayor who served for 36 years - for first ever Hazel McCallion Day Celebrations." Hazel McCallion Day Celebration from SNAPD North Mississauga, March 2017. Photos by Duaine Menezes and Irfan Malik. Website code: . 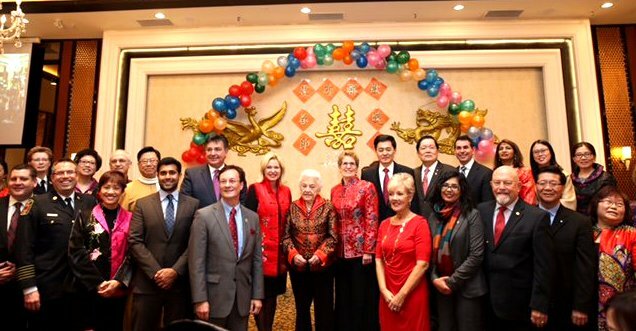 Hazel McCallion speaks at MCBA Chinese New Year Reception 2017. YouTube video, 1:53 min. Published on Feb 11, 2017 by sq1oac2. Hazel McCallion tells province to slow down plans to curb sprawl by San Grewal, Urban Affairs Reporter, Toronto Star, Dec 23, 2016. Former Mississauga Mayor Hazel McCallion, long called the "Queen of Sprawl", is an advisor to Premier Kathleen Wynne on GTHA [Greater Toronto and Hamilton Area] matters. "'The province needs to slow down and get the details right on how we're going to implement new policies and accommodate the inevitable growth,' McCallion said in a Thursday press release." 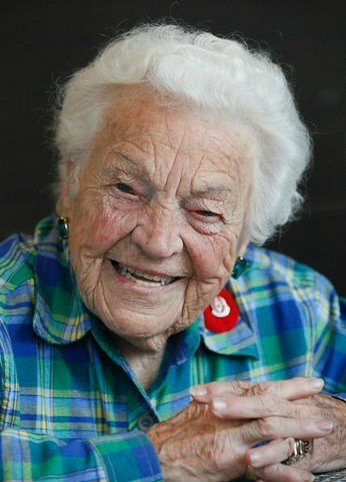 February 14th - Valentine's Day is now Hazel McCallion Day in Ontario by Ron Duquette, ModernMississauga.com, December 9, 2016. Article includes group photo: Hazel McCallion with Charles Sousa (MPP for Mississauga South), Amrit Mangat (MPP for Mississauga-Brampton South), Ron Duquette (President and Founder of Mississauga's Legend's Row), Fran Rider (Order of Canada, Order of Ontario, and one of the Founders of the Ontario Women's Hockey Association), and many others. "In honour of her lifetime of contributions, it is appropriate to recognize February 14th (McCallion's birthday) in each year as Hazel McCallion Day in Ontario. 1. February 14th in each year is proclaimed as Hazel McCallion Day. 3. The short title of this Act is the Hazel McCallion Day Act, 2016." Bill 16, Hazel McCallion Day Act, 2016 from Legislative Assembly of Ontario, 8 Dec. 2016. 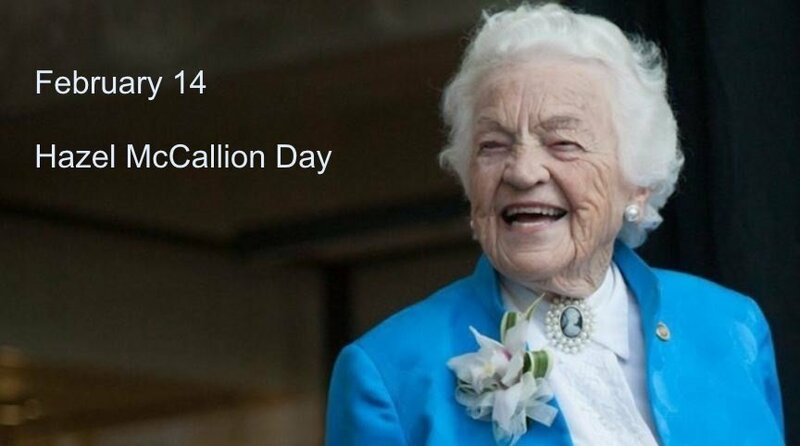 "In honour of her lifetime of contributions, it is appropriate to recognize February 14th (McCallion's birthday) in each year as Hazel McCallion Day in Ontario. Hurricane Hazel on hand as #onpoli legislature proclaims Feb. 14 (her bday) as Hazel McCallion Day from Allison Jones on Twitter@allisonjones. Hazel McCallion finally gets her day by Chris Clay, Mississauga News, Dec. 8, 2016. 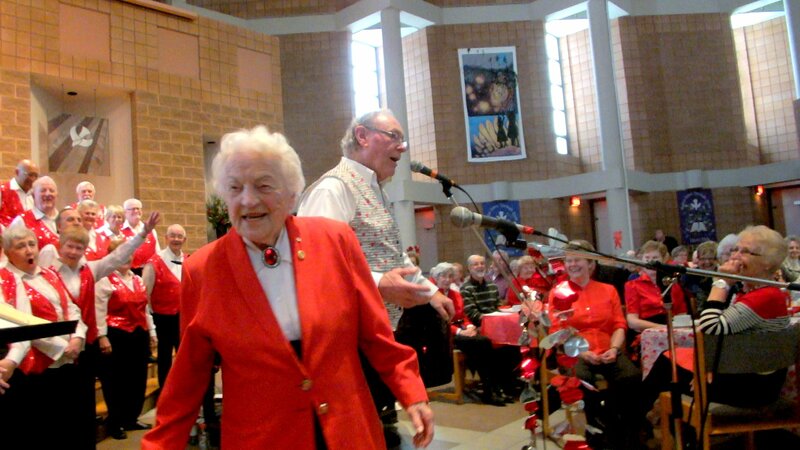 "It's no longer Valentine's Day in Ontario - from now on, Feb. 14 will be known as Hazel McCallion Day. A private member's bill introduced by Mississauga-Brampton South MPP Amrit Mangat into the Ontario legislature earlier this year was unanimously approved by MPPs at its third reading before gaining royal assent on Thursday, Dec. 8. Bill 16 names Feb. 14, which is the long-time mayor's birthday, Hazel McCallion Day. McCallion was at Queen's Park to witness the honour ..."
Dare to Be Social Tea. 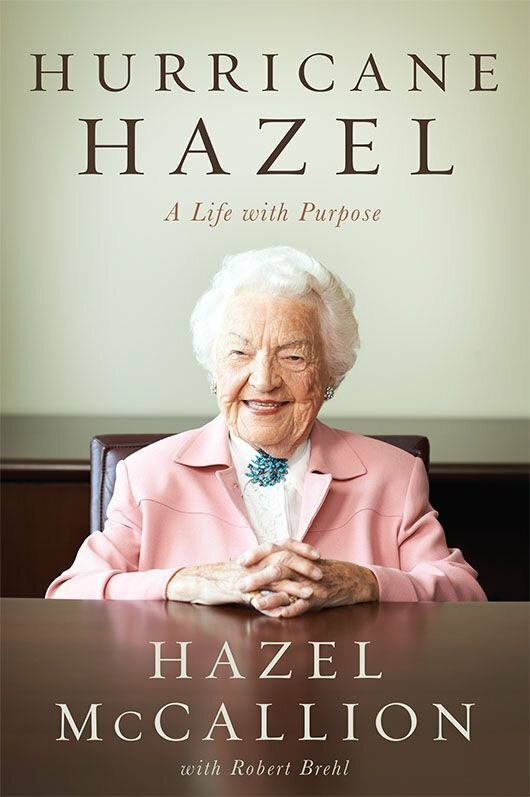 "Making Memories with Hazel McCallion" - Hear the former mayor of Mississauga share tales from her time in office and her latest book "A Life with Purpose." Special Lifestyle report: "Former mayor McCallion guides youth of today" by Zaineb Survery, published in Mississauga News, 11 Nov. 2016, p. 26. "At an intimate Dare to Be Social Tea event ... last Sunday [6 Nov. 2016], McCallion inspired youths ages 7-18 with principles she directly learned as a member of the Girl Guides, and applied before and after public office. 'Be prepared' ... 'Have discipline' ... 'Be committed' ... she said. Her own commitment to Girl Guides sparked at Saint Jean, Quebec in 1940, and stuck as she became a Divisional Girl Guide Commissioner for Mississauga by the mid-1960s. Her commitment was further displayed having co-signed a $10,000 loan in 1964 for a campground - still used today ... Finally, she stressed to the youth, 'Be independent,' having earned her first dollar at age fourteen. Now she cautions retirees on the secret of long life. 'When you lose the desire to look after yourself,' she said, 'You get old quickly.' ... She ended on a typically positive note. 'No matter how old you are, never stop contributing.' How true. How Hazel." Hazel McCallion part of fundraising event for Women's College Hospital by Chris Clay, 8 Nov 2016, Mississauga News. "Former Mississauga Mayor Hazel McCallion is taking part in a panel discussion to raise funds for Toronto's Women's College Hospital. The sixth annual Women for Women luncheon happens Thursday, Nov. 10 at the Fairmont Royal York and will feature a number of panellists. They include McCallion as well as moderator Dr. Danielle Martin and Dr. Onil Bhattacharyya. The panel discussion will focus on a variety of subjects, including the complexities of aging ... aging with dignity, among others." 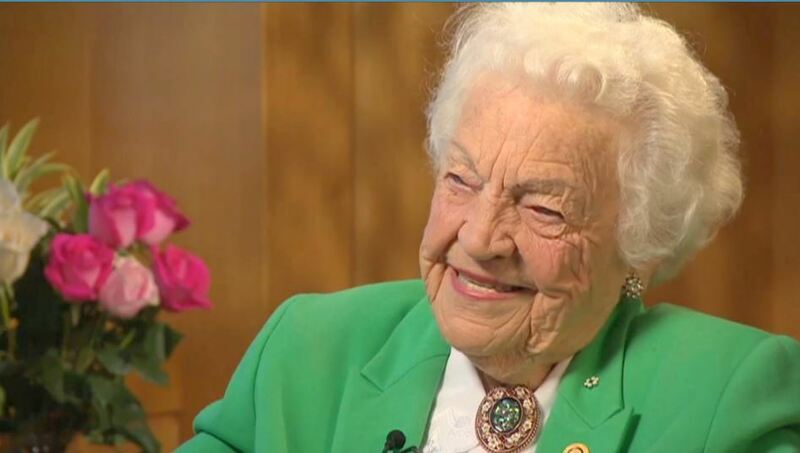 95-year-old Hazel McCallion shares her tips on living a happy, healthy life. YouTube video, 4:37 min. Published on Nov 7, 2016 by Breakfast Television. "'Hurrican Hazel' remains a force of nature. 'I'm busy everyday ... I don't have any time on my hands ... I love to be with people ... You've got to stay active physically as well as mentally.' The inspiring former Mayor of Mississauga, Hazel McCallion shares her secrets to remaining fit at age 95!" Mississauga Guide Centre Inaugural Memory Wall from Girl Guides of Canada. The Mississauga Girl Guide Centre (MGGC) is welcoming names of those to be inducted onto a new "Memory Wall" to be established at the MGGC. The wall will be unveiled at a November 6, 2016 event, 1:00 - 3:00 pm, Dare To Be Social Tea "Making Memories with Hazel McCallion". Former mayor Hazel McCallion will share tales from her time in office and from her latest book "Hurricane Hazel: A Life with Purpose". 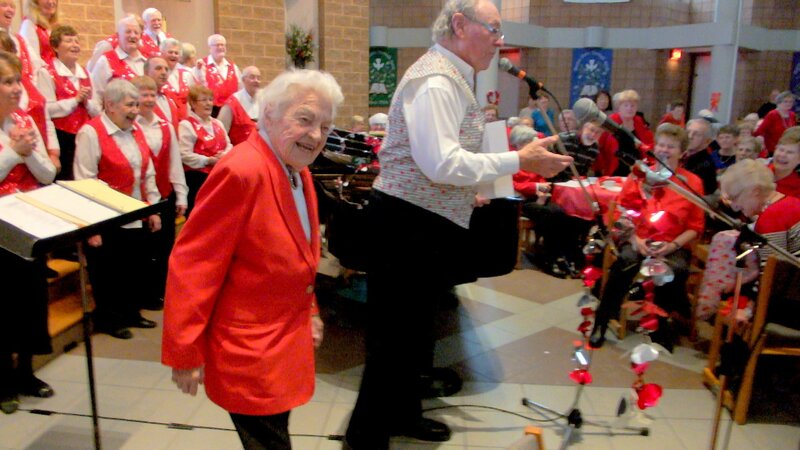 Mississauga Festival Choir brings in Hazel McCallion for Christmas concert by Chris Clay, Mississauga News, Oct 2 2016. "The Mississauga Festival Choir is bringing in a special guest and Mississauga's most famous politician to help celebrate the holiday season. The 150-voice choir, which has been around for more than three decades, has enlisted former Mississauga mayor Hazel McCallion and the Mississauga Symphony Orchestra to perform at their A Mississauga Christmas concert on Dec. 3 at the Living Arts Centre. The concert will feature both traditional and new holiday music plus a special presentation of 'Twas the Night Before Christmas with McCallion serving as the narrator." Three Lions Dance 2016 Community Crime Awareness Day. YouTube video, 2:36 min. Published on Oct 2, 2016 by sq1oac2. Lion dance by Black, White and Red Lions. From Eye Dotting ceremony (performed by former mayor Hazel McCallion as one of the participating VIPs) to Lettuce Feeding and Lucky Money tradition at the annual Community Crime Awareness Day. Event held at Mississauga Celebration Square on September 24, 2016, hosted by the Mississauga Chinese Business Association (MCBA) in partnership with Peel Regional Police, Rogers TV, and SafeCity Mississauga Crime Prevention. Hazel McCallion presents certificates to Money and Youth graduates. YouTube video, 1:27 min. Published 30 Sep 2016 by sq1oac2. 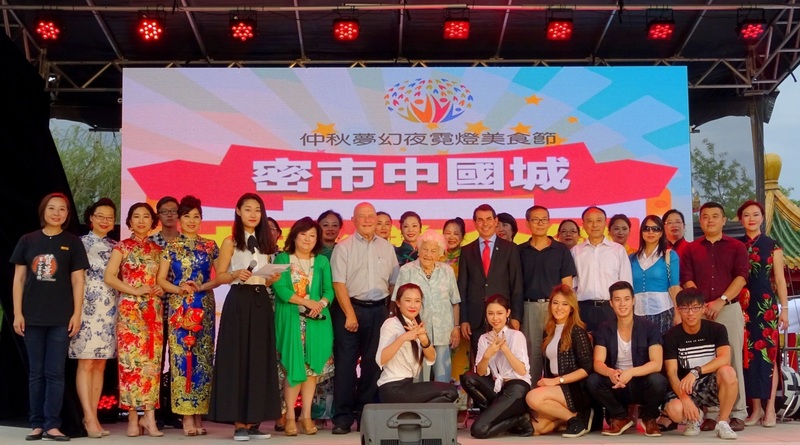 At the 2016 Community Crime Awareness Day (CCAD) event held at Mississauga Celebration Square, former mayor Hazel McCallion presents certificates to graduates of Money and Youth, an education program sponsored by Pierre Wong, Co-Chair of CCAD an event hosted by Mississauga Chinese Business Association (MCBA). MPP Mangat reintroduces bill to recognize Hazel McCallion. 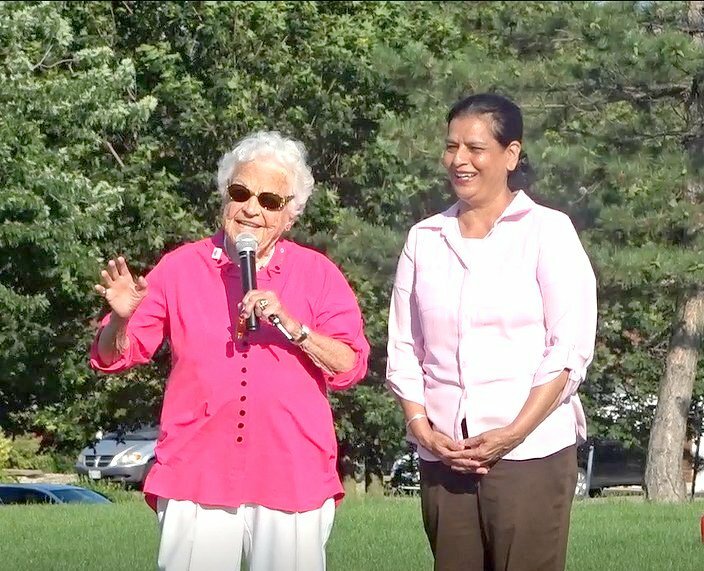 (Queen's Park) - "This afternoon [Thursday, September 15, 2016], MPP Amrit Mangat reintroduced legislation to create a special day for one of Mississauga's most popular and best known, former mayor Hazel McCallion. The legislation, now known as Bill 16, will if passed establish February 14th (McCallion's birthday) of each year as Hazel McCallion Day in Ontario. MPP Mangat previously introduced this legislation as Bill 215 in June of 2016. The government's decision to prorogue the Ontario Legislature, however, meant that the bill needed to be reintroduced. Bills are given a number which corresponds to the order of introduction." Feb. 14 could soon be Hazel McCallion Day, if Queen's Park passes private member's bill. Mississauga-Brampton South MPP Amrit Mangat proposes marking McCallion's birthday, Mississauga News, 13 Sep 2016. Bill 215, Hazel McCallion Day Act, 2016. 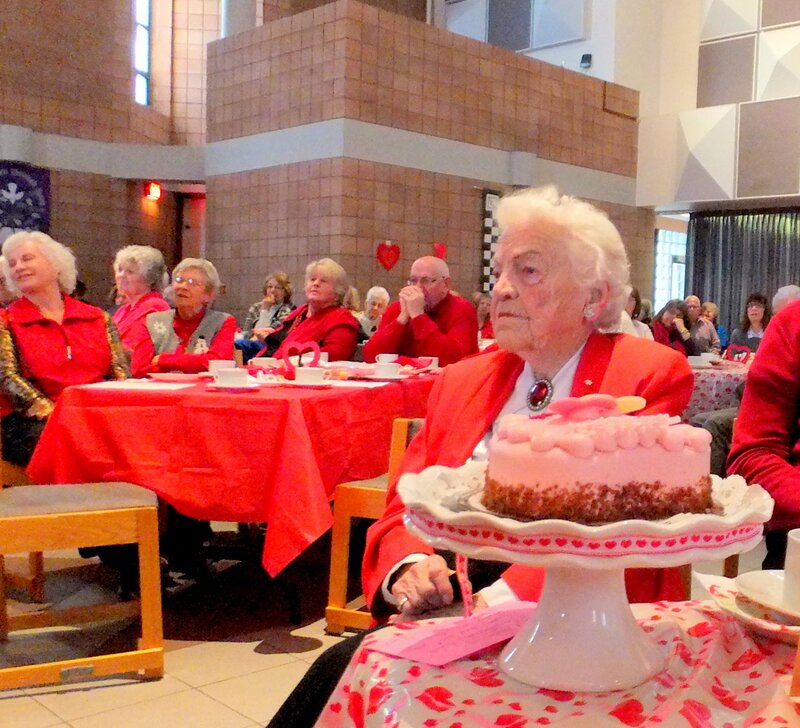 Mississauga-Brampton South MPP Amrit Mangat has introduced a Private Member's bill in the Ontario Legislature proclaiming February 14, Hazel McCallion's birthday and Valentine's Day, as Hazel McCallion Day. Current Status: First Reading Carried, June 8, 2016. 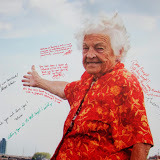 Petition in Support of Bill 215, Hazel McCallion Day Act, 2016 - A petition to recognize Hazel McCallion's historic contributions to Mississauga residents and to encourage young people to engage in political life. 13 Sep 2016. Photos by I Lee. On September 13, 2016, Hazel McCallion speaks to a packed audience at King Gardens Retirement Residence by Revera sharing her insights about the challenges of aging in today's society, and how to LIVE LIFE TO THE FULLEST. Revera's Chief Elder Officer Hazel McCallion is a highly respected leader who has achieved success in a variety of different life pursuits. Hazel has a great sense of humour and is a fun-loving, warm and compassionate participant in Revera's Age is More Program - a program about showcasing and celebrating the ageless spirit of people. 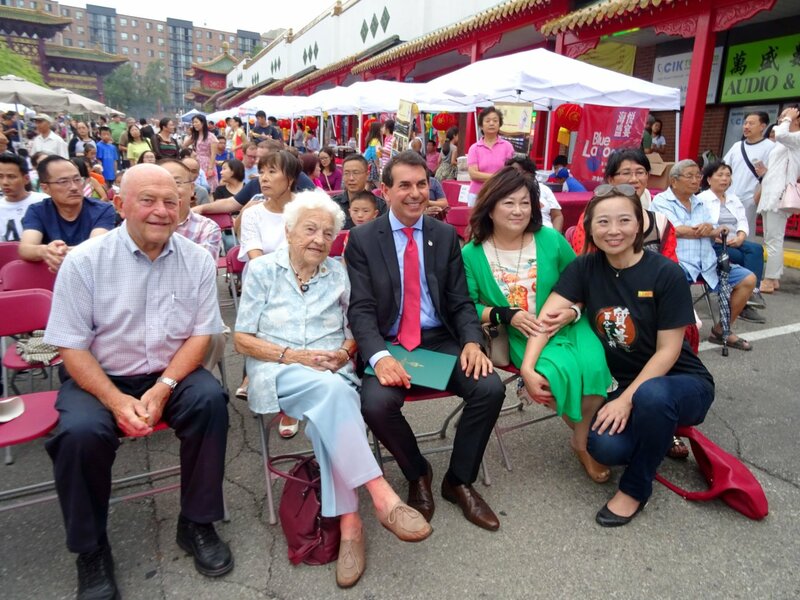 Hazel McCallion and Peter Fonseca at Chinese Mid-Autumn Festival. YouTube video, 4:14 min. Published on Sep 10, 2016 by Sq1oac2. Former Mayor Hazel McCallion and Peter Fonseca, Member of Parliament for Mississauga East - Cooksville, speak at Mississauga Mid-Autumn Harvest Festival and Night Market held at Mississauga Chinese Centre or Mississauga Chinatown, Saturday, September 10, 2016. 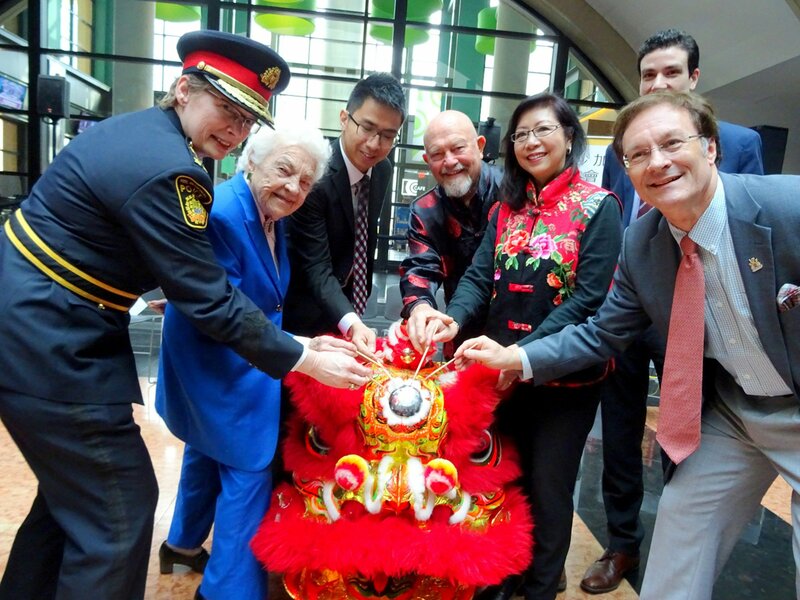 "When the Mississauga Chinese Centre, covering 10 acres, was officially opened in 1987 by Mayor Hazel McCallion, it included a replica of a Nine-Dragon Wall, a Soo Chow Garden, pagoda, pond, stone sculptures and a facsimile of the Great Wall. But it was the main entrance gateway, depicted on the stamp, that was the piéce de rèsistance. Towering 43 feet, it was built with 17,000 cubic metres of timber. Not a single nail - only wooden studs - was used in the construction, which was based on traditional Chinese building techniques." 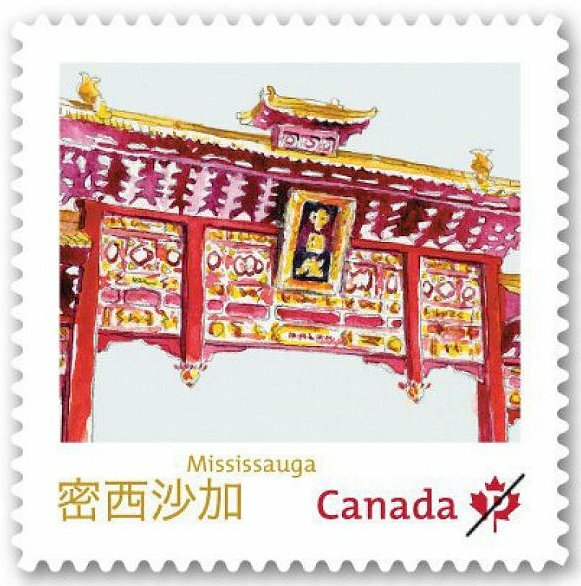 ~ Joseph Chin, "Mississauga's Chinese gate depicted on stamp", Mississauga News, May 1, 2013. 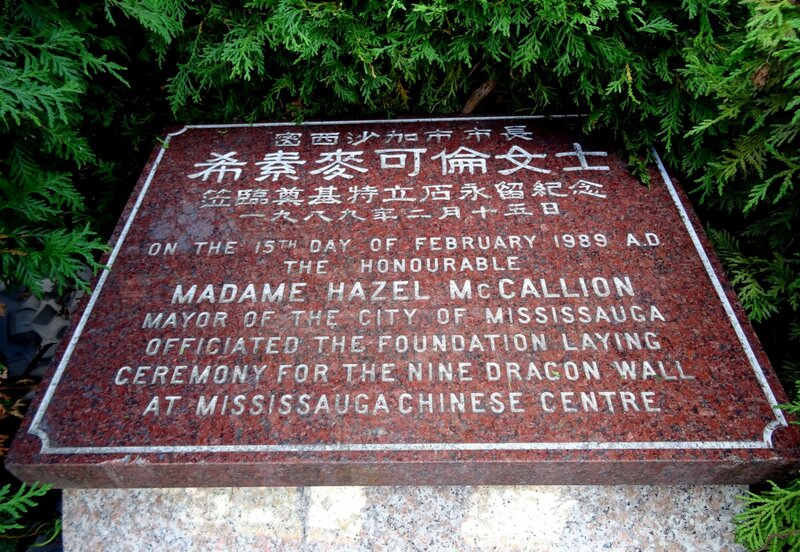 On the 15th day of February 1989, A.D., the Honourable Madame Hazel McCallion, Mayor of the City of Mississauga, officiated the Foundation Laying Ceremony for the Nine Dragon Wall at Mississauga Chinese Centre. 'Age is a matter of mind; you're only as old as you think,' said McCallion ... ''I'm 95, but I think I'm only 55. Your age is strictly a figure and it's your approach to life that's important.' ... Now that she's moved into a retirement home, she visits with her children; no longer does she require a list of things for them to do for her ... 'You take the things that you're attached to and all the others are all in your mind.'" Former Mississauga mayor Hazel McCallion to host growth summit in York Region by Lisa Queen, Newmarket Era, Aug 26 2016. "Former Mississauga mayor Hazel McCallion will host a summit in York Region, saying she has 'grave concerns' about proposed updates to provincial growth plans for the Greater Toronto and Hamilton Area. The Sept. 30 meeting at the regional headquarters in Newmarket aims to get a consensus from mayors and regional chairs on plans for future development in the sprawling region and then present a united front to Queen's Park, McCallion said. 'I have concerns about it, very grave concerns,' said McCallion, the liaison officer between GTHA municipalities and Premier Kathleen Wynne". Ideal Honda, located at Dixie Road and Highway 401 in Mississauga, had its Grand Opening on Wednesday, August 17, 2016. Event was attended by former mayor Hazel McCallion, current mayor Bonnie Crombie, CEO and President of Toyotoshi Group Canada: Mario Toyotoshi, CEO and President of Honda Canada Inc.: Jerry Chenkin, VP, Sales and Marketing: Jean Marc, Ambassador Naoyuki Toyotoshi, Executive President and Chairman, Toyotoshi S.A.: Marcelo Toyotoshi, and others, including performers from Sakuramai, a Toronto Japanese Yosakoi dance group. Former Mississauga mayor Hazel McCallion backs taxi industry in battle with Uber by Rachael Williams, Mississauga News, July 6, 2016. "In a show of support for the taxi industry, former mayor Hazel McCallion submitted a letter to council recommending Uber be governed the same way as cab drivers in Mississauga ... her letter makes it clear that council has an obligation to protect the taxi industry from invasive technologies such as Uber. 'After all, they have played by the rules we set down,' wrote McCallion." Hazel McCallion Canada Day Parade, 1 July 2016.
from SNAPD South Mississauga, August 2016. 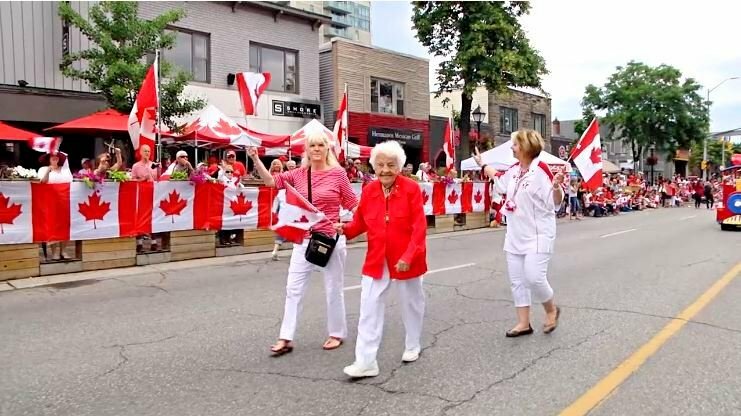 "Canada Day celebrations in Port Credit started with the Hazel McCallion Canada Day Parade. People lined Lakeshore to see the parade's floats, marching bands, classic cars and Mr. Takenaka, Mayor of Kariya, Japan, Mississauga's sister city. 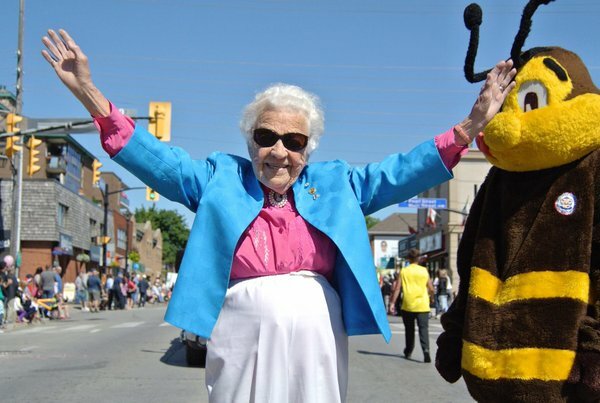 Of course, Hazel McCallion was once again walking in the parade, as she has for many years. The end of the parade featured the giant cake cutting ceremony ..." ~ Jay Ward. Hazel McCallion Book Signing from SNAPD North Mississauga, July 2016, p. 19. Photos and event by Riya Singh, Website code: peww6j7. "Credit River Retirement Residence hosted a book signing for former Mississauga mayor Hazel McCallion on June 15, 2016." 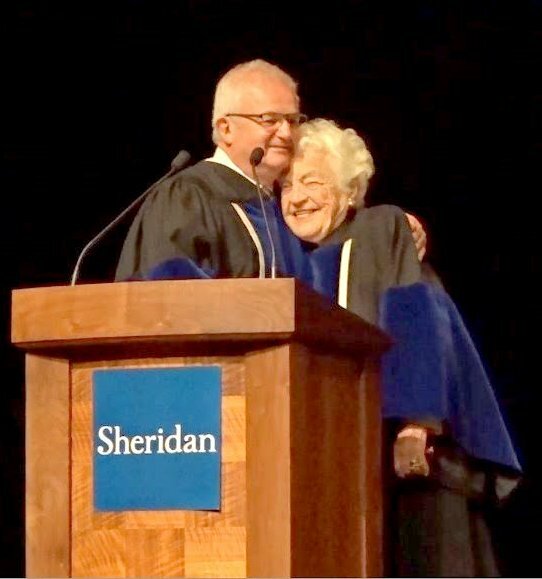 Sheridan College officially installs Hazel McCallion as chancellor by Jason Spencer, Mississauga News, June 6, 2016. Chancellor McCallion, Staff photo by Bryon Johnson. 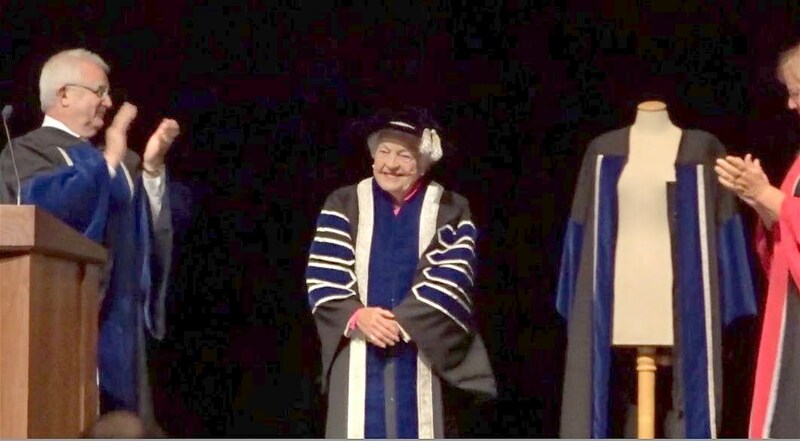 Former Mississauga mayor Hazel McCallion was installed as Sheridan College's first chancellor Monday at the Living Arts Centre. 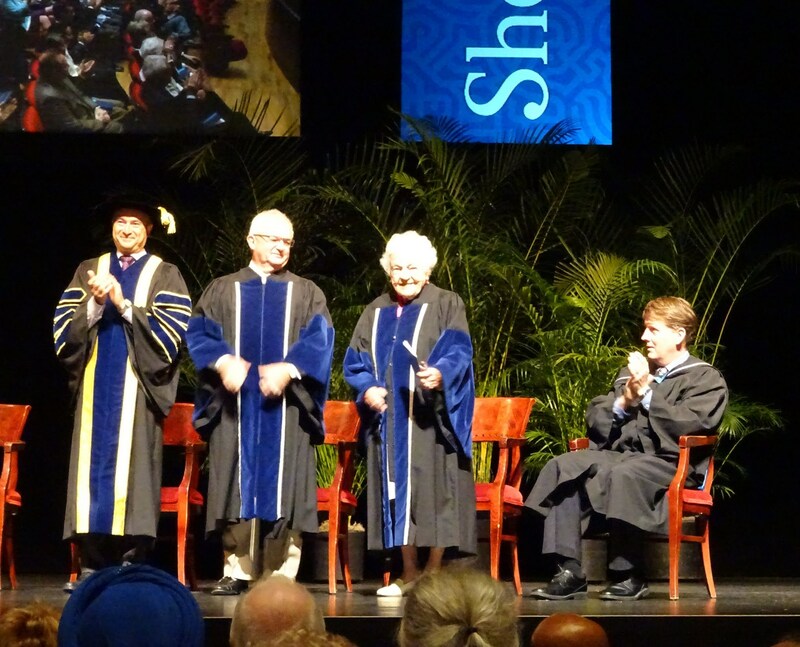 "It's official: former Mississauga mayor Hazel McCallion is the first chancellor of Sheridan College. McCallion was sworn in during an installation ceremony Monday at the Living Arts Centre in Mississauga. She'll have all week to get used to the ornate robe and hat that comes with the territory as she attends several Sheridan graduation ceremonies taking place at the city centre venue." 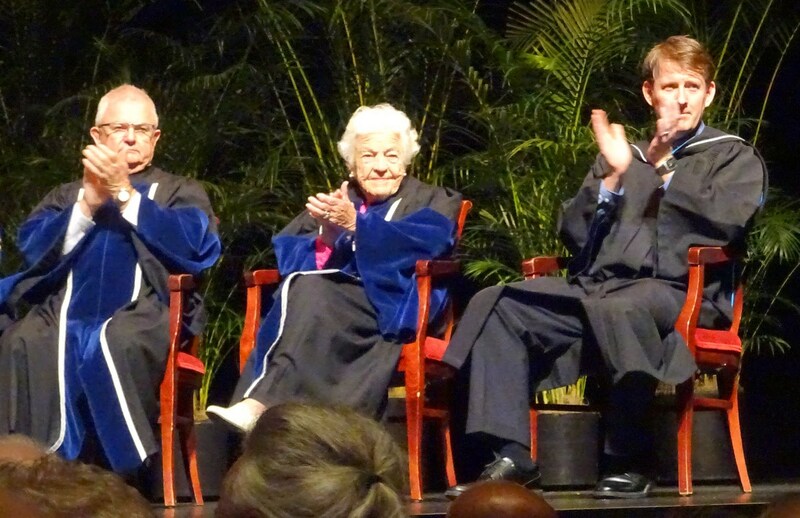 Installation of Sheridan's inaugural Chancellor, Hazel McCallion. YouTube video, 38:05 min. Video by Sheridan Production House. About the Chancellor: Hazel McCallion. 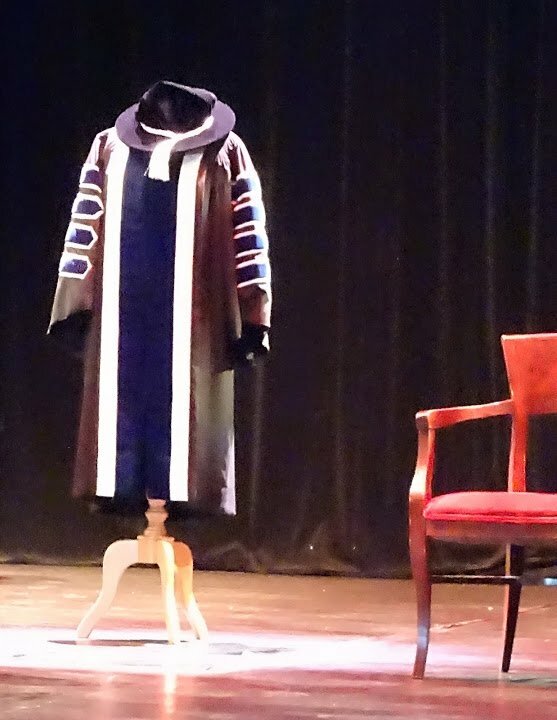 "The Chancellor serves as the ceremonial head of Sheridan, presiding over convocation ceremonies and serving as an ambassador for the institution. The Chancellor is appointed by the Board of Governors. 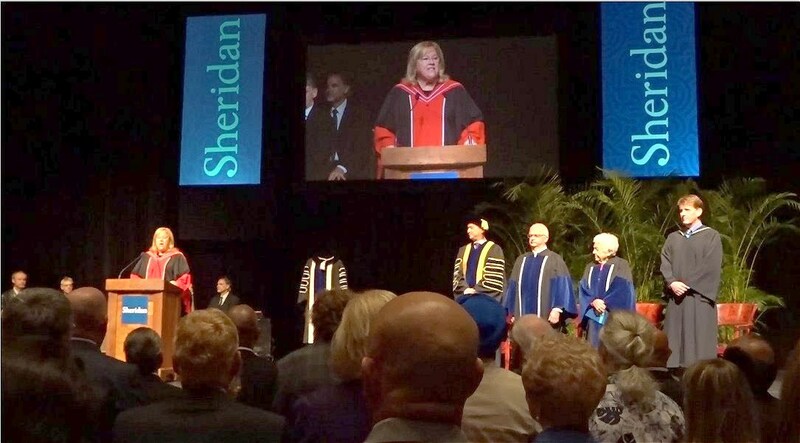 The appointment of our inaugural Chancellor is a historic moment for Sheridan - it is an important milestone in our ongoing transition to become Sheridan University." Hazel McCallion Installed as Sheridan's Inaugural Chancellor from CNW, Cision and PR Newswire, June 6, 2016. 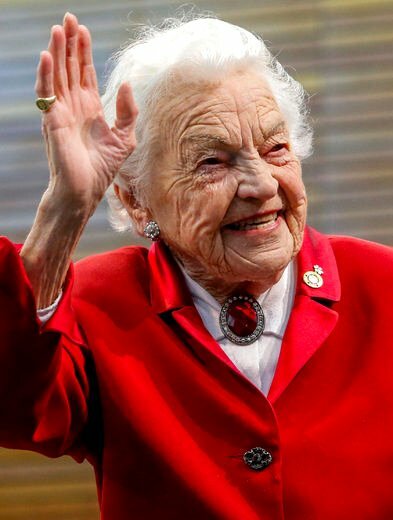 "Hazel McCallion, the longest-serving Mayor in Mississauga's history who has received countless honours in her long and storied career, today embarked on a new challenge at the age of 95. In a formal ceremony held at the Living Arts Centre in Mississauga this morning, attended by local dignitaries, Sheridan employees and students, and members of the general public, McCallion was sworn in as the inaugural Chancellor of Sheridan. 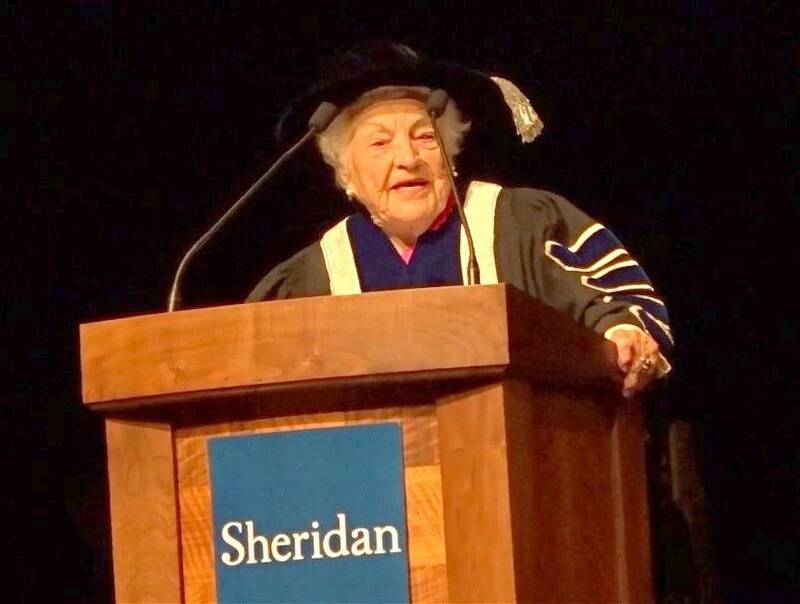 br> In her installation address, Chancellor McCallion stated, 'I will do whatever I can to make sure that every student who enters Sheridan knows that every door can open before them - whether they start or finish here with an advanced certificate, diploma, skilled trade or undergraduate degree.'" Ageism is just another form of prejudice and Canada is failing its seniors, says McCallion by Radhika Panjwani, Mississauga News, June 1, 2016. 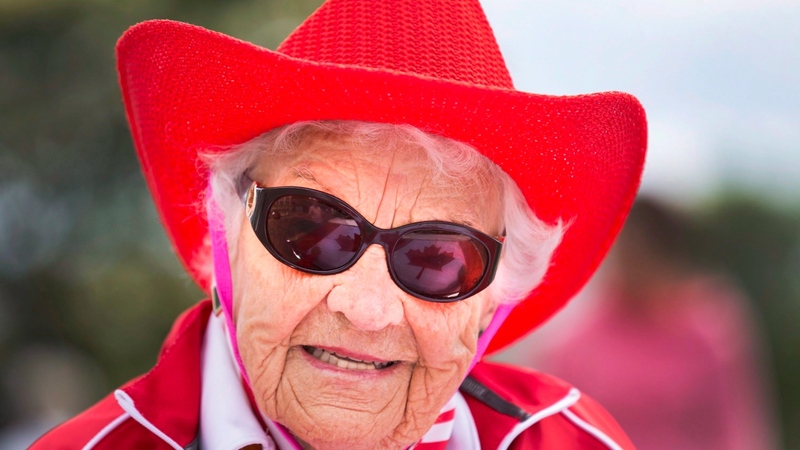 "Hazel McCallion, 95, former Mississauga mayor and the Chief Elder Officer (CEO) for Revera Inc. said when it comes to attitudes and shifts, Canada is failing its seniors. 'Sheridan College undertook this research project and they have come up with some excellent recommendations,' said McCallion. 'They looked at the situation across the country and to what's happening to seniors and how seniors are looked after in the community and the neglect of seniors. The idea is to make aging another part of the highway of life by giving seniors a choice rather than decisions being made on their behalf.'" Toronto's Tribute Dinner held at Fairmont Royal York Hotel, Toronto, May 25, 2016. 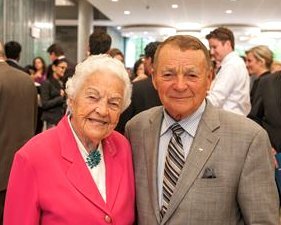 Thank you to everyone who attended the 2016 Toronto's Tribute Dinner honouring Hazel McCallion, former Mayor of Mississauga. The Canadian Room of the Royal York Hotel was brimming with guests, including Mississauga Mayor Bonnie Crombie, family members, friends, supporters, politicians and business contacts all to pay tribute to Hazel McCallion. from SNAPD North Mississauga, June 2016, p. 5. "Members of the festival [Bread and Honey Festival 2016] committee, board members from the Streetsville BIA, MPP leader Bob Delaney, former Mayor of Mississauga, Hazel McCallion, residents of Credit Valley Retirement Residence and other notable organizations graced the media launch in May." ~ Siddharth Devalla. 2016 MARTY Awards - Event held on Thursday, May 19, 2016, 5:30 - 9:30 pm at Mississauga Convention Centre, 75 Derry Road, Mississauga ON L5W 1G3 Canada. "The MARTY Awards, coined the 'Mississauga Oscars' was back to present prestigious awards to the best and brightest talents in the city in 19 different categories with 84 nominees, making it the biggest arts awards gala night in town. Attended by the most important people in the city [including former mayor Hazel McCallion], the auditorium was floored with families and friends of the nominees, board members of the Mississauga Arts Council and Livings Arts Centre." ~ Siddharth Devalla. - Event held on Sunday, May 15, 2016, 8:30 am - 3:00 pm at Trinity Hall Banquet Conference Centre, 1245 Eglinton Ave. W. Mississauga ON L5V 2M6, Canada. "The Annual General Meeting 2016 was hosted this year by The Streetsville Horticultural Society. District 15 currently has a total of 17 Horticultural Societies and Garden Clubs. Former Mayor Hazel McCallion, Ward 11 Councillor George Carlson and Ward 8 Councillor Matt Mahoney attended the well organized event." ~ Andrea Birbalsingh. from SNAPD South Mississauga, June 2016. 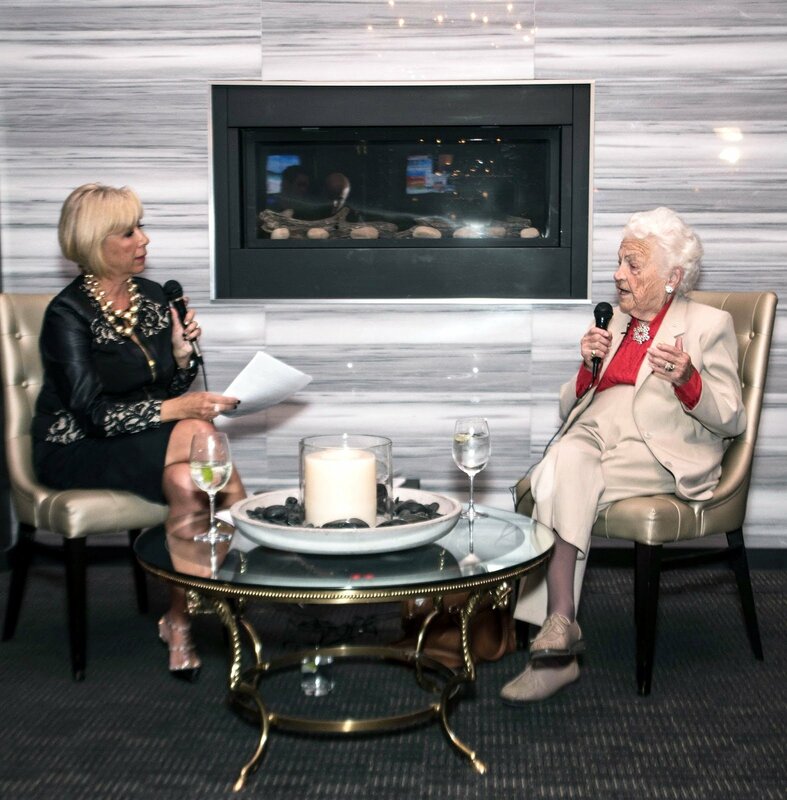 "She Has a Voice hosted a high tea with honoured guest Hazel McCallion on May 7, 2016 at Tu Casa Fine Dining. The event raised funds for She Has A Voice and their programs and workshops for youth and women ... Hazel was also on site signing copies of her book, Hurricane Hazel." ~ Nicole McGrattan. New Hazel McCallion Sportsmanship Award goes to ME051! "Congratulations ME051 Atom Red for winning the newly created Hazel McCallion Sportsmanship Award for adopting a senior's home and David & Hunter's story of kindness and courage ... Beloved former Mayor Hazel McCallion gave the crowd an enthusiastic speech about her love of hockey. 'Hockey is Canada's game!' McCallion told a cheering crowd of parents, coaches and players. McCallion said that she's proud to have her name on this special award." ~ Meadowvale Minor Hockey Association Newsletter, May 2016. Canadian woman to grace new bank note in 2018: Trudeau. YouTube video, 1:38 min. Kristy Kirkup, Videographer. Published on Mar 9, 2016 by The Canadian Press. Prime Minister Justin Trudeau says a new bank note to be released in 2018 will feature a Canadian woman. On Tuesday's International Women's Day [March 8, 2016], Finance Minister Bill Morneau said it was "high time" for the move. Prime Minister Trudeau and Bill Morneau, Finance Minister, spoke at a reception on Parliament Hill, where they were joined by dignitaries such as Hazel McCallion, Mississauga's former long-time mayor. Trudeau says new bank note will feature an iconic Canadian woman. Video: 9:21 min. Published on March 8, 2016 by CTVNews.ca Staff. 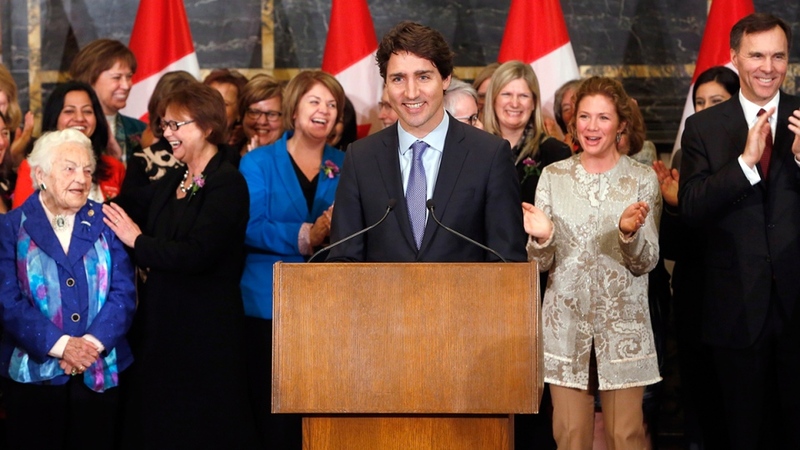 Prime Minister Justin Trudeau with his wife Sophie Gregoire-Trudeau and Finance Minister Bill Morneau (far right) along with women from his caucus as he acknowledges former Mississauga mayor Hazel McCallion (far left) on Parliament Hill in Ottawa, Tuesday, March 8, 2016. ●Canadian bank note to feature 'iconic' woman. Video: 1:37 min. Published by Toronto Star. Article by Bruce Campion-Smith, Ottawa Bureau, March 8, 2016. Opening Speaker: Hazel McCallion, Former Mayor, Mississauga (Ontario) at Trucking HR Canada, Women with Drive 2016 Leadership Summit, Crowne Plaza Toronto Airport, March 3, 2016. (Sorry, link no longer works). "Hazel continues to be on the board of the Ontario Women's Hockey Association and continues to be a driving force behind women's hockey - as Hazel says "the way hockey should be played - free of violence". 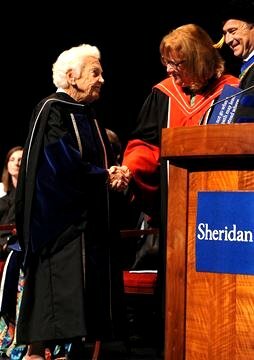 Hazel McCallion named as Inaugural Chancellor of Sheridan. Sheridan College, 23 Feb. 2016. "Dr. Jeff Zabudsky, Sheridan President and Vice Chancellor, today announced the appointment of former Mississauga Mayor, Hazel McCallion, as the institution's inaugural Chancellor. The announcement took place at Sheridan's Davis Campus in Brampton, Ontario, and was attended by local and regional dignitaries, including Brampton Mayor Linda Jeffrey, Mississauga Mayor Bonnie Crombie, and Amrit Mangat, MPP for Mississauga-Brampton South. As Chancellor, Ms. McCallion will serve as ceremonial leader of the institution, and will preside over Sheridan's annual Convocation ceremonies. She will be formally installed as Chancellor prior to the first Convocation ceremony scheduled to take place in June, 2016. The Chancellor is a voluntary, unpaid role, with a term of three years." Sheridan College adds Hazel McCallion as first chancellor by Louise Brown, Mississauga News, Feb 23 2016. "Busy former Mississauga mayor, who just turned 95, enlisted as college attempts leap to university status ... The former mayor, who turned 95 last week, is a natural fit for a school she has supported so fully that it named its latest campus after her, said Sheridan president Jeff Zabudsky ... 'She's a force of nature; I can't keep up with her. 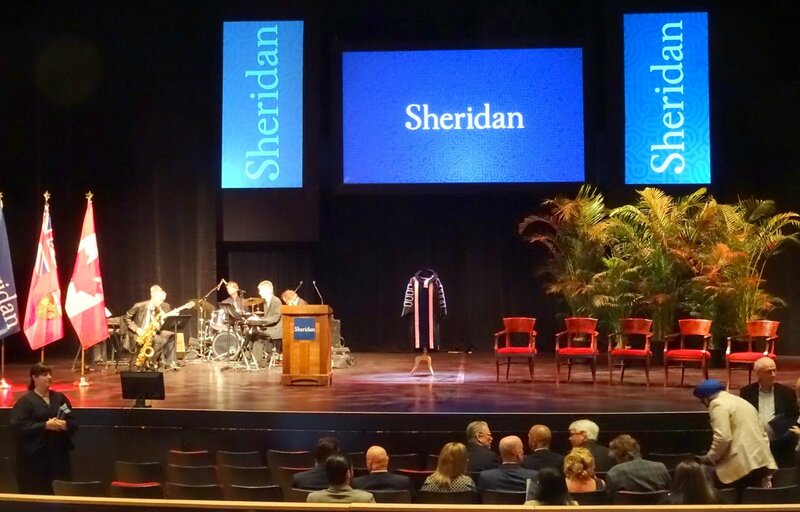 We're just happy to snap her up before her dance card gets full,' said Zabudsky, noting the appointment of a chancellor is one more step toward the goal of becoming Sheridan University by 2020." Hazel McCallion appointed first Sheridan College chancellor by Staff Torstar News Service, Toronto Metro. Published on Feb 23 2016. 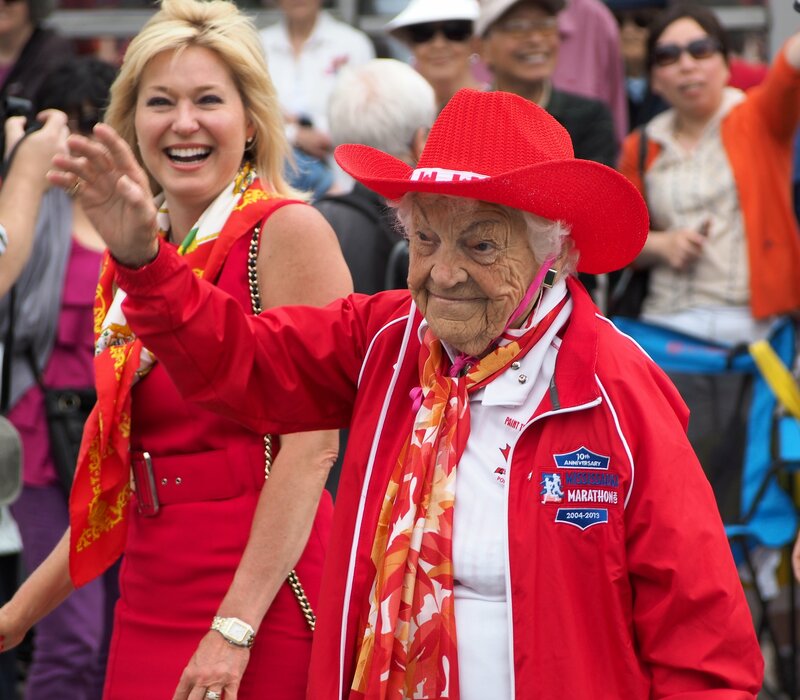 "McCallion, who just turned 95, shows no signs of slowing down since leaving her longtime post as Mississauga's mayor ... In its bold bid to become a university, Sheridan College has a powerful new weapon. Hurricane Hazel." Hazel McCallion's Photos Through the Years by Khaled Iwamura, February 15, 2016. Hazel McCallion turned 95 today. CP24 Video, 1:00 min. BIRTHDAY GIRL: Tributes pour in to wish 'Hurricane' Hazel McCallion a happy 95th by Louie Rosella, Mississauga News, Feb 14 2016. 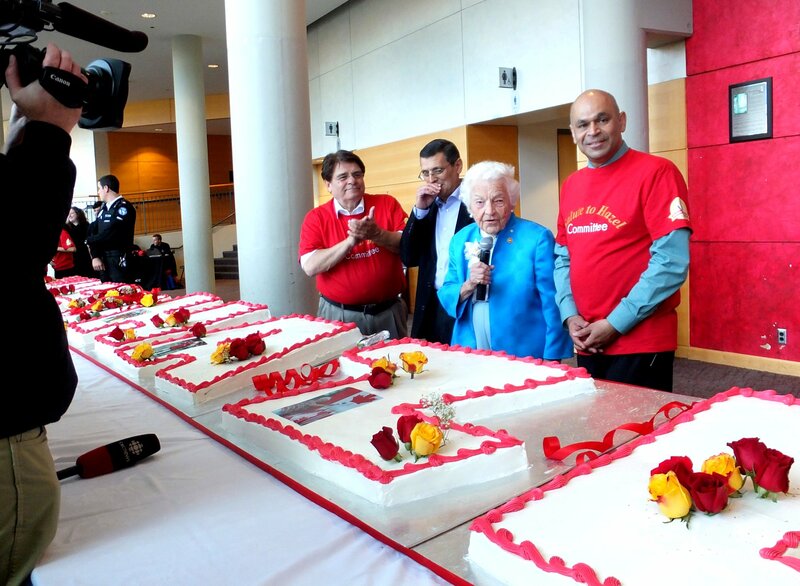 "Mississauga's iconic and venerable former mayor, Hazel McCallion, turned 95 today. The tributes have been pouring in over social media as McCallion celebrated with family members and friends at her son Peter McCallion's house." Lion Dance at MCBA Chinese New Year Reception 2016. YouTube video, 4:56 min. Published on Feb 11, 2016. Lion Dance performed by Stephen Bougin and Justin Chin (White Lion), Ying Zhu and Lorne Milda (Red Lion) of Northern Legs Southern Fists. MCBA President Lillian Kwok and Former Mississauga Mayor Hazel McCallion feed the Lions with fresh lettuce and lucky money. Year of the Monkey, Chinese New Year Celebration held on February 8, 2016 at the Great Hall, Mississauga Civic Centre, 300 City Centre Drive, Mississauga, Ontario, Canada. Trudeau helps mark Chinese New Year. The Canadian Press, 6 Feb. 2016. "He [Prime Minister Justin Trudeau] was the guest of honour at the Dragon Ball, where he celebrated the beginning of the Year of the Monkey. He arrived with former Mississauga, Ont. 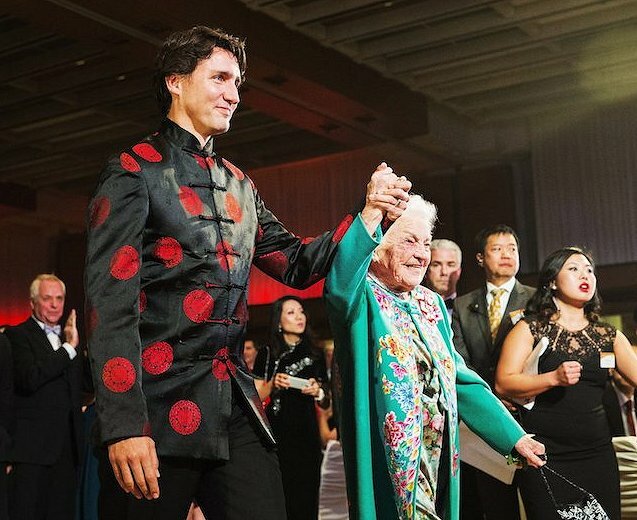 mayor Hazel McCallion on his arm, joking she was a date 'almost as hot' as his wife Sophie Gregoire-Trudeau ... At the event, held by the Yee Hong Community Wellness Foundation, Trudeau participated in a traditional eye-dotting ceremony during a lion dance. Port Credit 7th Annual 'Twas the Bite Before Christmas. Published in Mississauga Real Estate, Mississauga.com, January 7-8, 2016, p. 10. Photos by Tracey White Kirouac and Rob Beintema. "Once again the Port Credit community has come together to fight hunger, feed hope and assist those less fortunate - said Dan Meadowcroft, co-founder of the 'Twas the Bite Before Christmas Foundation." Several photos include former Mississauga Mayor Hazel McCallion and current Mississauga Mayor Bonnie Crombie. Hazel McCallion starts a new job. YouTube video, 5:40 min. Published on Dec 21, 2015 by CBC News. "Mississauga's former mayor takes on role with Revera Inc. She speaks with The Exchange's Bruce Sellery." Hazel McCallion - Chief Elder Officer of Revera. YouTube video, 1:09 min. Published on Nov 9, 2015 by ReveraInc. Hazel McCallion strongly believes that "Every person, young and old, can live a life of purpose." She aims to help seniors to live their lives to the fullest. McCallion throws down challenge to SIOR members by Joanne Lovering, Mississauga News, 3 November 2015. "A Markham resident should be able to work at Pearson Airport then easily return home via public transportation, former Mississauga mayor Hazel McCallion recently told members of the Society of Industrial and Office Realtors (SIOR) ... she called on all professionals in the real estate industry to be proactive and create a body to forge a pubic transportation system that seamlessly links Brampton and Mississauga with the entire GTA [Greater Toronto Area]. "On October 19, Real Estate Broker and TV Show Host Carmela Kapeleris hosted a one-of-a-kind event at Cagney's Restaurant in Streetsville. 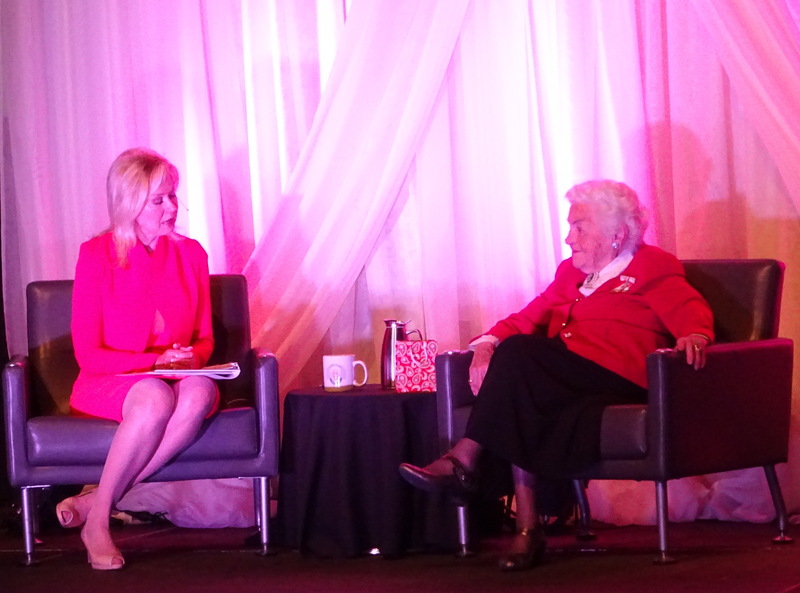 The event kicked off with the entrance of Mississauga's former mayor, the Honorable Hazel McCallion, followed by an interview with Carmela Kapeleris ... a second interview ... with Jon Cheplak, Consultant, Coach, Speaker and Author of 'Interrupt the Pattern - The Path to Your Higher Self'. Jon shared business secrets and strategies with the guests ..."
Hazel McCallion says Trudeau has his priorities straight by meeting with her instead of Rob Ford. YouTube video (poor sound), 2:11 min. Published on Oct 16, 2015, by CBC News. Liberal Ad: Hazel McCallion asks, "Do I look scared to you?" YouTube video, 0:30 min. Published on Oct 14, 2015 by FactPointVideo. "Former long-serving Mayor of Mississauga, Hazel McCallion, asks voters not to believe Stephen Harper's misleading statements and ads saying that income-splitting for seniors would be eliminated under a Liberal government. It won't. This election ad first aired on October 14, 2015." MiWay Celebrates New Name for Operations Building. City of Mississauga Press Release, Oct 13, 2015. "Today, we recognized the early days of transit in Mississauga with the Official Renaming of the Transit Operations Building to the E.J. (Ed) Dowling Transit Facility. 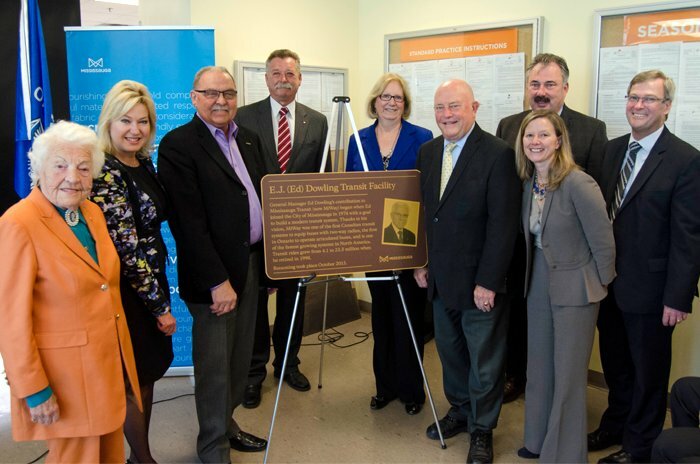 'Under the leadership and vision of Ed Dowling, Mississauga Transit - now called MiWay, grew from 4.1 million rides in 1974 to 23.3 million rides in 1997,' said Mayor Bonnie Crombie during the official renaming ..."
"Father of Mississauga Transit" Ed Dowling honoured with building renaming from SNAPD North Mississauga, November 2015, p. 22. Photos and event submitted to SNAPD. Website code: petp84. Photo caption: Hazel McCallion, Mayor Bonnie Crombie, Ed Dowling, Guest of Honour; Doug Lychak, former City Manager, Councillor Ron Starr, Ward 6; Councillor Pat Saito, Ward 9; Councillor Chris Fonseca, Ward 3; Councillor George Carlson, Ward 11; and Martin Powell, Commissioner of Transportation and Works present Ed Dowling with a plaque recognizing the renaming of the Transit Operations Building to the E.J. (Ed) Dowling Transit Facility. Lunch with former Mississauga Mayor Hazel McCallion by Laura Stone, Politics Reporter, Global News. YouTube video, 2:08 min. "People are interested in the economy. They are concerned about the lack of job creation. The unemployment of youth is extremely high in Mississauga and well across Canada. You can talk about balancing the budget, but a person without a job is not interested in balancing the budget. I think Justin Trudeau's platform is the best." On Justin Trudeau: "He is young, he is vibrant, he is intelligent, he's got all kinds of youth in his favour." On how Hazel McCallion stays so young (at age 94): "You've got to stay active, watch your diet, eat a lot of fish, and being interested, keep your mind working." 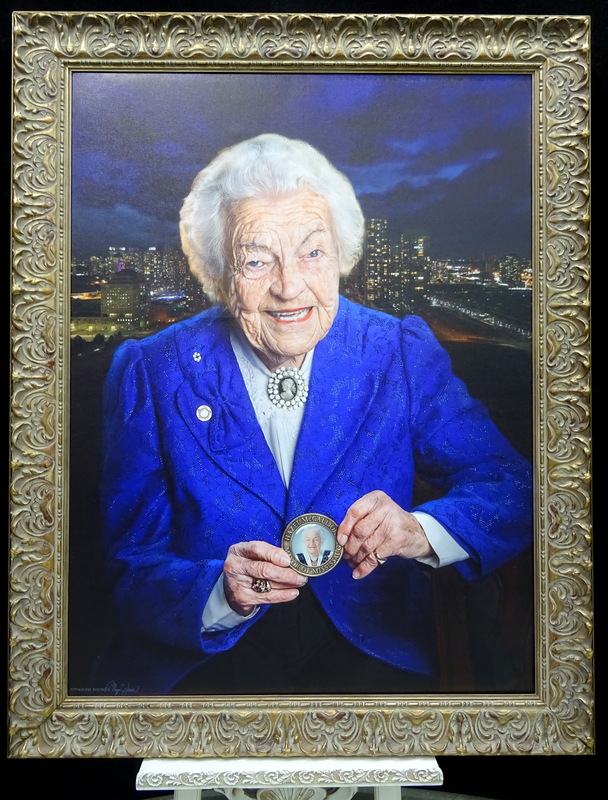 Farewell to Hazel McCallion Mayor of Mississauga 1978-2015 by Haroon Khan. YouTube video, Published on August 12, 2015 by Sabir Amin Shakoor Gaya. ● "I could never toe the party line. I'd wear out the carpet crossing the floor." ~ Mayor Hazel McCallion. ● "The most frightening words in politics are, 'Hazel McCallion on line 1'" ~ A former Cabinet minister, who wishes to remain anonymous. Dr. Ignat Kaneff - A Lifetime Achievement Tribute from SNAPD North Mississauga, May 2016, p. 10. Photos and event by Duaine Menezes. Website code: pewv7dh.Many dignitaries, including former mayor Hazel McCallion, attended this Community Living Mississauga's 32nd Annual Tribute Dinner held on March 31, 2016. See also: Iggy Kaneff, builder and philanthropist, receives one of nation's highest honours by Rachael Williams, Mississauga News, Jan 25, 2017. "Kaneff was awarded the Order of Canada for his community dedication and service to the nation." Former mayor joins Peel development company by Chris Clay, Mississauga News. Online version published July 14, 2015. Print version published July 16, 2015 in Mississauga News, page 4 with title: Nothing Stopping Former Mayor from Joining Peel Development Company. "There are no rules preventing former Mississauga mayor Hazel McCallion from joining a Peel-based real estate development company, according to an expert in municipal government ... Last week, Kaneff Group of Companies announced that McCallion had joined the company's board of advisors as of June 1." Former mayor joins Peel development company by Chris Clay, Mississauga News, July 14, 2015. "Former Mississauga mayor Hazel McCallion has joined the board of Kaneff Group, a Peel-based real estate development company." Peter Fonseca Fundraiser Invitation July 2015. The Podium Club invites you to an evening with Peter Fonseca, Liberal Candidate for Mississauga East-Cooksville with special guest Former Mayor Hazel McCallion, hosted by Ignat Kaneff, July 7, 2015, at Lionhead Golf Club & Conference Centre. 50TH ANNIVERSARY: Even in the beginning (and for a long time after that), there was Hazel McCallion, becoming the 'Hurricane'. Online version published 25 June 2015. 50th ANNIVERSARY: 'Hurricane' Hazel, our constant companion. "From day one of the news, there was Hazel McCallion. Over the years, we've dedicated oceans of ink to our long-time former mayor. Here are a few of her earliest appearances in our Mississauga News. You can't tell the story of the Mississauga News without at least a few references to former mayor Hazel McCallion. Or a few million." 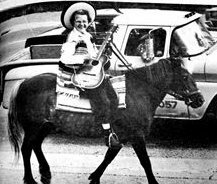 Article includes a black and white photo taken in 1970 with the caption: "A Mexican-garbed, guitar-strumming McCallion rides Jello the horse down the QEW near Hwy. 10 during a fundraiser trek for handicapped children. The ride ran from Huron Park to the CNE in 1970." Printed version published on June 26, 2015 in The Mississauga News 50th Anniversary, p. 6. Hazel McCallion: Exemplary, Extraordinary, Enduring. YouTube video, 4:11 min. Published on June 15, 2015 by Juliana Andrada. About Hazel McCallion, at age 93: "Her tenacity is legendary when it comes to hockey ..." Paul Henderson, former NHL Player comments: "'Hurricane Hazel', that's a great nickname ... that would have been even appropriate on the ice." "Her love of the sport has made Hazel the Champion of Hockey not only in Canada but internationally." A glimpse of Hazel McCallion at Healthy Living Expo 2015. YouTube video, 0:59 min. 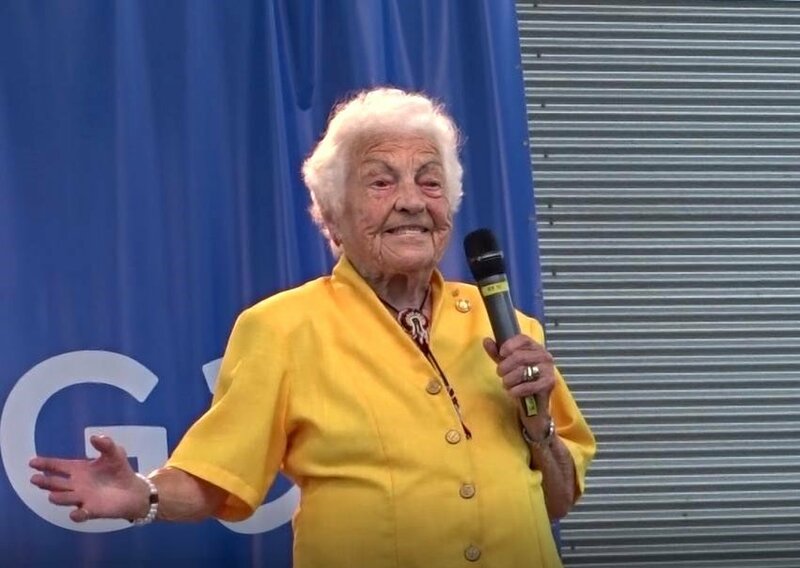 To loud applause and laughter, former Mayor Hazel McCallion comments that the Mississauga Healthy Living Expo encourages people to stay healthy and hence her success ~ Witness the living proof of herself, still very active and healthy today at age 94, June 13, 2015. 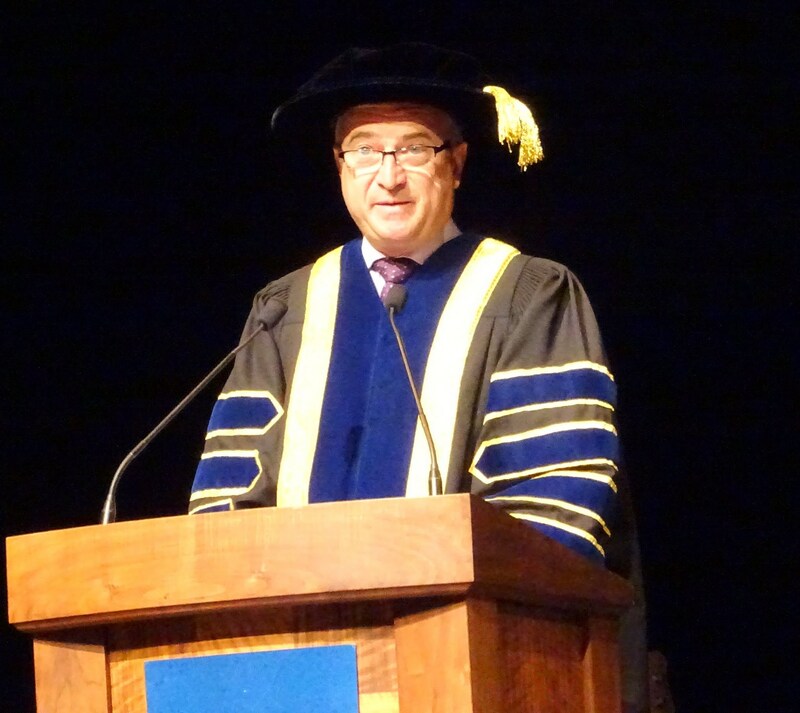 Former mayor honoured with degree from Sheridan College by Chris Clay, Mississauga News. With Staff Photo by Chris Clay. "Sheridan College graduates of the Pilon School of Business received their diplomas at a convocation held in the Living Arts Centre on Monday (June 8, 2015). 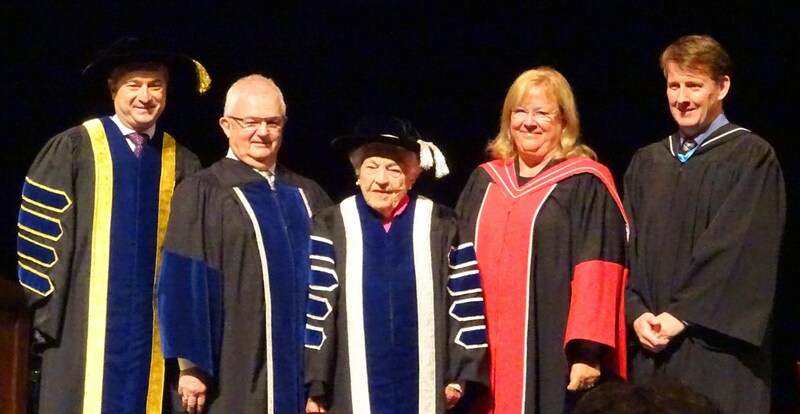 Former Mayor Hazel McCallion was awarded an honourary degree. Dean Deblois and Graham Annable are both Sheridan alumni and 2015 Academy Award nominees for Best Animated Feature - Deblois for How to Train Your Dragon Two, and Annable for The Boxtrolls." Hazel McCallion: "I miss solving problems." June 9, 2015 YouTube video, 1:14 min. Former City of Mississauga Mayor Hazel McCallion, age 94, gives a short speech at Palisades on the Glen: "I miss the administration. I miss solving problems." Still full of life and very energetic, Hurricane Hazel emphasizes that "You can't do it alone. You have to do it with others." The McCallion Letters. Mississauga Watch: Mississauga Muse. Blog. Circa 10 February 2009 to 24 May 2015. Mississauga Arts Council honours city's best and brightest by Joseph Chin, Mississauga News, 8 May 2015. 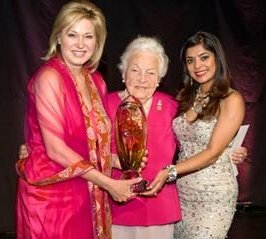 "Mayor Bonnie Crombie and Mississauga Arts Council executive director Anu Vittal present the Lifetime Achievement in the Arts Award to former mayor Hazel McCallion at the MARTY Awards held at the Living Arts Centre." Nominees named for 2015 MARTYs by Joseph Chin, Photos by Rob Beintema. Mississauga News, Mar 26, 2015. "The nominees have been announced for the 2015 MARTY Awards. This year, 70 people/groups, in both arts and volunteer categories, are in the running for the awards ... 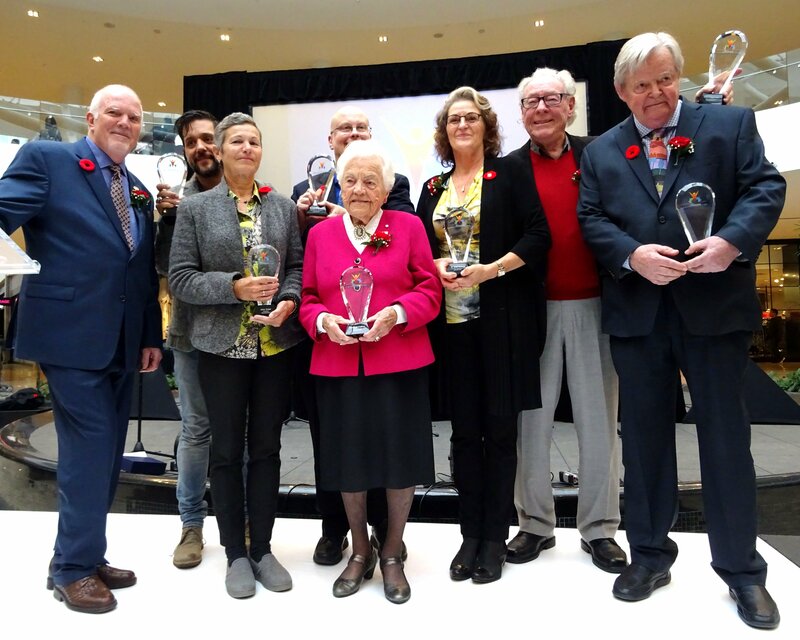 The winners will be revealed at a gala May 7 at the Living Arts Centre ... As part of the awards, Mississauga Arts Council (MAC) will present a Lifetime Achievement in Arts Award to Hazel McCallion for her contribution to the arts during her tenure as mayor." Niagara Falls, ON, March 6, 2015. Live: 'Hurricane' Hazel McCallion speaks at Women's Day celebration. "Former Mississauga mayor Hazel McCallion will share her story during an International Women's Day celebration, held in Niagara Falls, Ont., Friday, March 6, 2015 at 1:15 p.m. McCallion, who spent 36 years as the mayor of Mississauga, is the keynote speaker at a luncheon organized by Women in Niagara, a council of the Greater Niagara Chamber of Commerce." Hazel McCallion's Retirement Doesn't Last, Takes New Job At 94 by Canadian Press, Feb. 24, 2015. "'Hurricane Hazel' is still going strong. At the age of 94, Hazel McCallion - one of Canada's longest serving mayors - is embarking on a new career." Hazel McCallion gets a new job. The Canadian Press, Feb 24, 2015. "At the age of 94, Hazel McCallion - one of Canada's longest serving mayors - is embarking on a new career. She has taken a job at the University of Toronto ... is now a special adviser to the president of the university's Mississauga division on matters related to the strategic development of the school ... McCallion will also be helping to create new courses and will work with the Mississauga campus' Institute for Management and Innovation to develop a master's degree in urban innovation and development ..."
McCallion lands job at UTM by Chris Clay, Mississauga News. Published Feb 24, 2015. Photo: Former Mississauga mayor Hazel McCallion has accepted a position as special advisor to University of Toronto Mississauga principal Deep Saini. "Just a few months after stepping down as mayor, Hazel McCallion has landed a new job. 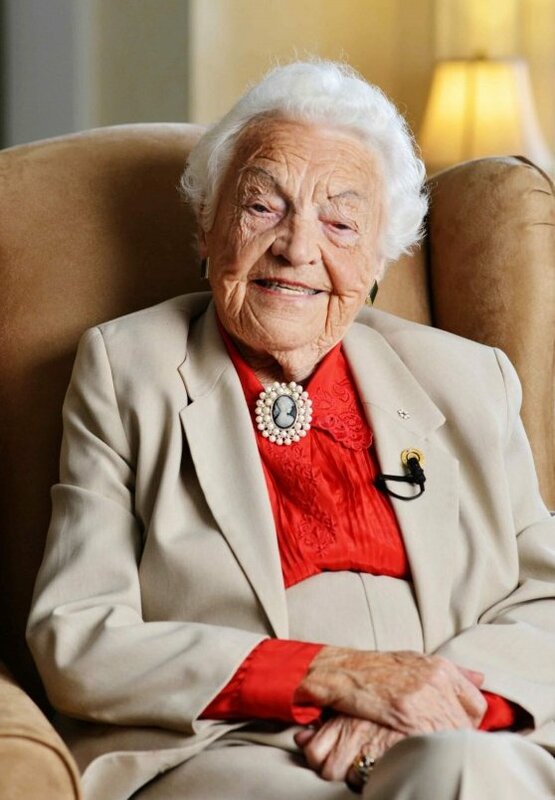 McCallion, 94, accepted a position as special advisor to University of Toronto Mississauga principal Deep Saini and started her yearlong job earlier this month ...'I believe strongly in the importance of both education and innovation for the future of Mississauga,' said McCallion in a release. 'I have always felt so welcomed when I am at the university and I am honoured to continue our long relationship and to contribute to education in Mississauga.'" A Bank NOTE-able Canadian Woman. Bank of Canada is inviting Canadians to nominate an iconic woman to appear on a new bank note. Sorry, Hazel McCallion does not qualify as nominees must have been deceased for at least 25 years. On 8 December 2016, the Minister of Finance and the Governor of the Bank of Canada will reveal which woman will be featured on the note. The $100 Canadian banknote depicted below (sorry link no longer works) with image of Hazel McCallion is somone's creative artwork submitted anonymously on 23 Feb. 2015 to Women on Canadian Bank Notes with image of Hazel McCallion just for fun. Former Mississauga mayor Hazel McCallion lands new job by Dakshana Bascaramurty, Globe and Mail. Published Monday, Feb. 23 2015, 6:30 PM EST. "In a year-long appointment, Ms. McCallion, who turned 94 earlier this month, will help develop a new master's degree in urban innovation and development at the university's Institute for Management and also be a guest lecturer." 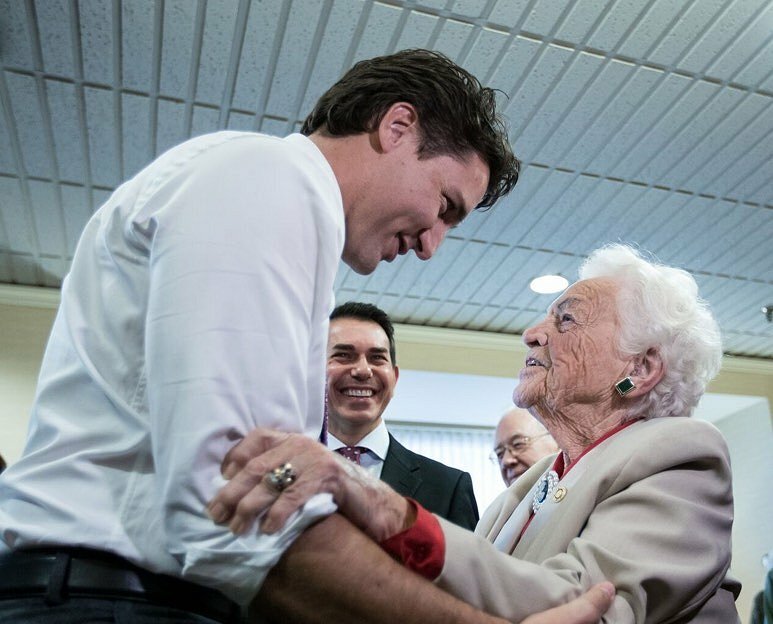 Hazel McCallion endorses Justin Trudeau: Launches Canada's Cities vs Stephen Harper YouTube video, 5:42 min. Published on Feb 16, 2015 by MississaugaWatch. 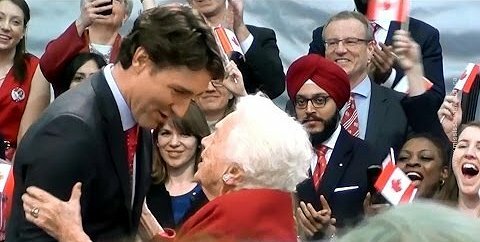 Liberal "Hazel McCallion endorses Justin Trudeau for Municipal Infrastructure Money" Rally, University of Toronto Mississauga, Feb 15, 2015. ● Former Mayor Hazel McCallion tells a joke on her 94th birthday 14 Feb 2015 . YouTube video, 3:12 min. ● Love Me Tender ..."for dear Hazel we love you and we always will" 14 Feb 2015. YouTube video, 0:52 min. ● For more YouTube videos by Justus singers of Streetsville Musicorp Inc., see "From Justus With Love". View Hazel McCallion's Photos Through the Years from insauga.com. December 15, 2014. Daniel R Wallace Receives Civic Award from SNAPD North Mississauga, April 2015, p. 2. Event submitted to snapd. Website code: perm3n. 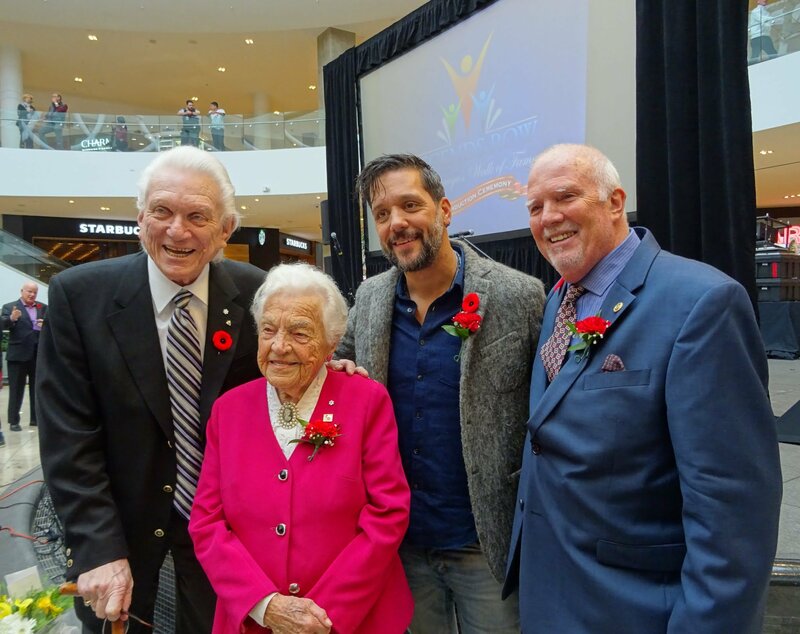 "It was a special day for Daniel Wallace and his family recently as he received a Civic Award of Recognition from the City of Mississauga ... Daniel and his family were also honoured to meet former mayor, Hazel McCallion, at the award ceremony. The City of Mississauga has been honouring residents through the Civic Recognition program since 1992." Former Mayor Hazel McCallion Tribute Dinner from Snap North Mississauga, January 2015, p. 5. Event submitted to snapd. Website code: peqsjs. 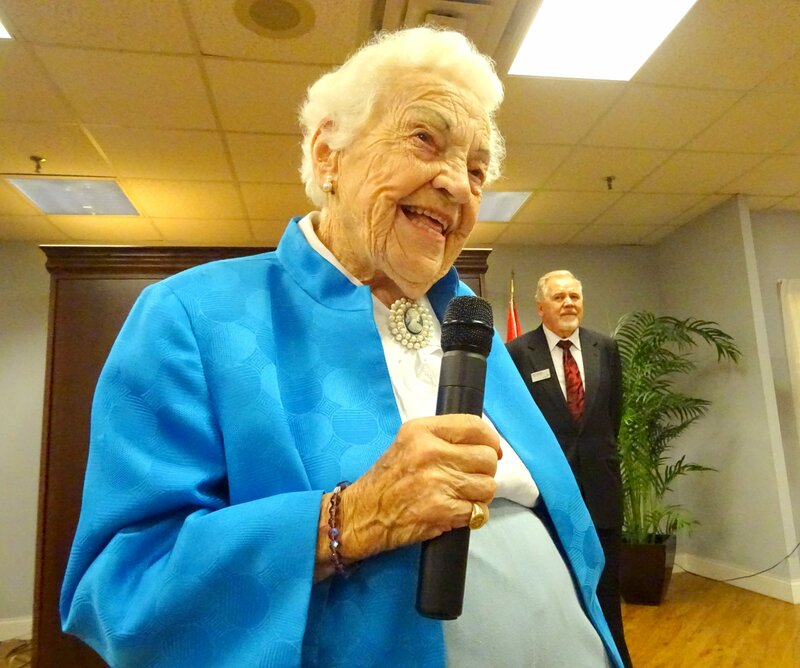 "The Mississauga Italian Canadian Benevolent Association (MICBA), along with its partner companies, organized a Tribute Dinner to celebrate Mayor Hazel McCallion's 36 years in service as mayor and a devoted member of the community. 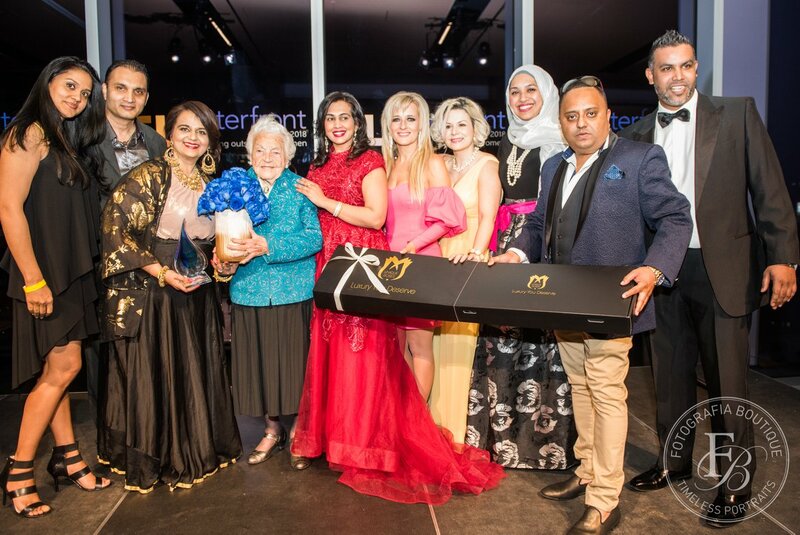 The event, which took place at Le Tréport Wedding & Convention Centre on December 6, was a huge success with over 500 attendees uniting together to commemorate Mayor Hazel and show gratitude for her passion and commitment to the City of Mississauga. Mayor Hazel McCallion astounded the crowd by making a grand entrance, driving into the venue in a Gucci Fiat 500 ..."
Statement in recognition of Hazel McCallion, C.M. - December 3, 2014 (Sorry, link no longer works) from Senator Victor Oh, Senate of Canada. "We have all heard about Hazel, one of the best-known and longest-serving mayors in Canada and in the world. She retired last Sunday at the age of 93, leaving the mayor's seat after 36 years. 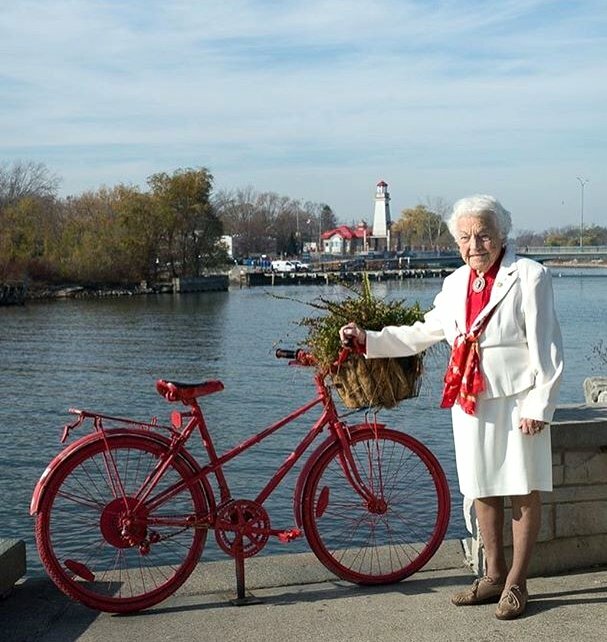 She earned the nickname 'Hurricane Hazel' for her tireless energy and determination. She was the first female elected Mayor of Streetsville back in 1970 and later elected as the first female Mayor of Mississauga. A Member of the Order of Canada, she was among the top finalists for the World Mayor Award. Mayor Hazel McCallion oversaw the development of Mississauga from a town of fewer than 300,000 people to the sixth-largest city in Canada. She is an inspiring figure for many in politics and community service. She is leaving a legacy that will be hard to surpass." 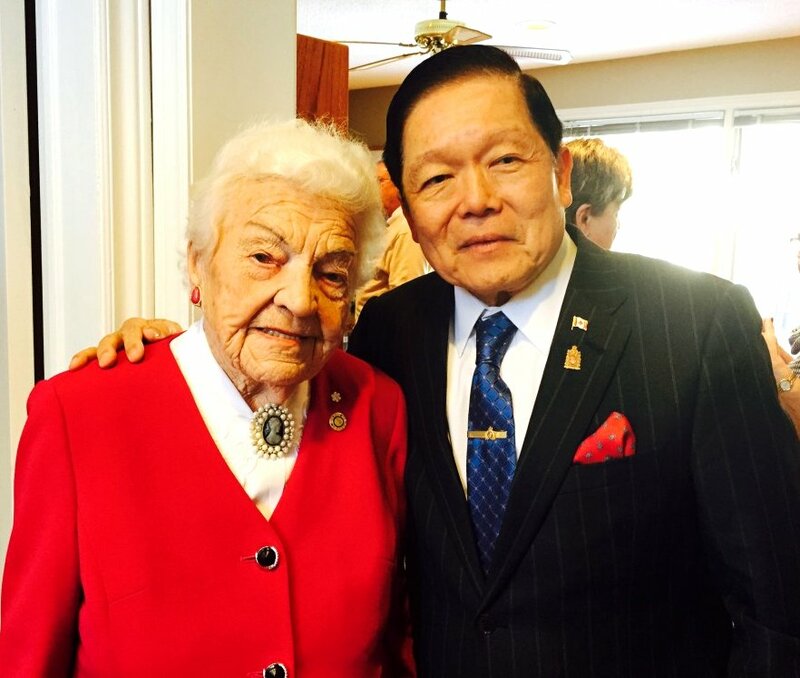 Mayor Hazel McCallion Congratulates Victor Oh on Appointment to Senate of Canada. City of Mississauga, Jan 29, 2013. "Mississauga resident Victor Oh was appointed to the Senate of Canada on January 25." See Victor Oh in Wikipedia. Old habits die hard for retired Hazel McCallion by Joe Warmington, Toronto Sun, December 3, 2014. "The last time Hazel McCallion had nothing scheduled to do on a week day, Lester B. Pearson was prime minister. George Armstrong was the captain of the Toronto Maple Leafs, the late, great Jean Beliveau of the Montreal Canadiens. That was 1967, when the legendary former mayor was first elected into politics. Canada was just seven years older than McCallion is now. Mississauga was just a bunch of farmer's fields. A lot sure has changed since then in Canada?s sixth-largest city. After almost a half century of serving the public, Hazel McCallion has extra time on her hands. She has certainly earned it." Phoenix Ball pays tribute to McCallion. "Tonight ... we honour and pay tribute to a great leader who never quits until the job is done. That person, of course, is Her Worship Hazel McCallion, our "Hurricane Hazel"! In 2005, she was made a Member of the Order of Canada. Her accomplishments were not only being recognized in Canada, but also around the world. Just to quote a few: She is one of the few non-Germans to be a Member of the Order of Merit of the Federal Republic of Germany, the country's highest individual honour, for her role in bringing German companies to Canada. She ranked second in the 2005 International World Mayor poll. But to us all in Canada, she is the No. 1 Mayor in the world. We love Hazel because of her personal approach. She is so forth right with people. She talks with confidence and above all, she talks from her heart. The city is destined for greatness as it is built on a foundation envisioned by the foresight and planning of a great mind. The people of Mississauga will benefit from her legacy and wisdom for years to come. Hazel is the greatest Mayor Mississauga ever has and will ever have. She is second to none! We will forever be grateful for her work, her wisdom, her smile and for being such a remarkable leader of our city in Canada and the world!" Phoenix Ball pays tribute to McCallion by Joseph Chin, Mississauga News, 1 Dec. 2014. 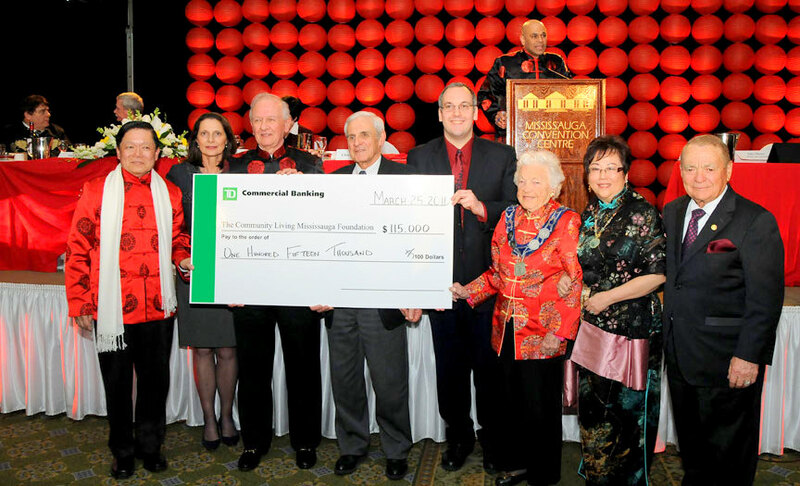 "The 2014 Phoenix ball sponsored by the Mississauga Board of Chinese Professionals & Businesses (CPB) celebrated Mayor Hazel McCallion's last official event with a gala evening at the Mississauga Convention Centre Sunday evening (Nov 30, 2014). Ron Duquette, a close friend of the mayor, spoke about Hazel's Hope, which, through Mississauga-based World Vision Canada, has donated more than $1 million to provide safer water, education, HIV/AIDS awareness and prevention training, health care and more for poverty-stricken areas in Tanzania." 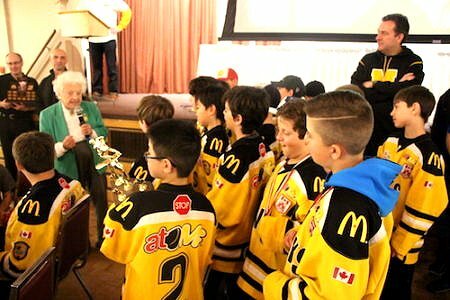 Mississauga Minor Hockey Associations celebrate Mayor Hazel McCallion. Published Dec. 2, 2014 by Mississauga Hockey League. Mississauga Hockey League, Mississauga Girls Hockey League, Streetsville Hockey League team up to honour Mississauga hockey's biggest fan! "On Saturday, November 29, 2014, the Mississauga Hockey League, Mississauga Girls Hockey League and Streetsville Hockey League paid tribute to Mayor McCallion with a special ceremonial puck drop at the start of the MHL's annual Minor Novice Fun Day at Tomken Arena ..."
Mississauga Hockey Honours Mayor Hazel McCallion from Snap North Mississauga, January 2015 edition, p. 15. Photos and event by Alizeh Jaffrey, Website code: pezf2x. "On Mayor Hazel McCallion's last weekend in office, she was invited to what she was told was simply a ceremonial puck drop. Instead, she found a gathering of the three Mississauga minor hockey associations - the Mississauga Hockey League, the Mississauga Girls Hockey League and the Streetsville Hockey League - there to honour her. Many Minor Novice players took to the ice with their team banners and surrounded the Mayor as she addressed the audience and shared a few words ..." Includes the photo: "Mayor Hazel drops the puck as the welcoming party looks on, including MHL President, Brian Webster, MGHL President, Phil Cancilla, SHL President, Neil Painchaud, Past MHL President, Gord Hughes, Ward 3 Councillor, Chris Fonseca & various mascots." Development or disaster: Hurricane Hazel's stormy legacy by Jeff Lagerquist, BNN.ca staff. November 28, 2014. BNN Video, 10:36 min. "McCallion, 93, retires on Nov. 30, ending a career that likely shaped a region more profoundly than any municipal bureaucrat in Canadian history. More than 60 Fortune 500 companies call Mississauga their Canadian home ... 'Run the city like a business,' and 'development must pay its way.' 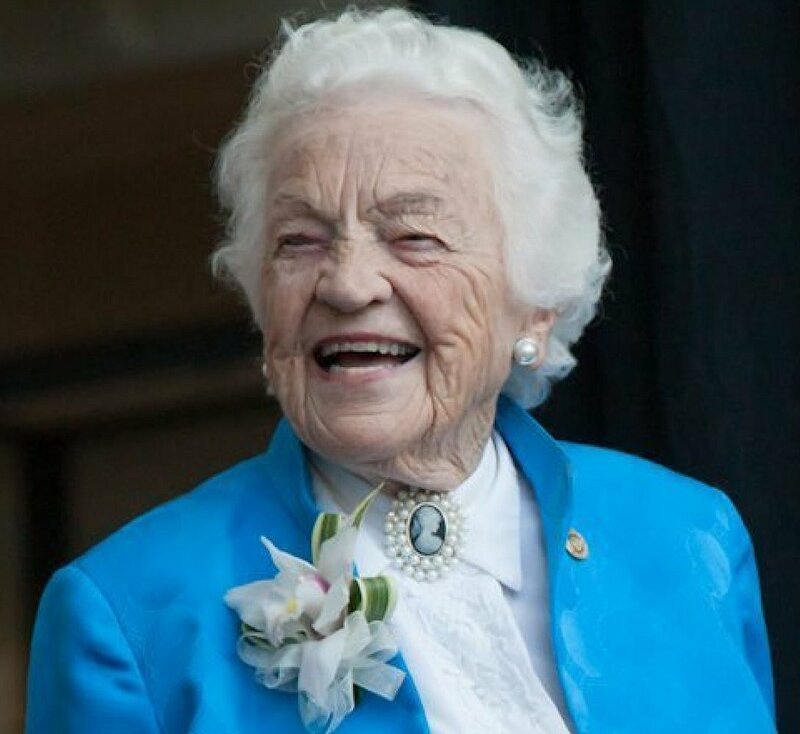 These are the mantras that guided her visions for Mississauga's growth ... McCallion: 'Act like a lady, think like a man, work like a dog ... Be committed in whatever you do ...'" This weekend, mayor Hazel McCallion will say goodbye to Mississauga city hall after 36 years in office. Catherine Murray had a chance to sit down with McCallion to talk about her life. Goodbye Hazel. Opinion, The Mississauga News, Editorial, 28 November 2014, p. 6. "Thank you Mayor, for a lifetime of exceptional public service." 'Hurricane Hazel' McCallion says goodbye by Terry Davidson, QMI Agency, Nov. 27, 2014. (Sorry, link no longer works). "MISSISSAUGA, Ont. - One of the longest mayoral reigns in Canadian history has come to an end. 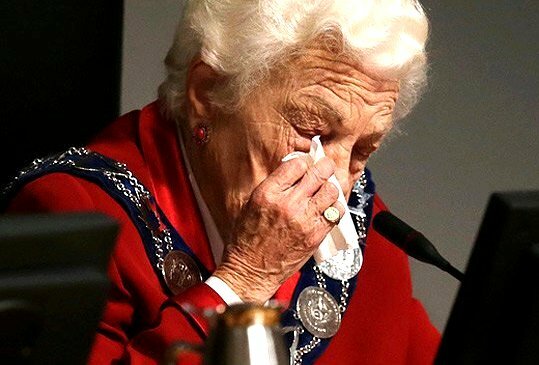 Hazel McCallion, the iconic mayor of Mississauga, Ont., took off the chain of office for the last time following her final city council meeting on Wednesday [November 26, 2014] ... 'No one person can take credit for what Mississauga has accomplished ... It is a team approach and it has been (that way) for years and years and years.'" Goodbye Hazel from Mississauga News, Nov 27, 2014. "The 'Miss' in Mississauga ended her historic 36-year run as our chief magistrate on Wednesday by handing over her chain of office. It was an emotion-charged event, and the only one who seemed cool and unfazed by it all was the 93-year-old urban icon ... McCallion loved to be mayor of Canada's sixth largest city because she was good at it. Her experience as a young girl doing the books for her dad's fishing business in the Gaspe, set her on a life course that was framed by incredible discipline, and the work ethic of a longshoreman. Her work life experiences with a major construction firm, made her the perfect person to help build Canada's sixth largest city." Hazel McCallion removes Chain of Office as Bonnie Crombie watches (2 Cam split-screen). YouTube video, 2:47 min. Published on Nov 30, 2014 by MISSISSAUGAWATCH. "Split-screen of Mayor Hazel McCallion (Cam 1) removing her Chain of Office for the last time and formally handing it over to Crystal Greer, City Clerk. Cam 2 documents Mayor Elect Bonnie Crombie on November 26, 2014." Hazel McCallion, 93, attends her last council meeting as mayor of Mississauga from The Globe and Mail. Published Wednesday, Nov. 26 2014, 9:22 PM EST. "Hazel McCallion, 93, removes her chain of office for the last time at the end of her last city council meeting as mayor of Mississauga. Ms. McCallion is the longest serving mayor - 36 years - in the city's history." Hazel McCallion, in her own words, on her last day as Mississauga mayor after almost four decades. Special to National Post, November 26, 2014 7:48 PM ET. 'When you think of 38 years chairing a council meeting, I don't think I missed too many over the 38 years [and when I did miss any] I was always out of town, I'm sure. Fortunately illness was not something that I experienced much during my term.' ~ Mayor Hazel McCallion. Article includes photos by Peter J. Thompson, National Post: "Mississauga Mayor Hazel McCallion embraces Ward 7 Councillor Nando Iaanicca, on her last day at council after being Mayor since 1978" and "Mississauga Mayor Hazel McCallion, 93 years old, laughs with supporters on her last day at council after being Mayor since 1978". 'When I sat down in the mayor's chair for the first time, there were cows and horses grazing where our city core is today,' she said. Under McCallion's leadership, Mississauga's population more than doubled, making it the sixth-largest city in Canada. Over her tenure as mayor, she was approached numerous times to run provincially and federally. But McCallion said she never seriously considered leaving city politics. 'I've never regretted staying at the local level. You can accomplish more, you can be independent. Look at the city we've built.' The mayor's last day in office, officially, is Nov. 30, and McCallion has no plans to rest on her laurels until then. 'I started to work the first day I was elected and I'm going to work to the last day I'm elected,' she said. 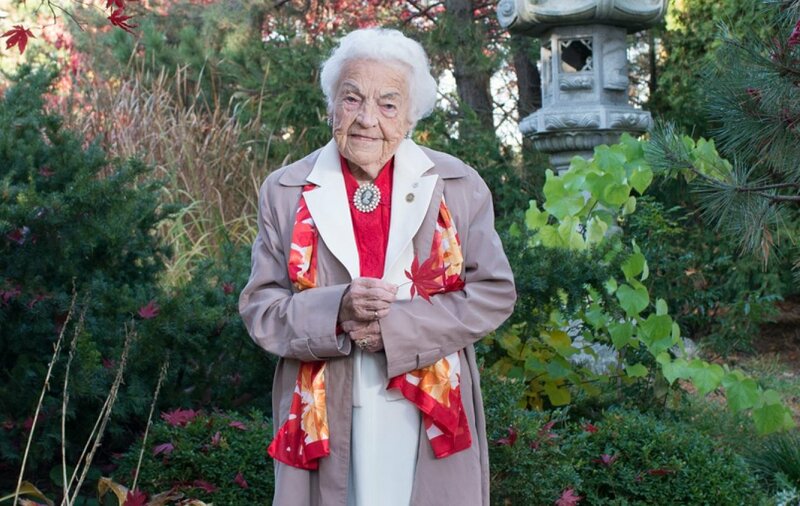 After her tenure as mayor ends, McCallion will work with the Ontario Women's Hockey Association ..."
Hurricane Hazel: A Life With Purpose by Hazel McCallion: Review by Marcia Kaye, Special to the Star. Book Review from TheStar.com, Nov 20 2014. "McCallion's autobiography is just as feisty, plain-spoken and straight-shooting as the woman herself. She explains upfront, 'I want people to read about my accomplishments - and my failures - so that they see that women can be leaders or hockey players; that seniors need not be put out to pasture simply because of their age; and that hard work truly does pay off.'" Mayor has health award named in her honour by Chris Clay, Mississauga News, 20 Nov. 2014, p. 12. 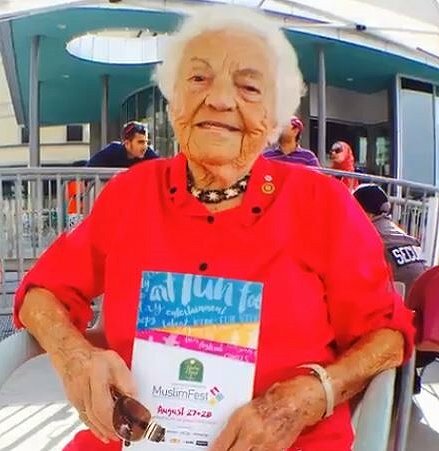 "As a way to say thanks for Hazel McCallion's years of service as mayor and her ongoing support for Mississauga's hospitals, a new award has been established in her honour. 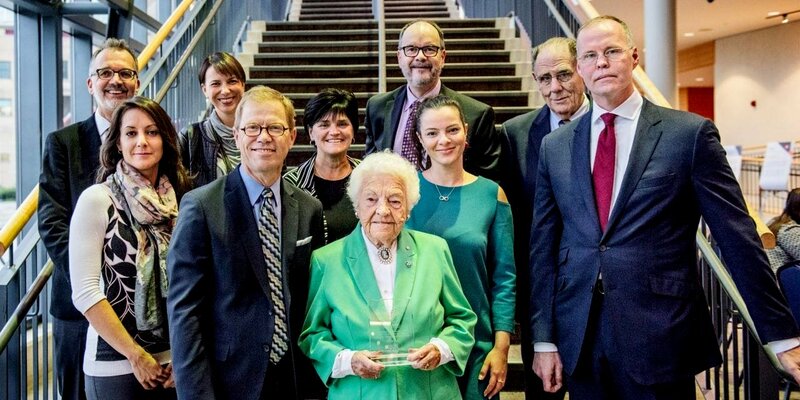 Trillium Health Partners, with support from the Trillium Health Partners Foundation, has created the Hazel McCallion Award in Quality of Care, unveiled during a special ceremony on Remembrance Day (Nov. 11, 2014) at Credit Valley Hospital." Steelheads honour Mayor McCallion with home victory. 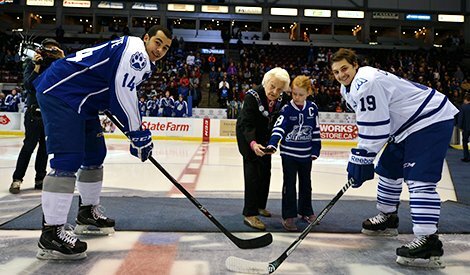 "Tonight, the Steelheads hosted not only the Sudbury Wolves, but a very special guest in Mississauga, Mayor Hazel McCallion. 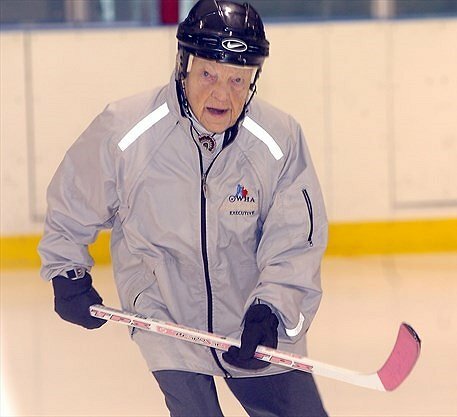 Mississauga paid tribute to the City's longest-tenured mayor with a pre-game ceremony and puck drop." Photo source: Mississauga Steelheads.com, November 14, 2014. Mississauga Mayor Hazel McCallion remains a whirlwind to the end by Sue-Ann Levy, Toronto Sun, Nov 8 2014. "She shows me her schedule - printed in regular type on yellow paper and which she reads without glasses - from a recent Saturday in September. It contained nine events and at least four drop-ins in the evening, all at which she missed dinner - leaving her to partake of a cheese and onion sandwich when she got home. 'I'm mayor until Nov. 30 ... I will not lessen up my time or my effort to get unfinished business finished if I can and to brief the new mayor on the status of the items I've been dealing with,' she says. I'm weary just thinking about her schedule, especially when she tells me that except for mowing her lawn, she does all her own housework, cooking and gardening." Construction begins on the Sheridan College Hazel McCallion Campus expansion project. YouTube video, 5:03 min. Published on Oct 29, 2014 by CNW. "At a groundbreaking ceremony held today, the Honourable Reza Moridi, Minister of Training, Colleges and Universities, joined Mississauga Mayor Hazel McCallion, Sheridan College President and CEO Dr. Jeff Zabudsky and other college officials and business leaders to celebrate the start of construction of the Sheridan College Hazel McCallion Campus (HMC) expansion project." Discover Author: Hazel McCallion - Biography from HarperCollins Canada. Hazel McCallion: The Hurricane that Changed Mississauga. YouTube video, 19:31 min. The Agenda with Steve Paikin. Published on Oct 28, 2014. "In her 36 years as mayor of Mississauga, Hazel McCallion has watched the city grow from almost quarter of a million people in 1976 to roughly three times that number today. The day after the municipal election, we'll ask the outgoing mayor about her life in politics and the lessons she's learned along the way." Hurricane Hazel retires as mayor of Mississauga at 93, but says she won't slow down by Anna Maria Tremonti, CBC Radio: The Current, Tuesday, October 28, 2014. Tremonti's webpages include numerous photos. "Hold on to your hats, because Hurricane Hazel is blowing in. Hazel McCallion, the outgoing 93 year old mayor of Mississauga, Ontario joins us to talk about what she did to persist as mayor of Mississauga for so long and reflect on the evolution of women in politics. 'Act like a lady... think like a man (which I've never figured out) and work like a dog. Any woman to succeed has to work very hard to attain success.' ~ Hazel McCallion, Mayor of Mississauga. See also: In the words of Hurricane Hazel: 5 memorable quotes from Hazel McCallion. One of the five Hazel McCallion quotes cited by Anna Maria Trejonti is: "I learned to do with little. And that's why today, I only spend the taxpayers' money like I spend my own, which is seldom. The people of Mississauga love that." Bonnie Crombie becomes Mississauga's first new mayor since 1978 ... by Tristin Hopper, National Post, October 27, 2014, 11:03 pm ET. "For 36 years, the people of Mississauga re-elected Hazel McCallion. They elected her despite Ms. McCallion's staunch refusal to campaign, they elected her as the population tripled and they even elected her despite recent conflict of interest allegations. And they did not just elect her, they adored her: In 2011, as Montreal and Toronto began to turn dramatically against their own chief executives, a poll found Hazel McCallion to be the most popular mayor in Canada. And now, with Mayor McCallion finally retired at the age of 93, the people of Mississauga have elected her chosen successor. Bonnie Crombie was 18 when her predecessor was elected mayor of the 260,000 people in the rural suburb of Mississauga. Now, the former Liberal MP and Mississauga city councilor is taking control of a budding metropolis of nearly 800,000." Bonnie Crombie elected new mayor of Mississauga by Dakshana Bascaramurty and Josh O'Kane, Mississauga - The Globe and Mail. Published Monday, Oct. 27 2014, 11:00 pm EDT. "After securing the support of long-time mayor and political legend Hazel McCallion - the most valuable endorsement in town - Bonnie Crombie rose to victory in Mississauga on Monday night, becoming the city's next mayor. The former Liberal MP and Ward 5 councillor won with an overwhelming 64 per cent of the votes ..."
Bonnie Crombie wins Mississauga mayoral election by Nicholas Keung, Immigration reporter, Toronto Star, Published on Mon Oct 27 2014. 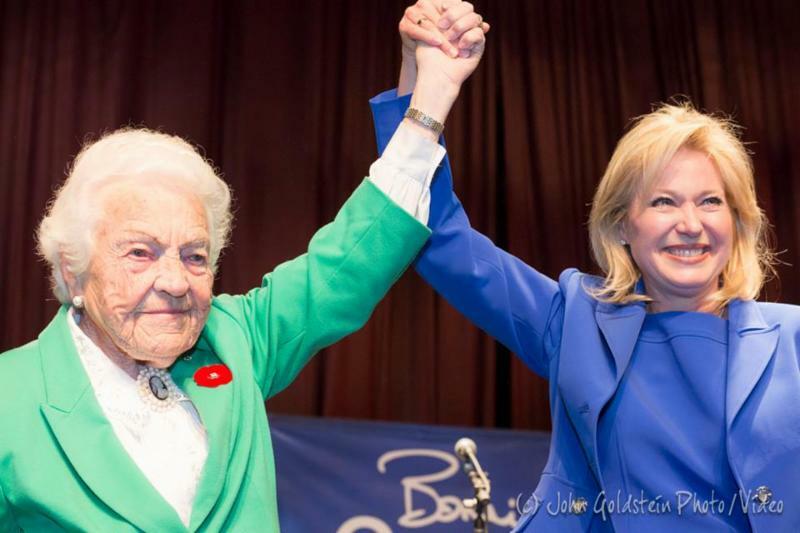 "As Hazel McCallion departs, Bonnie Crombie is elected mayor of Mississauga. [Photo by Bernard Weil, Toronto Star] Outgoing Mayor Hazel McCallion came to congratulate Bonnie Crombie on her win at the Pope John Paul II Polish Cultural Centre." McCallion memoir mirrors Mississauga's first 40 years by Joseph Chin, Mississauga News, Oct. 27, 2014. Includes Torstar photo of Hazel and Sam, "Mississauga's longtime mayor Hazel McCallion, here with late husband Sam, has penned her memoirs." Mississauga's 93-year-old 'Hurricane' Hazel readies her exit from Canada.com / o.canada.com. Published 27 Oct. 2014. Mississauga Mayor Hazel McCallion seen on Wednesday March 5, 2014. The 12-term mayor is retiring this year at age 93. Photo by Peter J. Thompson/National Post. "After almost four decades Mississauga, Toronto's upstart neighbour, is emerging from under the eye of "Hurricane Hazel." Mayor Hazel McCallion, 93, stepping back from politics after 12 terms in office, earned that moniker by overseeing the city's transformation into one of Canada's largest municipalities ..."
To no one's surprise, the new ward 9 councillor, elected in October 1973, was the former mayor of Streetsville. Five years later, she would become mayor of the City she fought so valiantly to keep from coming into existence. And she remains the burr under the saddle of regional government to this day. McCallion lost the fight for survival of Streetsville but in the process she showed the citizens of the 'victor' municipality that they could find no better champion for the collective communal values they embraced. Who says history doesn't have a sense of humour?" Mayor Hazel McCallion Preaching from Church Pulpit - Vote B.C.. YouTube video, 17:19 min. "On Oct. 26, 2014, The Lakeview Baptist/Community Church had its 75th Anniversary. Hazel McCallion, soon to be Ex-Mayor of Mississauga, came to speak, present the 75th certification (she has also done the 65th & the 70th) ... This recording is of Hazel's speech from the pulpit - it is pure Hazel and oh yes, Vote for Bonnie Crombie." Exclusive excerpt: How sexism helped turn tide for Hazel McCallion by Hazel McCallion, Toronto Star - News, Insight, Oct. 24, 2014. Excerpted from Hurricane Hazel: A Life With Purpose © 2014 by Hazel McCallion and Robert Brehl. Published by HarperCollins Canada. All rights reserved. From farmland to metropolis: How 'Hurricane Hazel' made her mark as Mississauga mayor by W5, CTV, available on CTVNews.ca., 24 Oct. 2014. "... Hazel Mary Muriel Journeaux was born on Valentine's Day, 1921, in Port Daniel on Quebec's Gaspé coast. There was little money in the family of five children. She left home as a teenager to attend high school, and then business school in Montreal. While there, she found an unusual, in fact for the time, almost unheard of way to earn some money. There was a three team professional women's hockey league in Quebec at the time, sponsored by the soft drink company, Quick Cola. McCallion grew up playing the sport back on the Gaspe coast. She was, in her own words, small but very fast. She tried out for one of the teams, and made it. Five bucks a game. 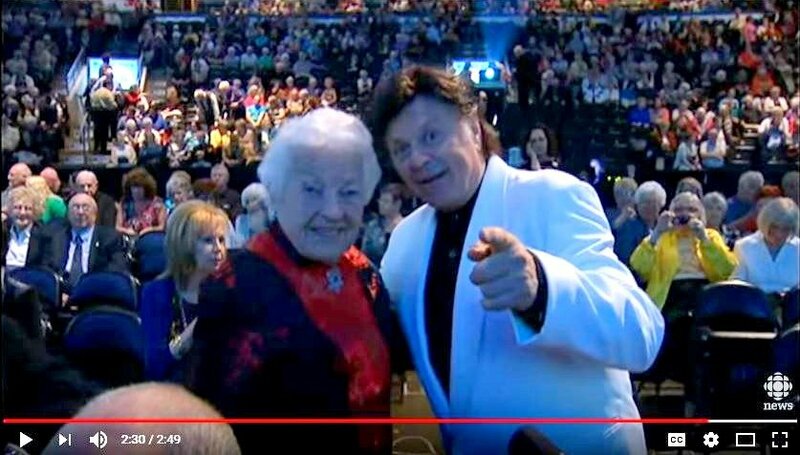 Not bad money in war time Quebec ..."
John Tory gets a major endorsement from Hazel McCallion by David Shum, Global News, 24 Oct. 2014. See also Mississauga's McCallion backs John Tory as Toronto election nears by Ann Hui, Globe and Mail, Oct. 24 2014. Residents fawn over Hazel at farewell celebration by Jason Spencer, Mississauga News, 20 Oct. 2014. "The Queen of Mississauga had the opportunity to say goodbye to her loyal subjects Sunday (Oct. 19) at the Living Arts Centre for the Salute to Hazel: A Community Tribute event." October 19, 2014. Photo by I Lee. Flash Mob Farewell for 93 year old Mayor Hazel McCallion. YouTube video, 4:06 min. Published on Oct 22, 2014 by Erin Mills Town Centre. Flash Mob Farewell for 93 year old Mayor Hazel McCallion at Erin Mills Town Centre. Don't Cry For Me Mississauga (Special Tribute to Hazel McCallion) - Elise Mariah. YouTube video, 5:41 min. Celebrating 40 years of Mississauga. As the city marks its 40th birthday, Mississauga News takes a look at its past, present and future. Salute to Hazel: A Community Tribute. Free Public Event to Thank Mayor McCallion at Living Arts Centre. 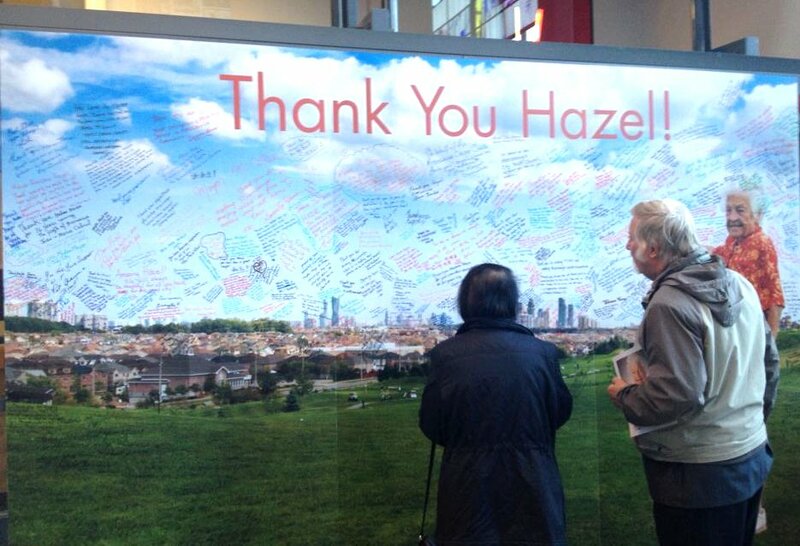 Salute to Hazel: A Community Tribute. Photography by Mike Douglas. (Sorry, link no longer works). Sunday, October 19, 2014 "... the Living Arts Centre hosted Salute to Hazel: A Community Tribute as a last 'hurrah' for Hurricane Hazel. The day featured tributes from different organizations, a meet and greet with residents in attendance and a beautiful tribute concert by the Mississauga Symphony Youth Orchestra with the Scottish Regiment Band as the opening act. Editor Mike Douglas attended the event which saw an afternoon of heartfelt testimonials, thanking Mayor McCallion for her wonderful 36 years of service to the City of Mississauga. The event was hosted by Master of Ceremonies Jake Dheer, Rogers TV Regional Director." ● Residents fawn over Hazel at farewell celebration by Jason Spencer, Mississauga News, Oct 20, 2014. The Toronto Scottish Regiment (Queen Elizabeth the Queen Mother's Own). YouTube video, 1:45 min.Published on Nov 5, 2014. Performance by the Toronto Scottish Regiment (Queen Elizabeth the Queen Mother's Own) at Salute to Hazel 1978-2014: A community Tribute, Hammerson Hall, Living Arts Centre, Sunday, October 19, 2014. Unforgettable - Surprise Dedication to Mayor Hazel McCallion by Elise Mariah. YouTube video, 2:07 min. Published on Nov 5, 2014. Salute to Hazel - A Community Tribute at Living Arts Centre to thank Mayor Hazel McCallion, City of Mississauga Mayor for her 36 years of service, from 1978 to 2014. Mississauga resident Elise Mariah has won several awards including the audience favorite at "Singfest" in Mississauga Celebration Square. 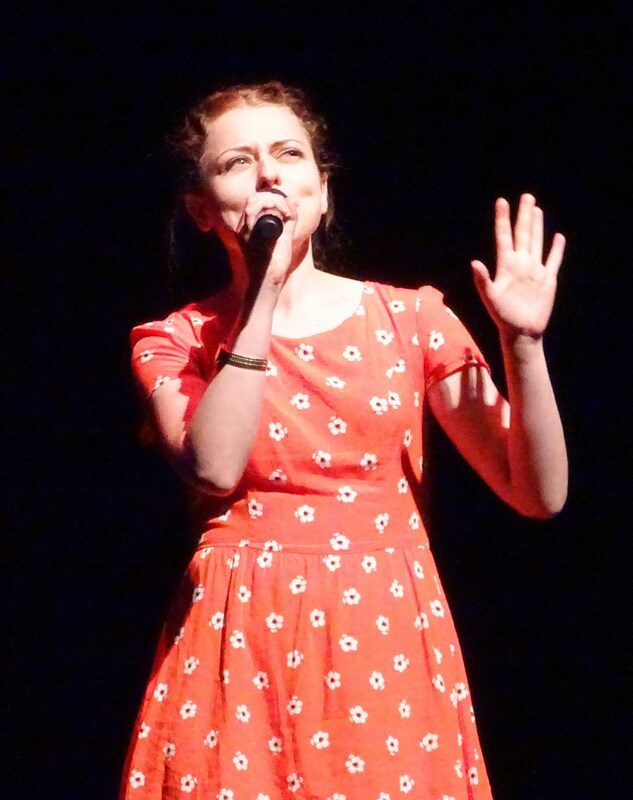 She has also been chosen for Talent Nation, a showcase featuring Toronto's top emerging artists. Elise Mariah's true love is music, playing the piano, singing, writing, composing and recording. Culture Philippines of Ontario performs at Salute to Hazel event, Living Arts Centre. YouTube video, 3:14 min. Published on Nov 6, 2014. 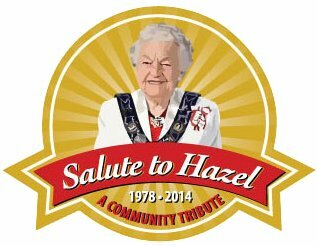 Salute to Hazel: A Community Tribute to thank Hazel McCallion for her 36 years of service (1987-2014) as Mayor of Mississauga. Event held at the Living Arts Centre, Hammerson Hall, October 19, 2014. 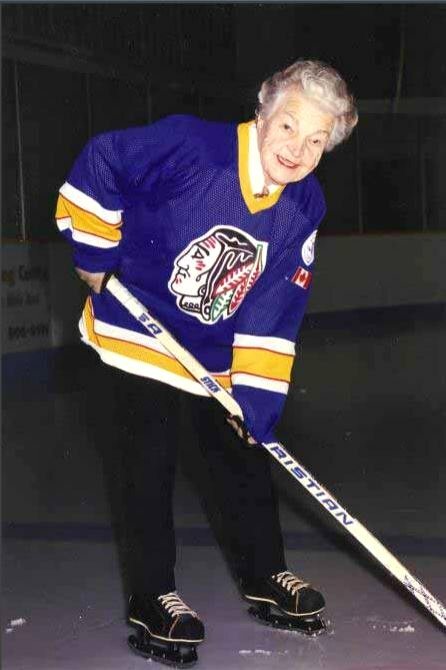 Mississauga Minor Hockey Tribute to Hazel McCallion, Mississauga's Mayor for 36 Years, 1978-2014 in PDF, 124 pages, includes numerous photos provided by Friends of Minor Hockey in Mississauga. Hurricane Hazel - 60 Years Later (October 1954 - October 2014) produced by Toronto and Region Conservatiion and ThinData, with funding from Conservation Ontario. Preview film: Hazel's Legacy: A Hurricane That Changed Our Landscape Forever. "On October 15 and 16, 1954, Hurricane Hazel struck the Toronto area with a devastating reminder of the power of nature. By the storm's end, more than 285 millimetres (11 inches) of rain fell on the already sodden ground, causing some of the most severe flooding in Canada's history. In its aftermath, 81 people died and over 4,000 families were left homeless in Ontario. The total cost of the destruction in Canada was estimated at $100 million, the equivalent of about one billion dollars today." Due to its destruction, the name "Hazel" as a hurricane has been retired. 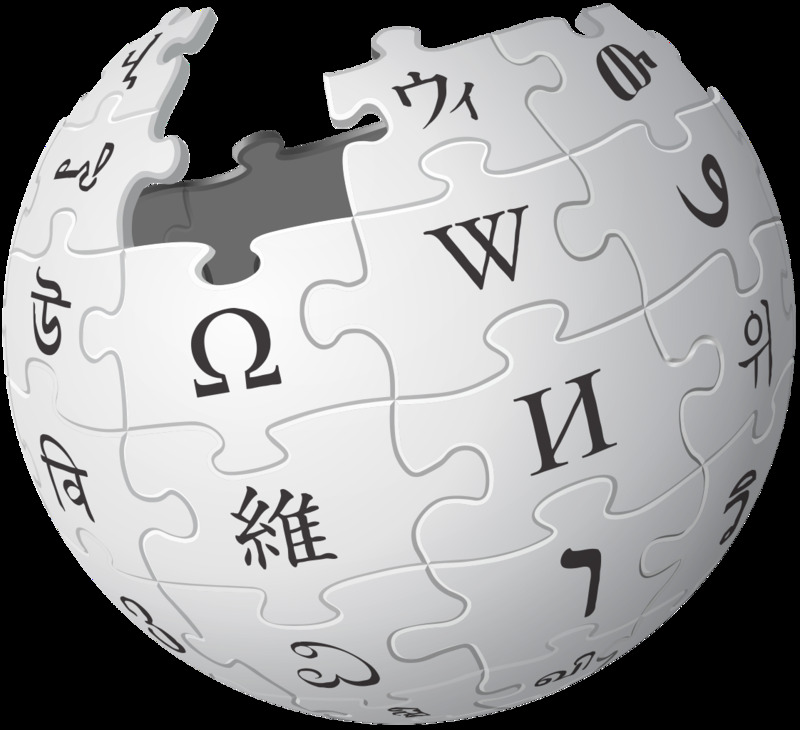 See: List of retired Atlantic hurricane names from Wikipedia. Hazel McCallion: this hurricane isn't about to slow down. What it was like to rise to the top in a man's world, and other candid comments from Mississauga's longtime mayor. Article by San Grewal, Urban Affairs Reporter. Published on Oct 13 2014. "A few weeks before she officially steps down after 36 years on the job, Mississauga Mayor Hazel McCallion sat down with the Star to talk about the city she's built, working in a man's world, what she wishes she'd done differently - and what the future holds for this 93-year-old." Chatting with Mississauga mayor Hazel McCallion before her retirement. What it was like to rise to the top in a man's world, and other candid comments from Mississauga's longtime mayor. Article by Staff, Torstar News Service. Published on Oct 13 2014 by MetroNews. Hazel McCallion talks about Bonnie Crombie's Platform. YouTube video, 0.52 min. Published on 12 Oct 2014. "I say to you, look at the programs ... of the chief candidates that are running, and I have every confidence that when you review it, you will vote for Bonnie Crombie. As I say I think you know me well - I say it the way it is. Not politically. I'm saying it because of my experience working with her. I leave it up to you. I say to the young people: Bonnie is young and ambitious and she works hard and she's got some new ideas and I hope these new ideas will come forward..."
But Italians were just one of countless groups who came to Canada and settled in Mississauga. Though the city's official crest still references the British, the Mississaugas of the New Credit and farming, decades of immigration have pushed Mississauga far from these roots to become an urban core where more than 40 languages are spoken daily." Mississauga turns over a new leaf with new logo by Joseph Chin, Mississauga News, Oct. 10, 2014. Special series: Celebrating 40 years of Mississauga. "David Ferreira, Mississauga's brand manager: 'Cities are constantly growing and changing. It's important to periodically review, validate and if necessary update a city's brand and visual identity to ensure that we are accurately communicating and promoting the city's story ... Today, we have a new Mississauga logo that communicates our compelling story of being a young, modern, open and vibrant city on the cusp of something big.' The new, more abstract logo, which incorporates an M and sharp angles suggesting dynamism, was designed by city staff. The logo was approved by council in March ." 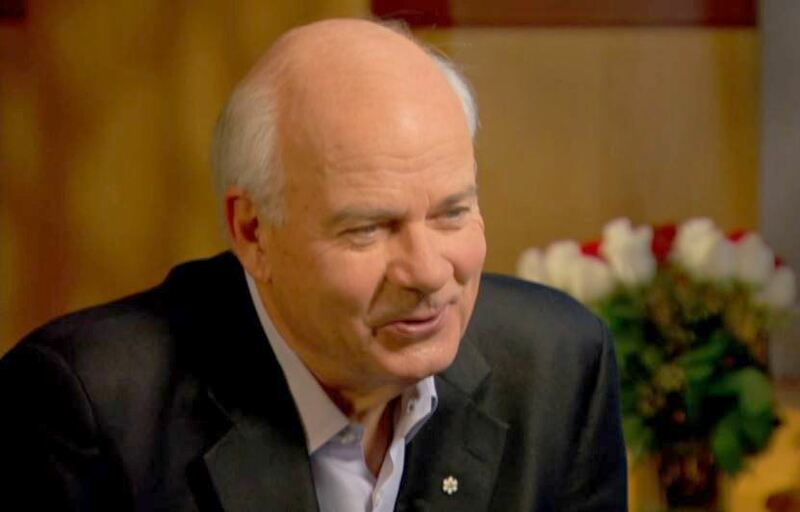 Hazel McCallion: Mansbridge One on One. CBC video, 22:34 min. October 5, 2014, Season 16, Episode 5. "She's spent five decades in municipal politics, 36 as the Mayor of Mississauga. Hazel McCallion sits down with Peter Mansbridge to discuss her storied career and her future endeavours as she prepares to step down later this month."